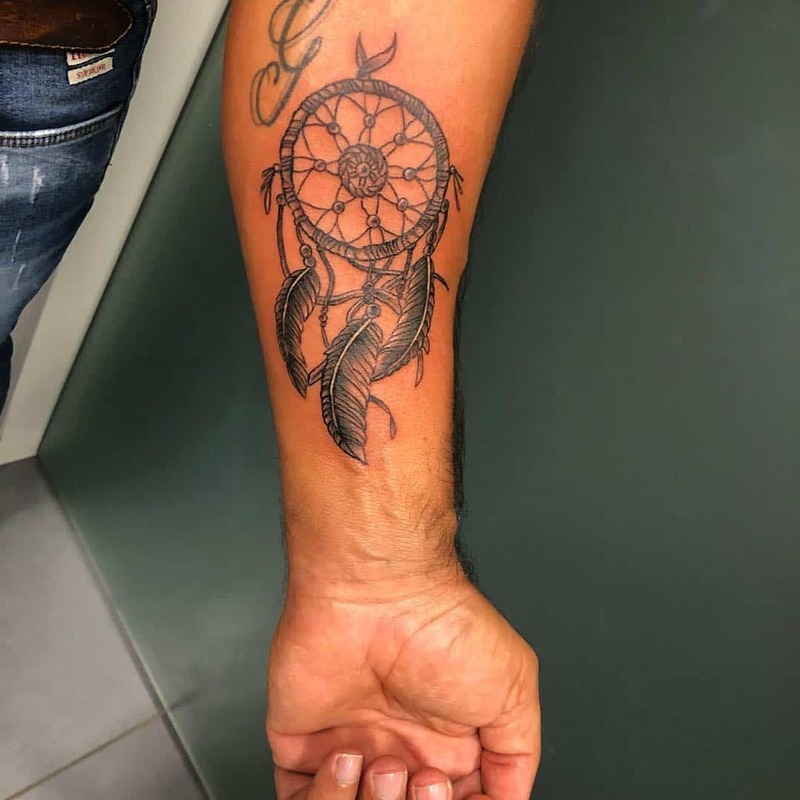 A dream catcher is a magical item that you can place above your bed and the idea is that it will catch any bad dreams so that you don’t have to experience them yourself. 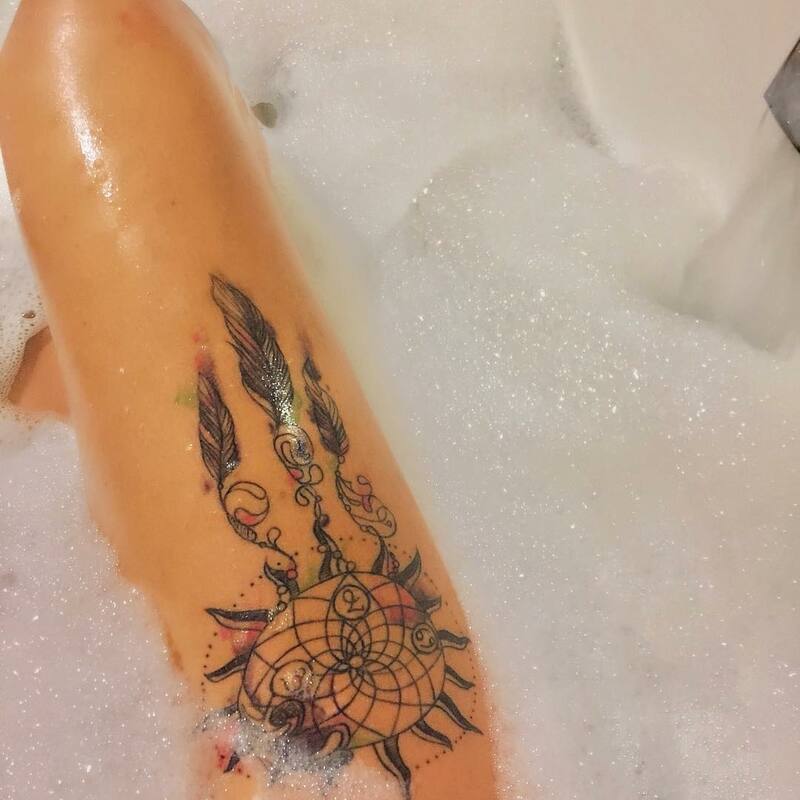 They consist of a willow hoop that contains netting or web with beads or feathers hanging from it. 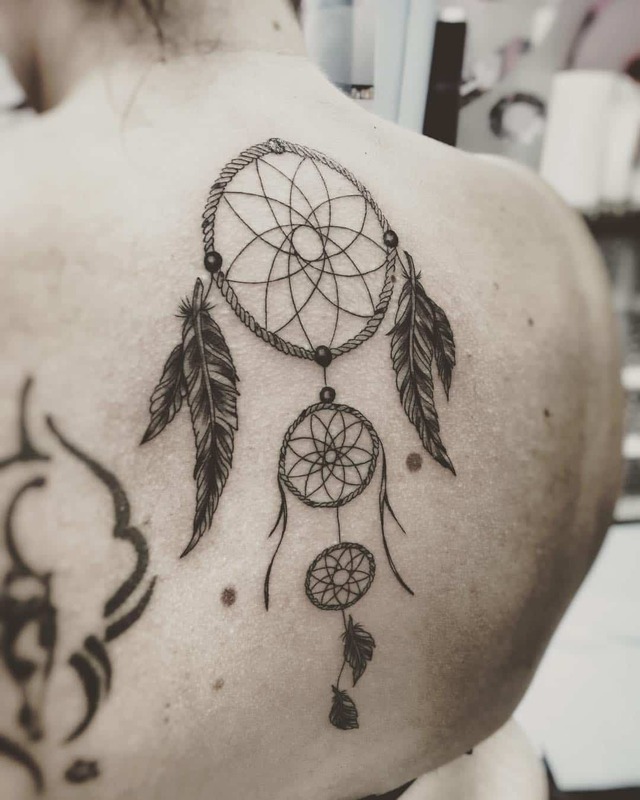 The good dreams are allowed to fall through the holes and land on the owner, while the bad dreams get tangled up in the web. 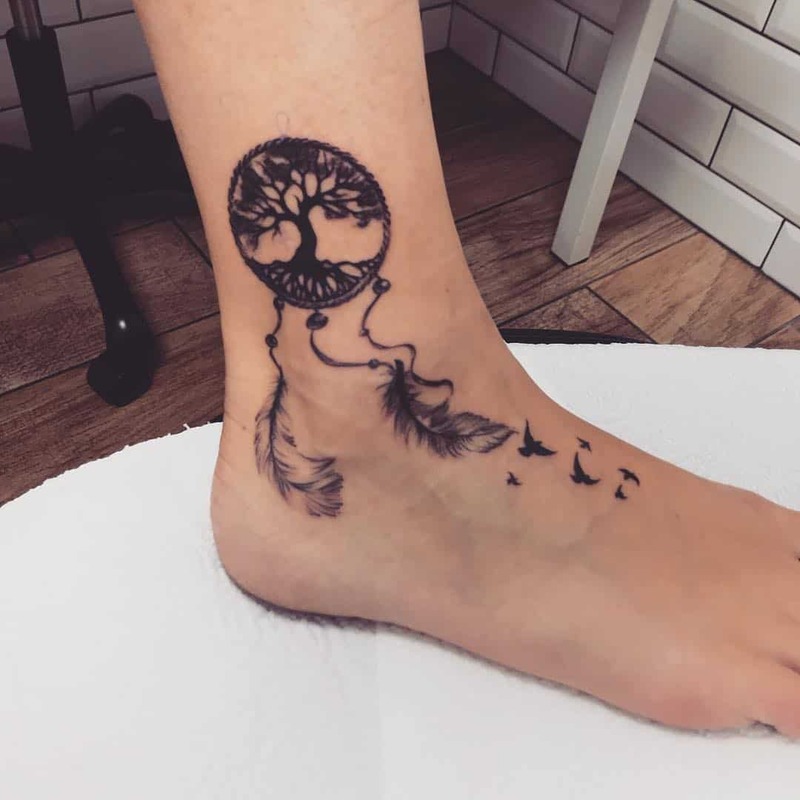 They are a popular tattoo idea because they are so pretty and magical looking. 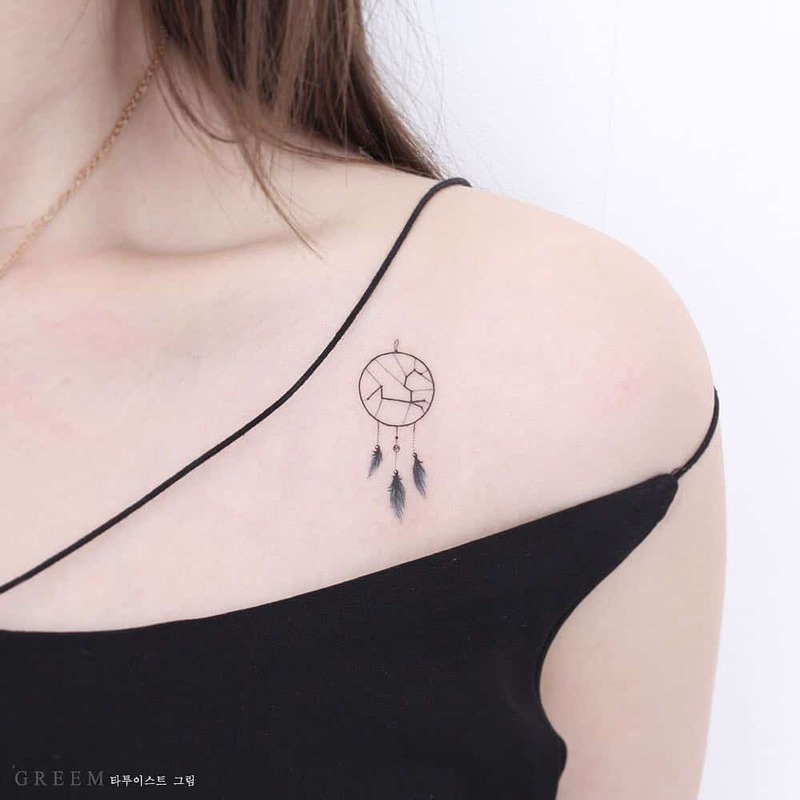 Many people will get it tattooed for the symbolic meaning behind it while others will just do it because it makes a good-looking tattoo. 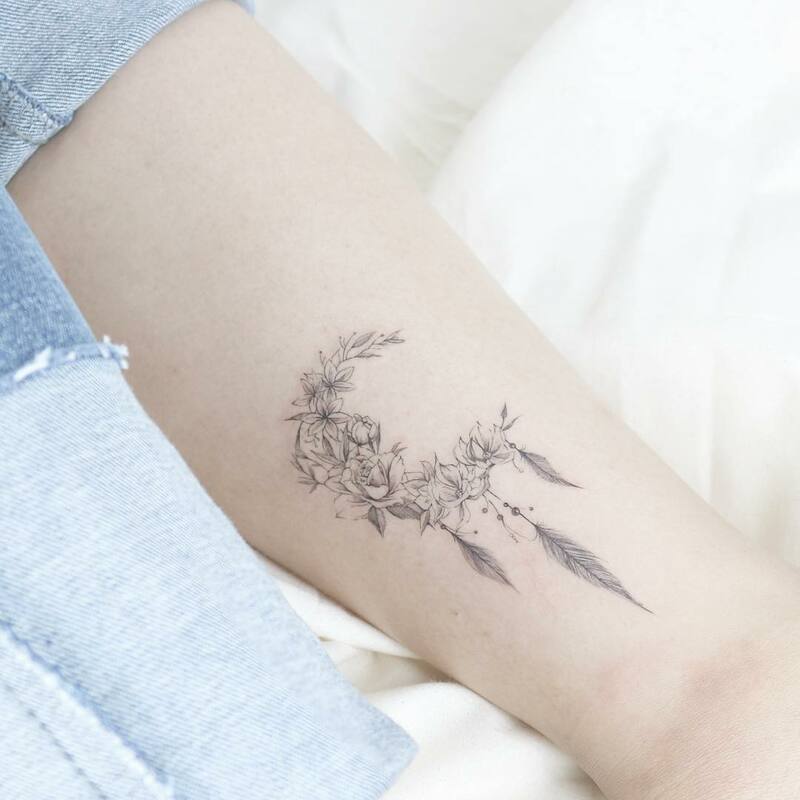 It’s one of those tattoos that are both magical and fashionable all at the same time. They are delicate and can be left small or you can get a large one. 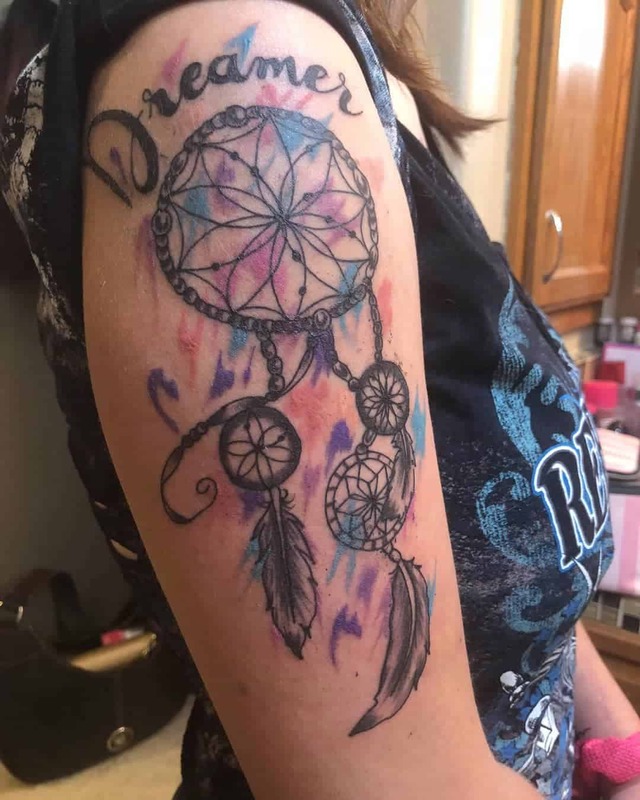 A popular area for dream catchers is on the arm. We just love the delicate jewelry on this style. 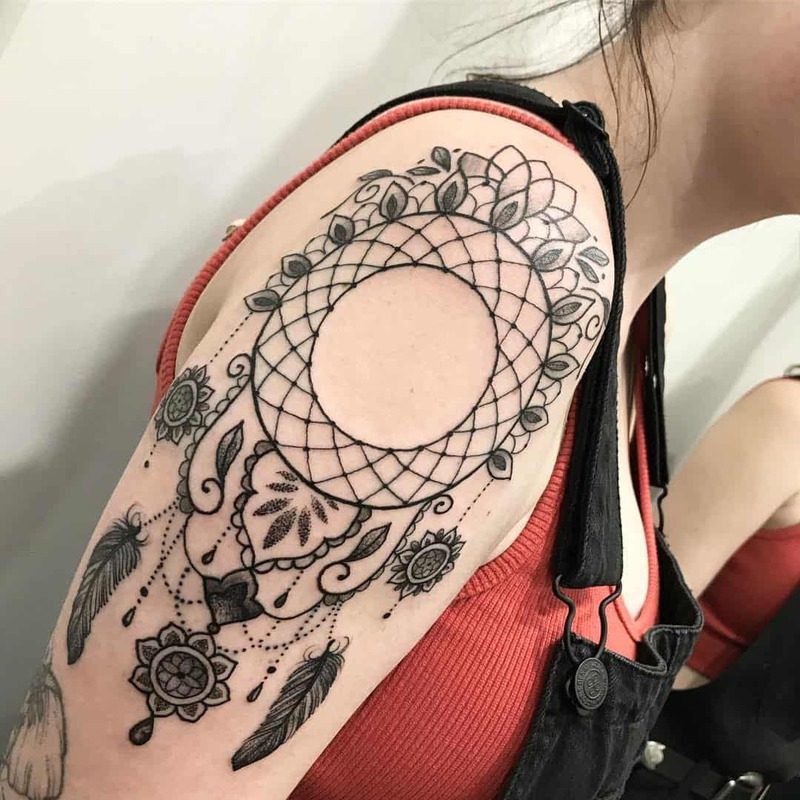 This flowing style is pretty and unique. 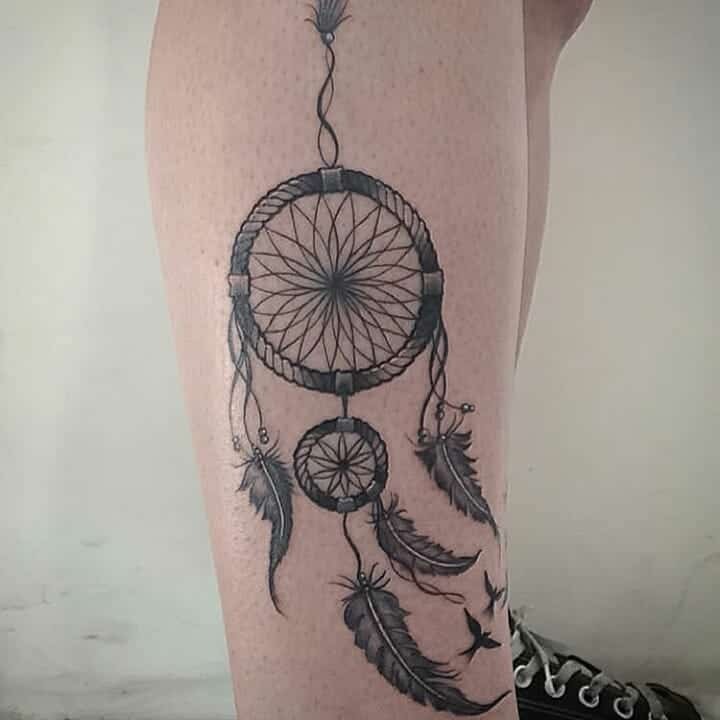 This is a great spot for a tattoo though it’s hard for you to check it out. 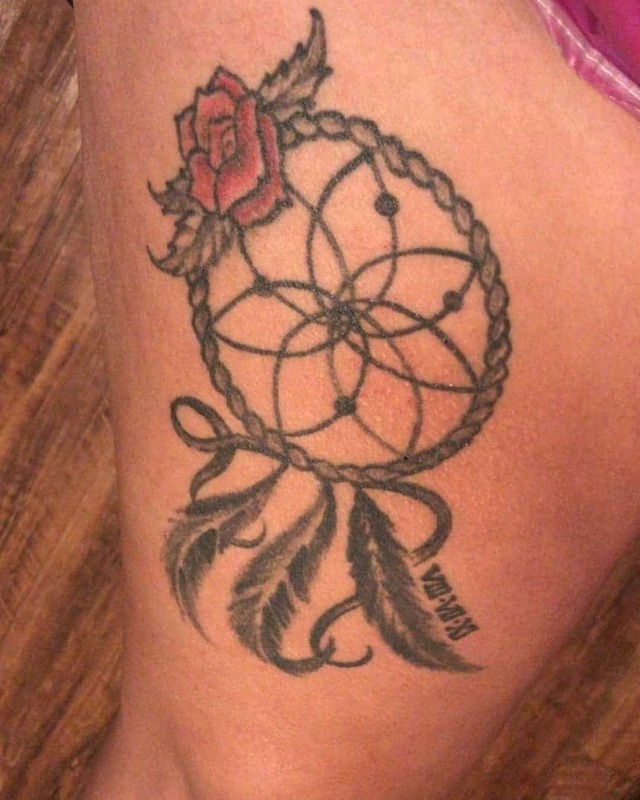 This cool dream catcher has the names of family members on the web. 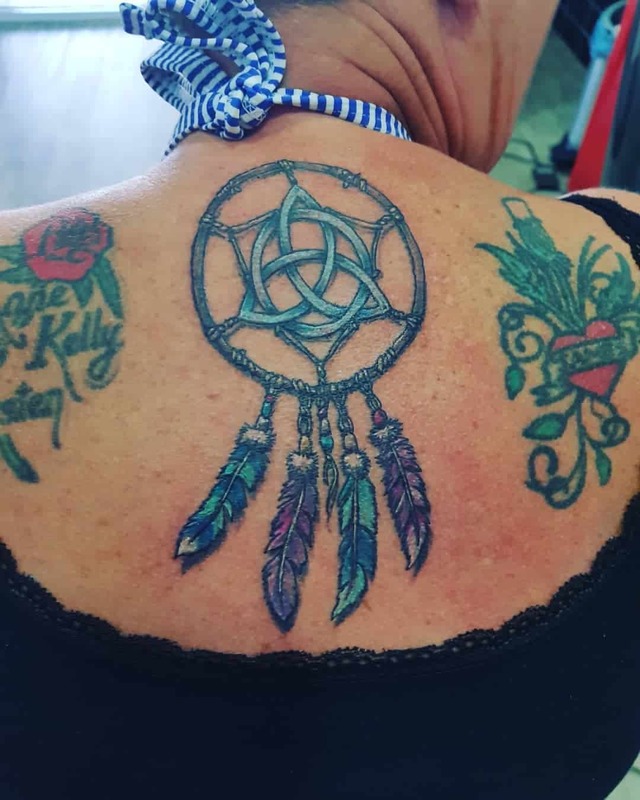 It’s a tattoo for sisters and they could all have the same one. 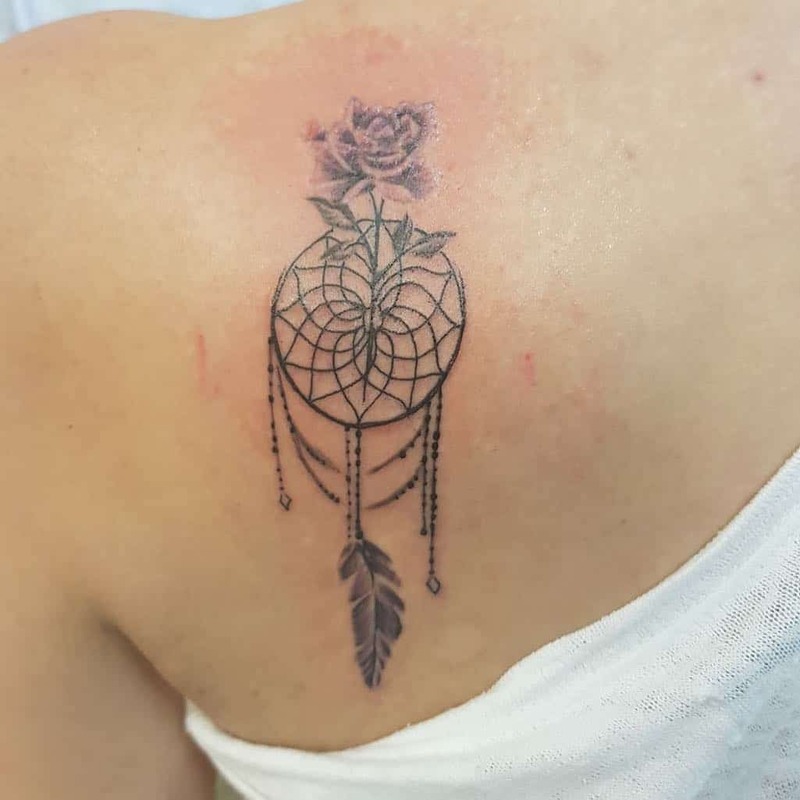 This amazing design not only is delicate and magical but it’s stunning as well thanks to the rose design attached. 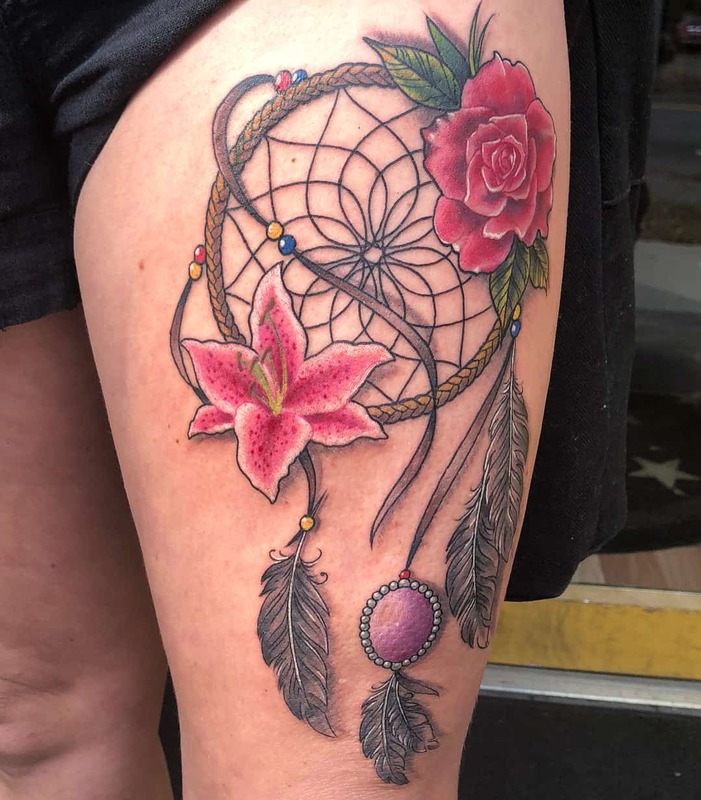 Flowers are a great feminine touch to add to a dream catcher tattoo. 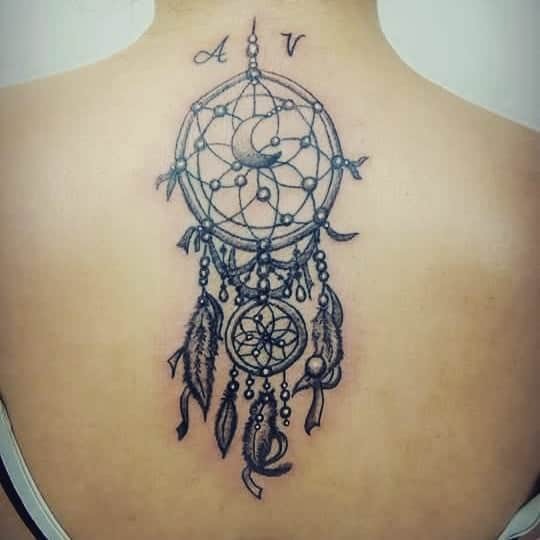 There is no black outline to this tattoo which gives it a soft appearance. 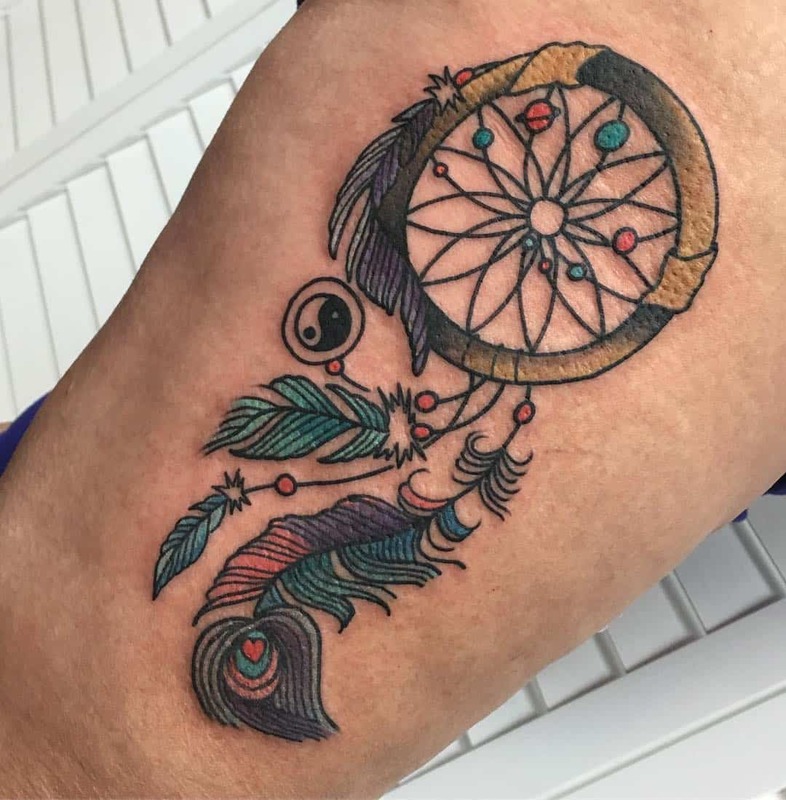 We love the colors in this pretty design. 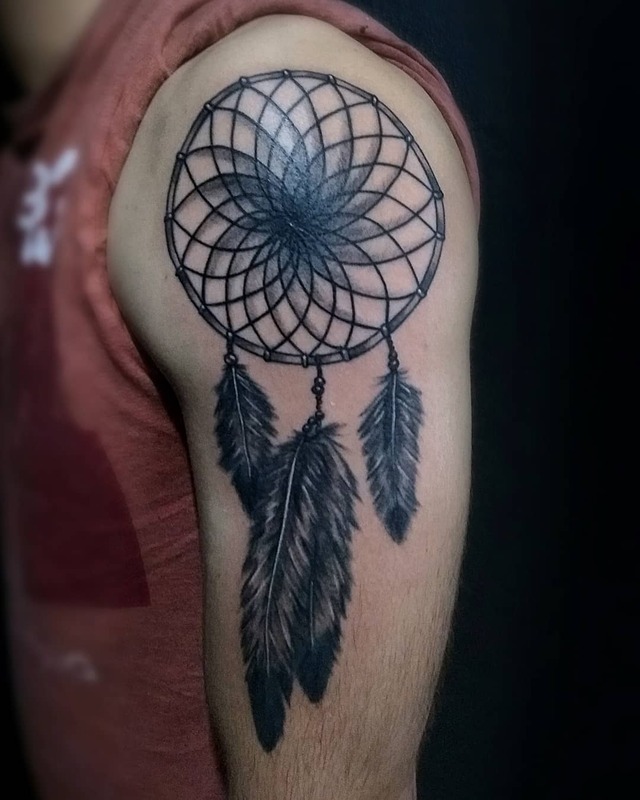 This is a very unique dream catcher because it’s in the shape of a moon instead of a circle. It gives you a unique look and it’s a rather striking design in black. 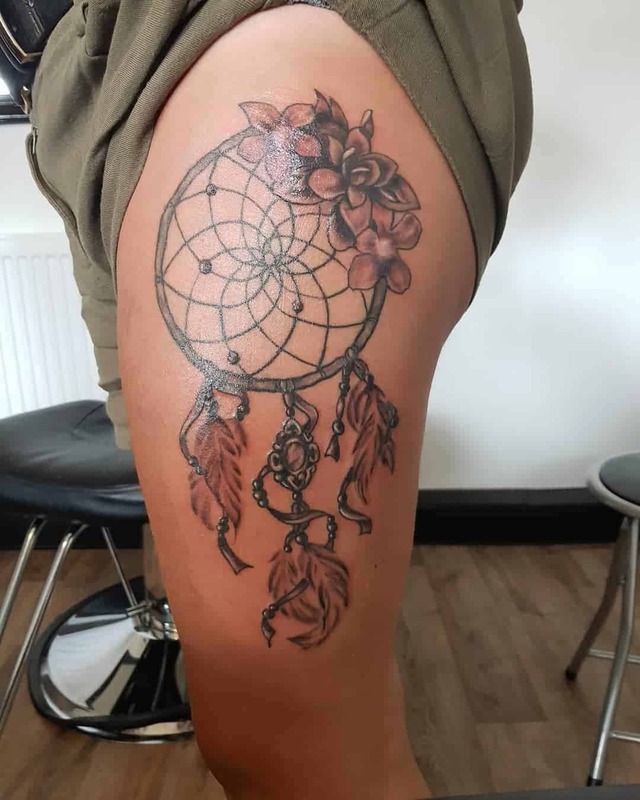 We love the fact that the flower is just blending in with the web of the dream catcher. It’s a unique way of having something different for your design. 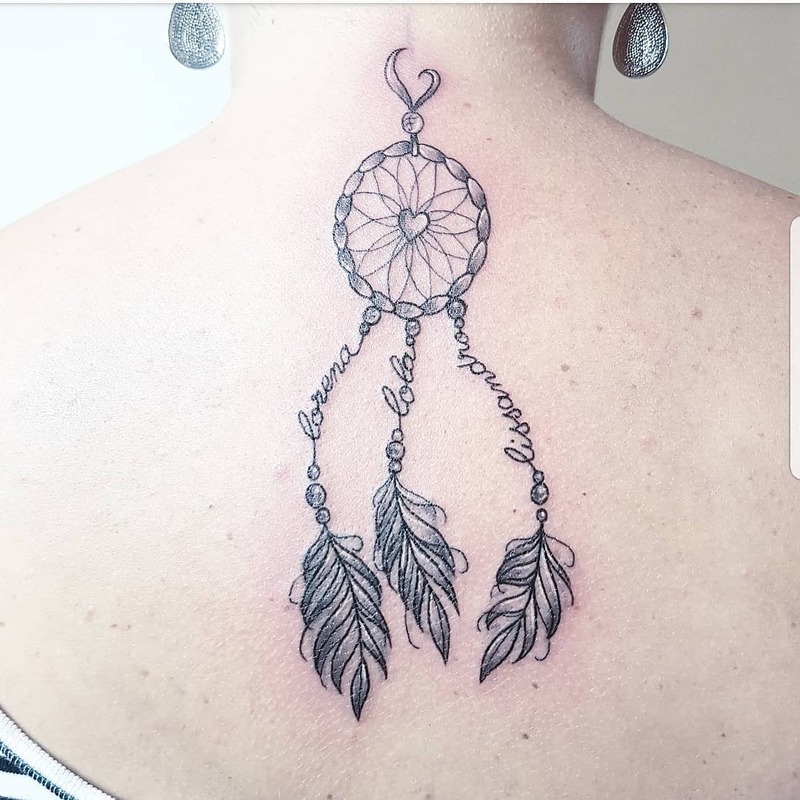 This is a stunning style that looks as if it is hanging from the back of the neck. It’s delicate and elegant and something that is sure to be admired the next time that you are at the beach. A great style that is small and one of a kind. 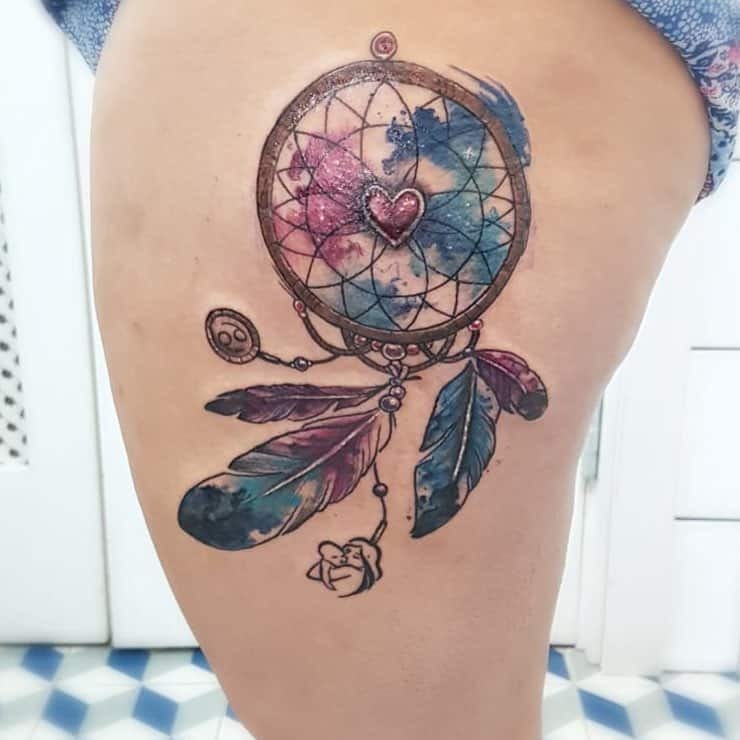 The dream catcher here is in the shape of a heart and you are sure to love it. 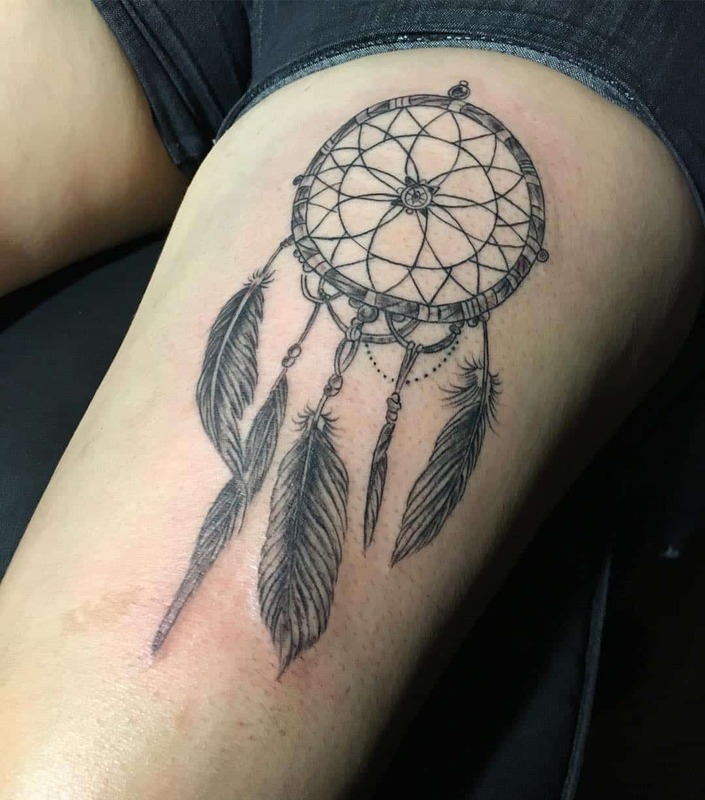 Another simple design that you are sure to love. 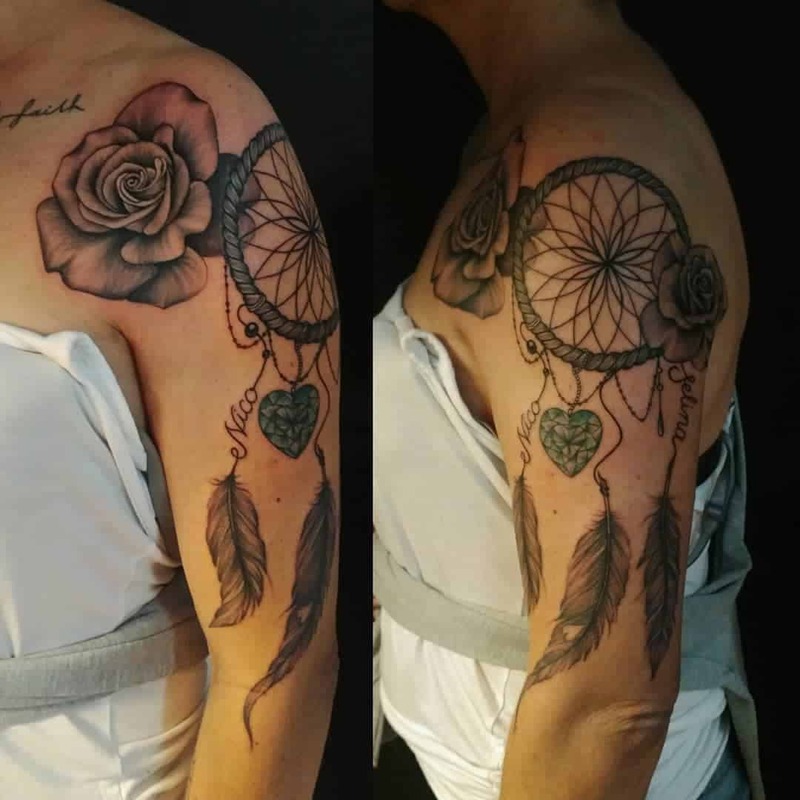 We have double roses in this breathtaking design. 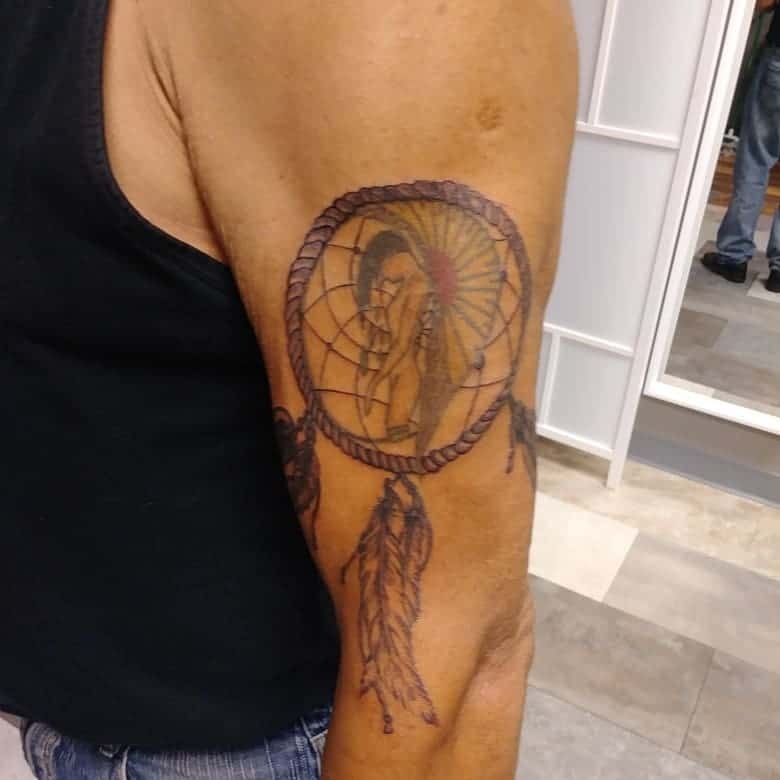 We get the dream catcher from the Native American Culture. 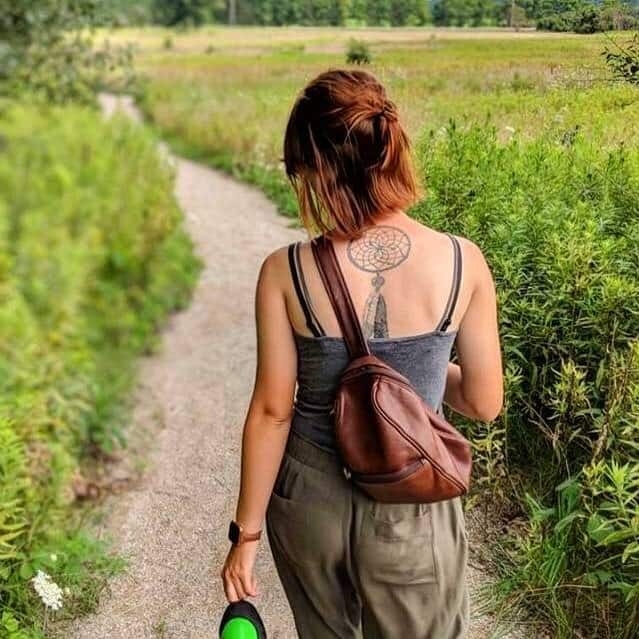 The first people to ever create the gorgeous design was the Anishinabe people. These people lived on the border of the Central United States and Southern Canada. The name of this particular native clan meant “original people” which is the way they thought of themselves. In America, they are known as the Chippewa people and in Canada, they are known as the Ojibwa people. 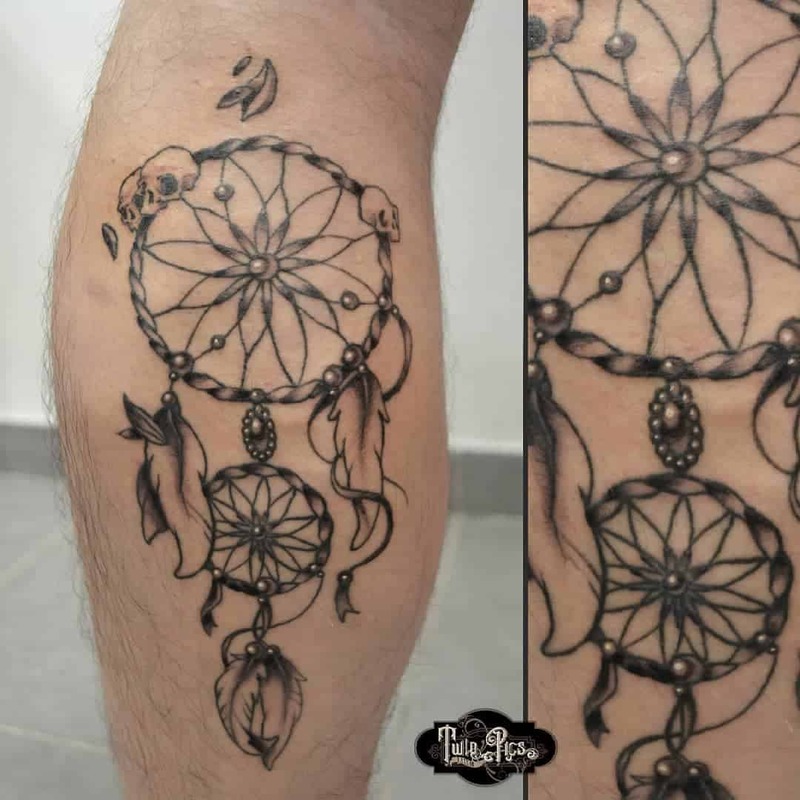 This is cool way of making the dream catcher a little different. 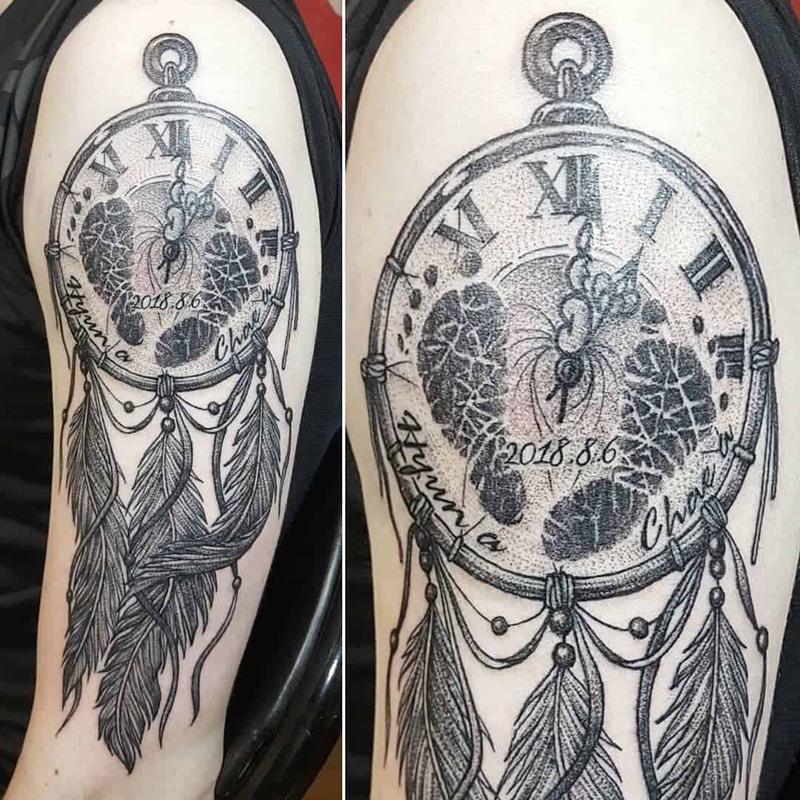 The inside of the dream catcher is in the form of a watch or timepiece. 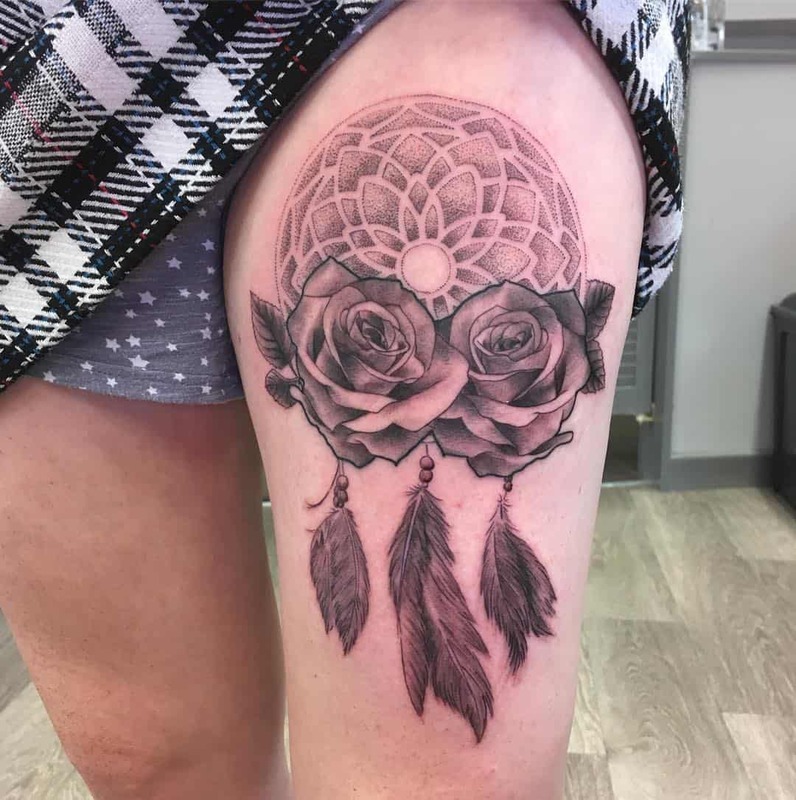 If you love cartoons, then you are sure to love this style. 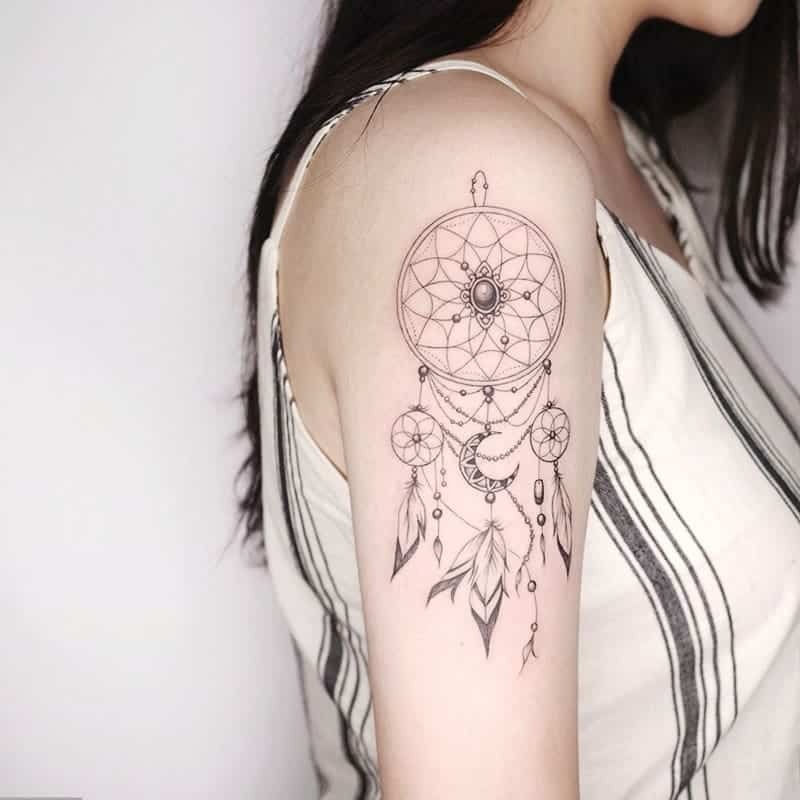 The shape of the dream catcher is Mickey Mouse and there are many cartoon elements hanging from it. We see characters or elements from Winnie the Pooh, The Nightmare Before Christmas, and Mary Poppins. 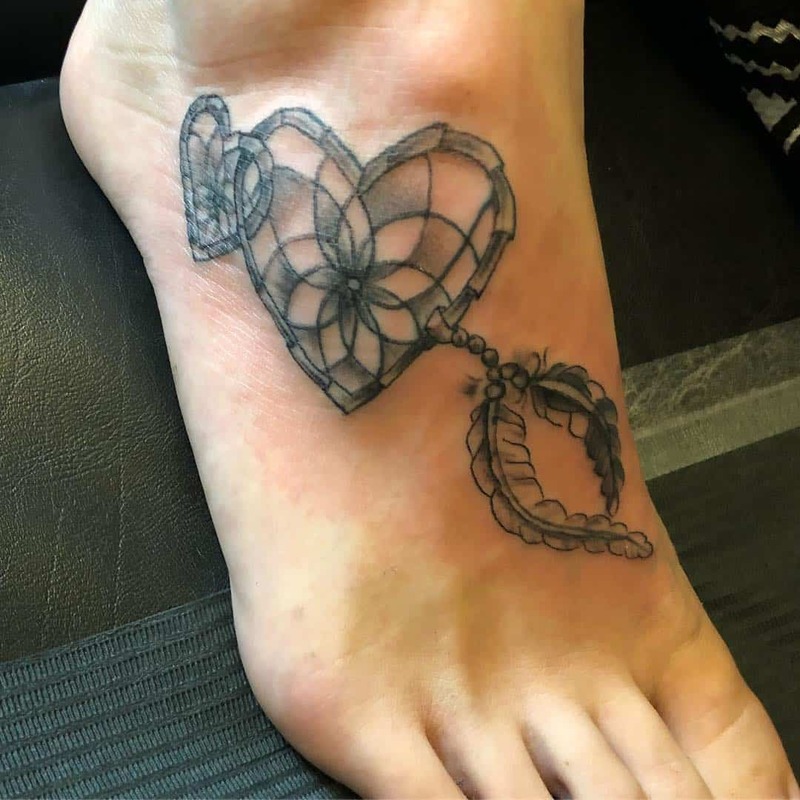 It’s a cool way of representing your love for your favorite characters. 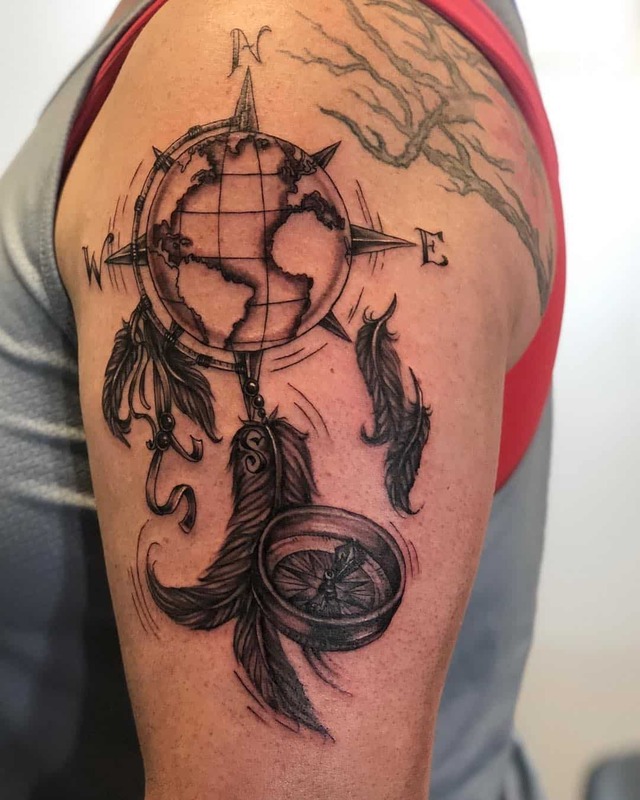 This is another cool image that has the inside of the dream catcher as earth. 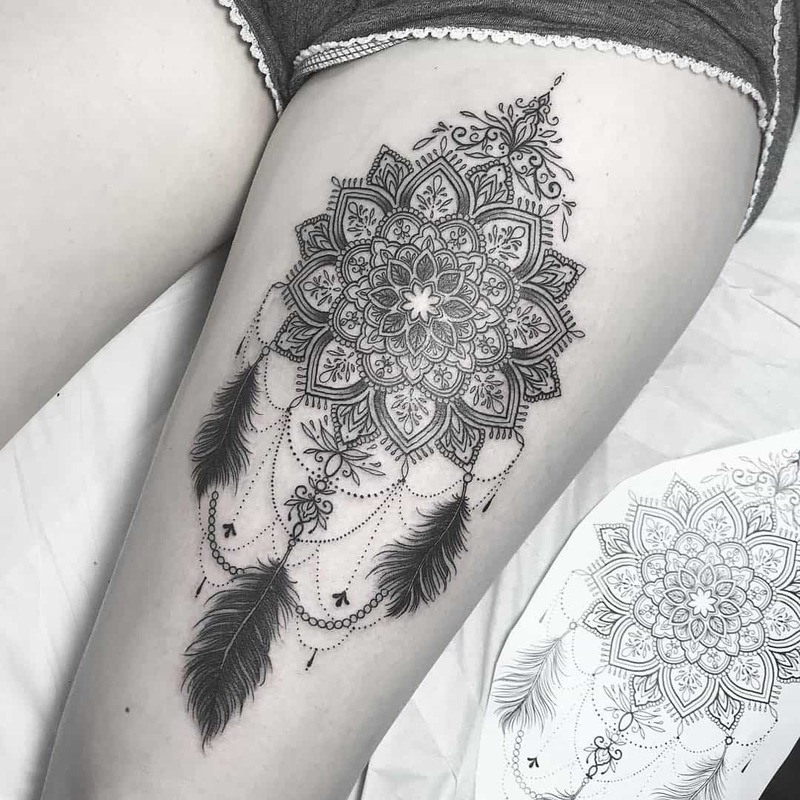 It’s a dark and detailed design that anyone would love. 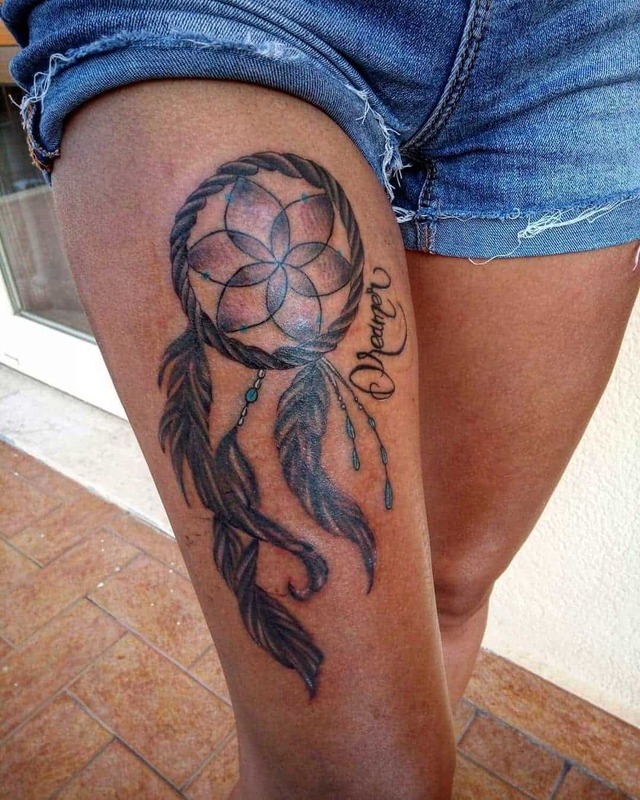 This is a very simple design with a cartoonish look. 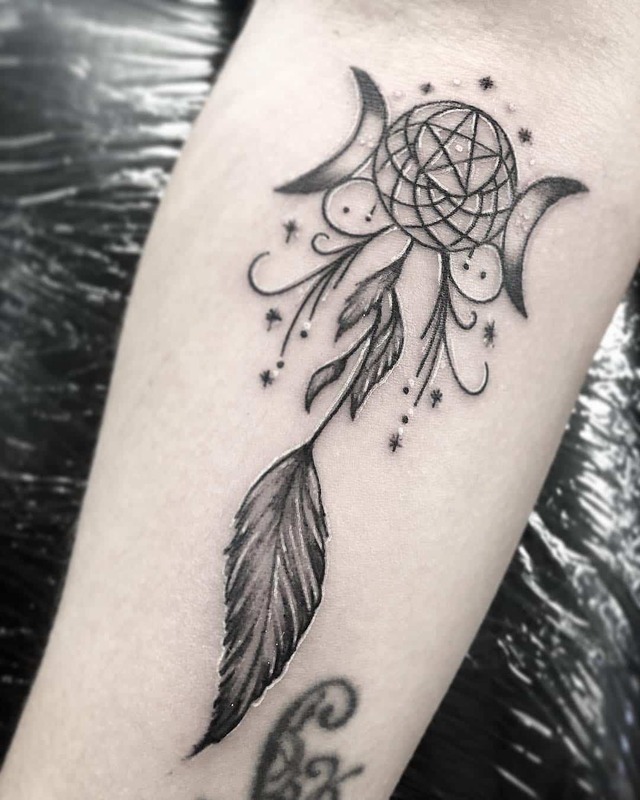 There are little galaxies that are caught up in the web of the dream catcher. 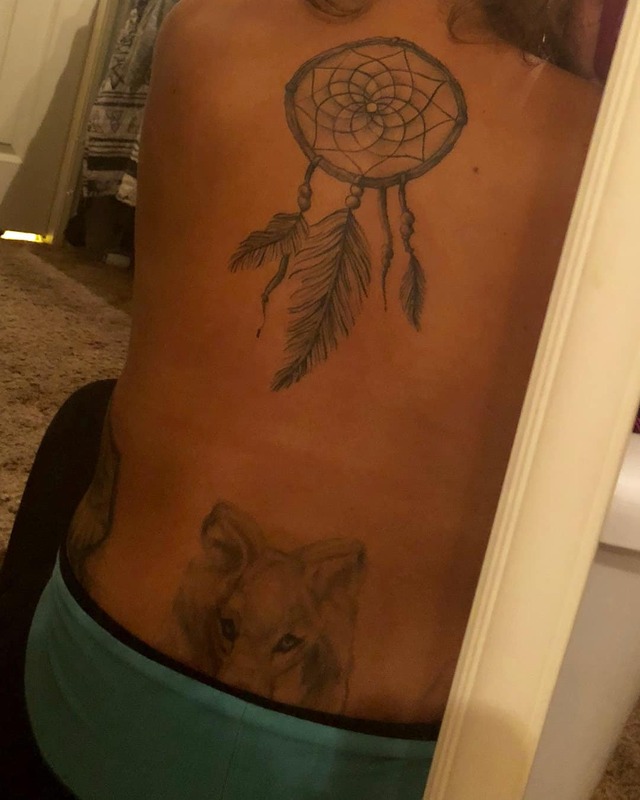 Dream catchers have a very interesting legend behind them. The Anishinabe people tell a story about a lady called the Spider Woman. She was a traveler who used to go around the world and visit newborn babies in their cradles. She was a powerful woman who could weave magical webs above the cradleboards. 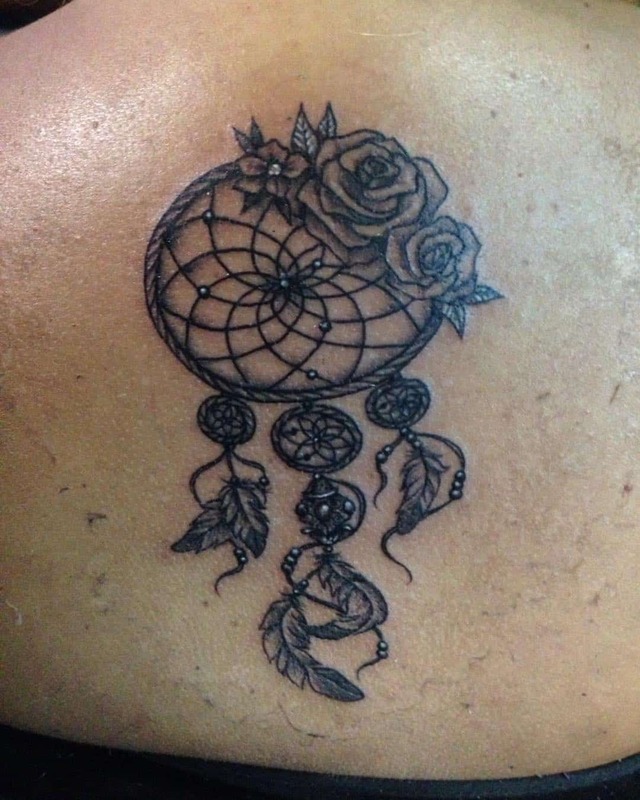 These webs were meant to protect the babies from bad dreams. 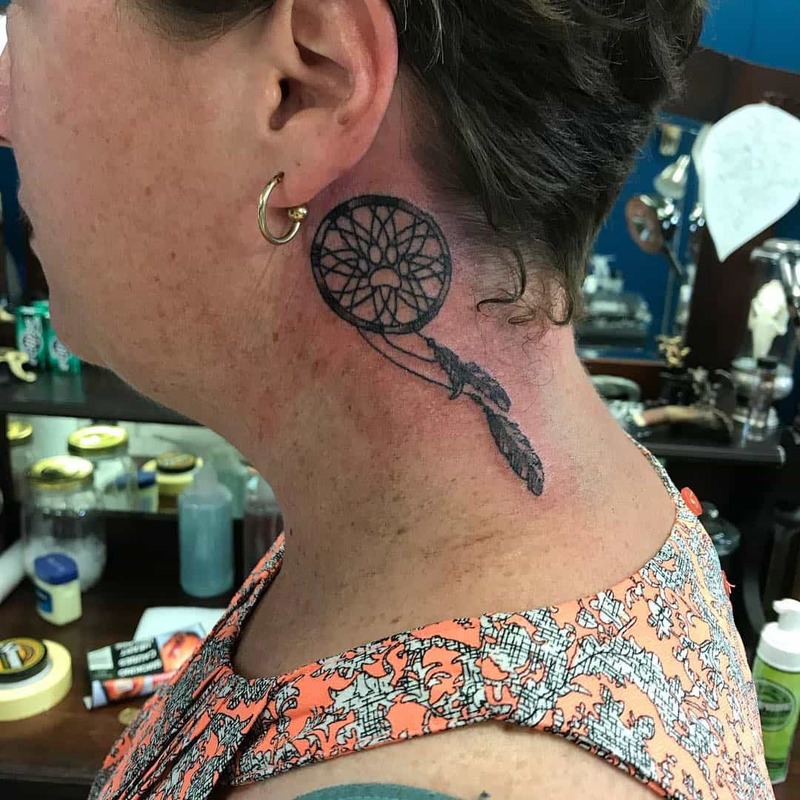 She only allowed them to have the good dreams that passed through the web. Of course, the tribes expanded and people migrated to different areas so it was much harder for the Spider Woman to reach all of the newborns in time. 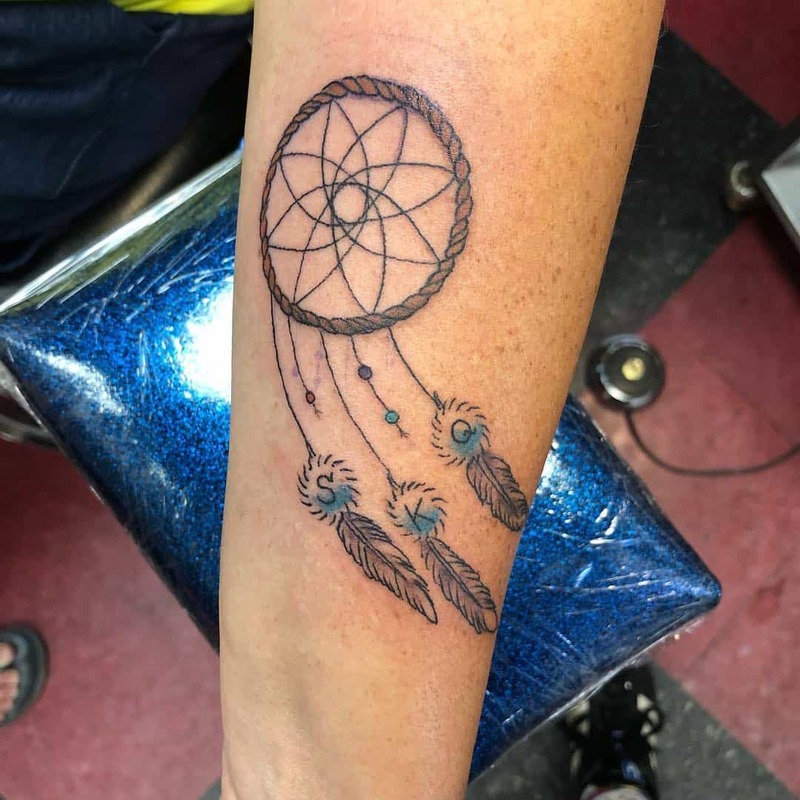 That was why other women in the tribe would take over and create the dream catchers so that the babies would always have protection. 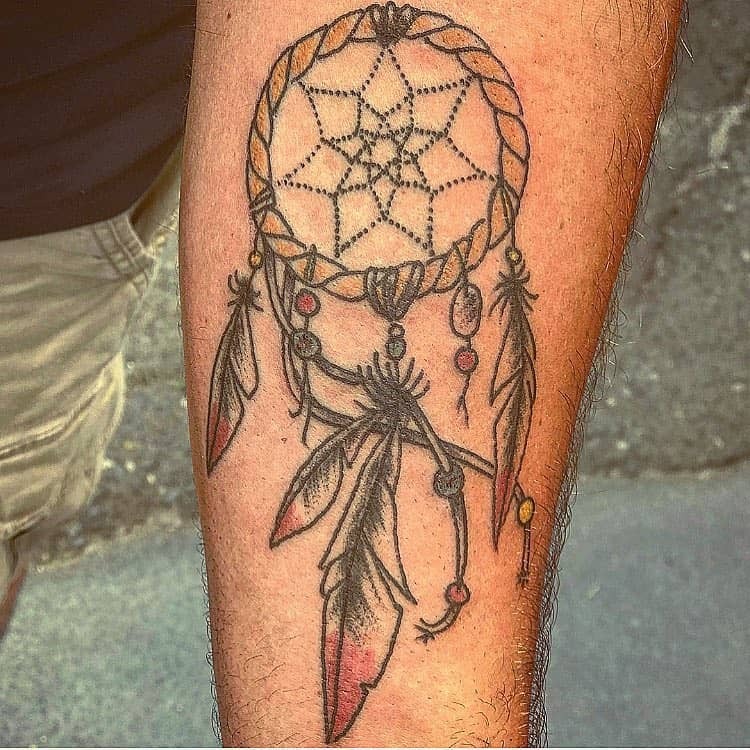 The dream catchers made by the women in the tribe didn’t last very long because they were made out of natural materials so they were constantly being replaced with new ones. 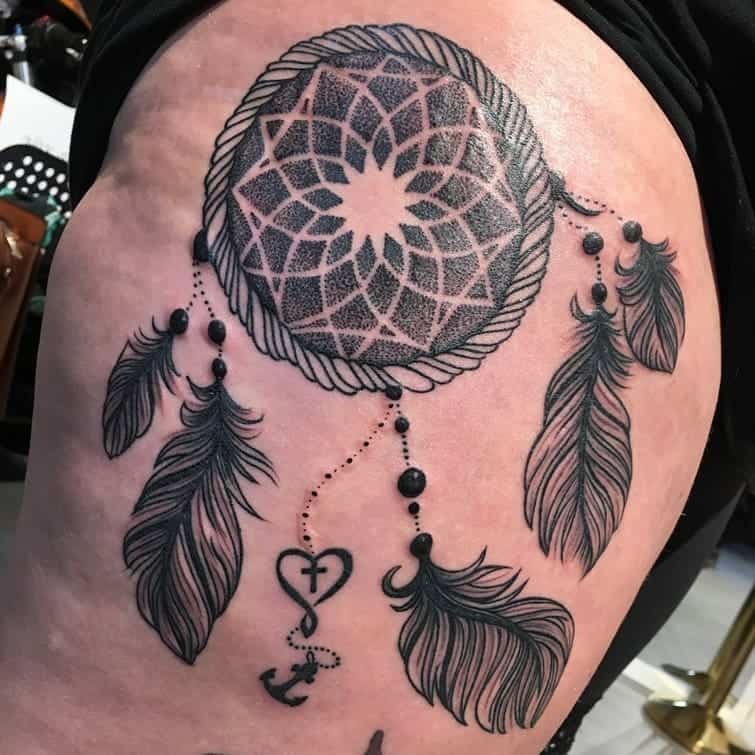 These dream catchers were meant to accompany the baby through to her next life cycle. 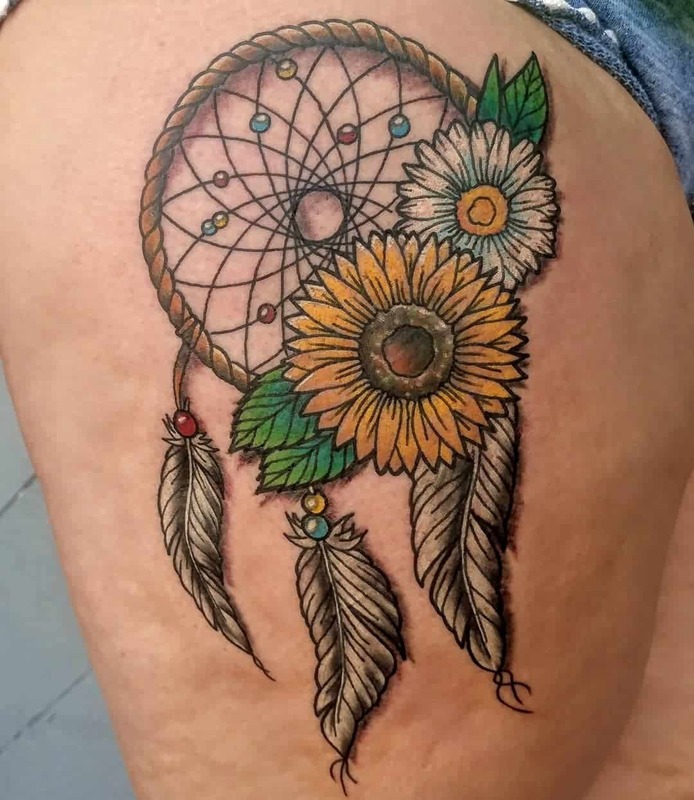 This stunning style has some amazing colors to it and we love how they don’t stay within the lines. 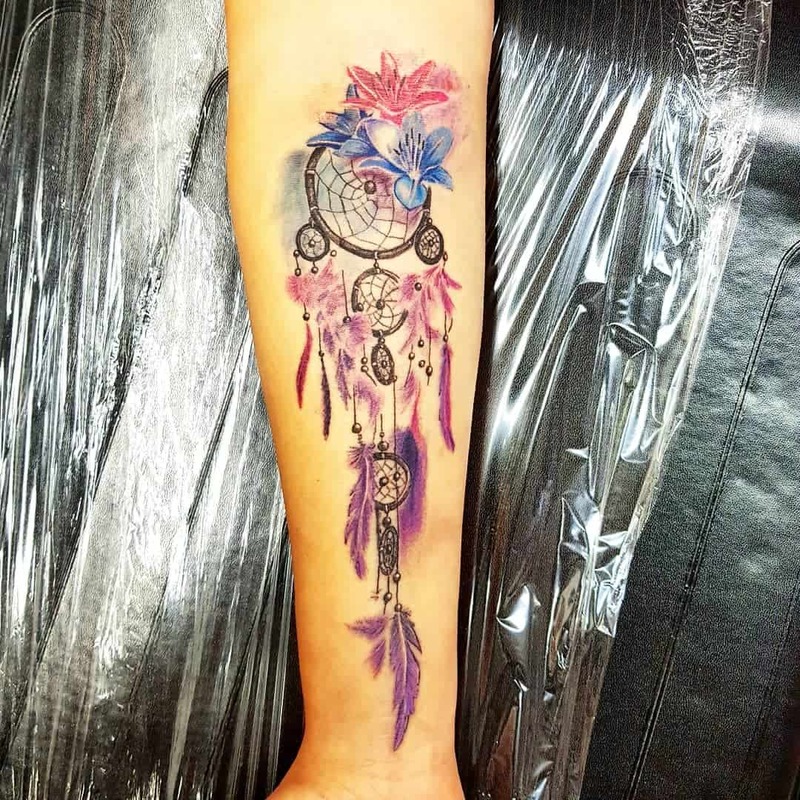 The watercolor patterns are very popular designs. 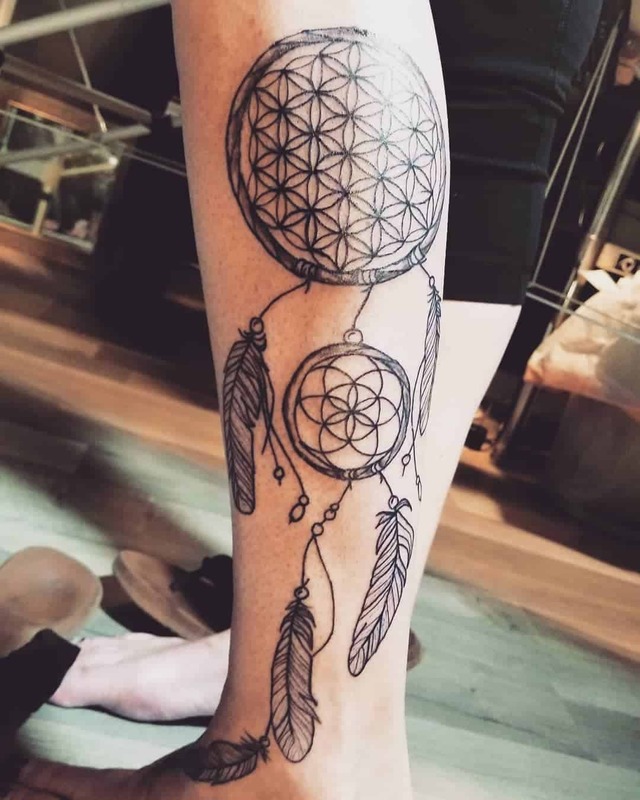 This is a huge dream catcher and it goes down the length of the leg. If you are looking for an amazing style with some cool colors, then this is the one for you. 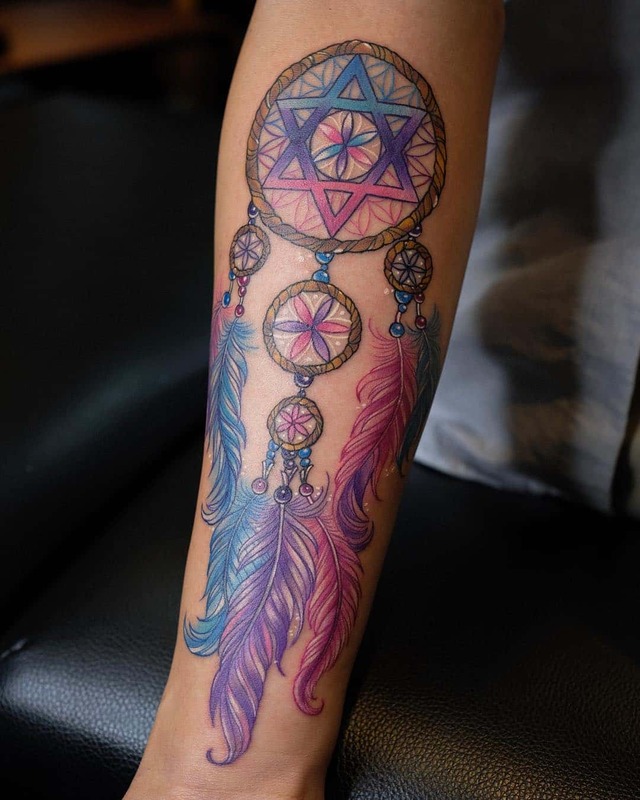 This dream catcher has some awesome colors to it and it’s really a warm tattoo design. 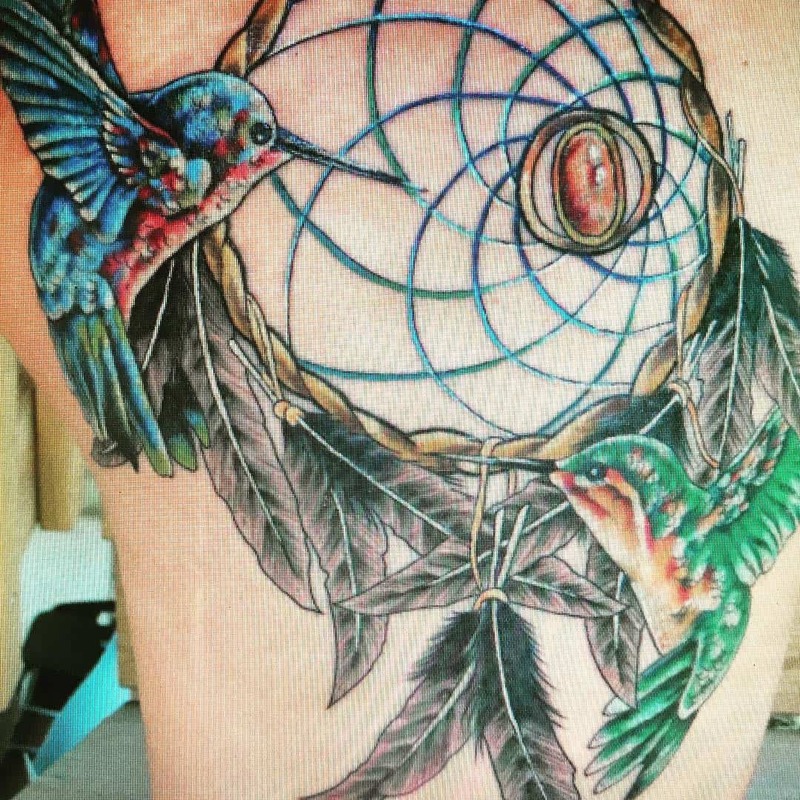 We love the bird that sits in the middle of the dream catcher. 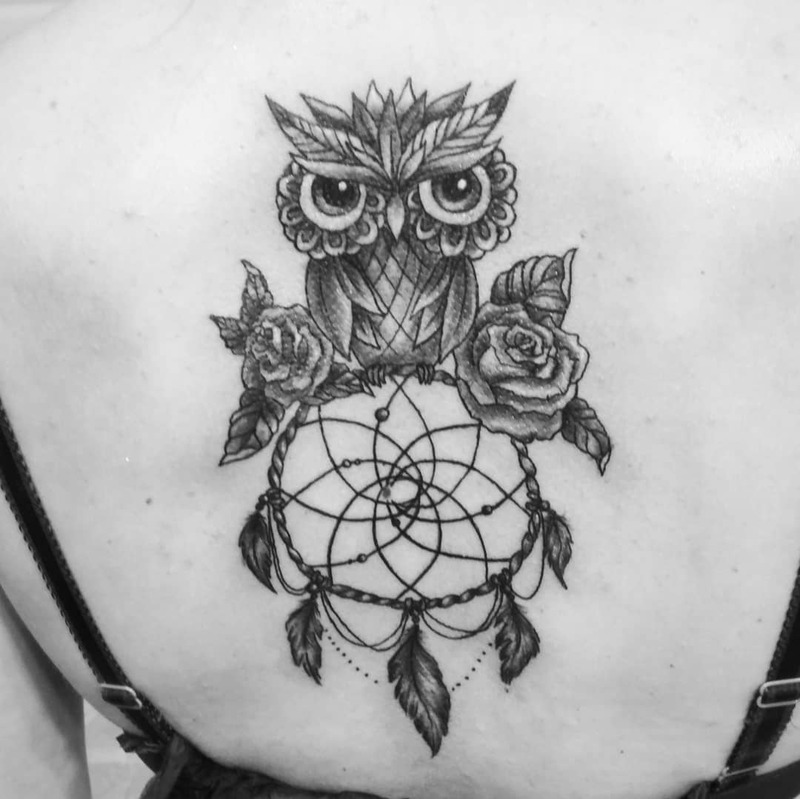 In this case, it’s the inside of the owl where you will find the dream catcher. 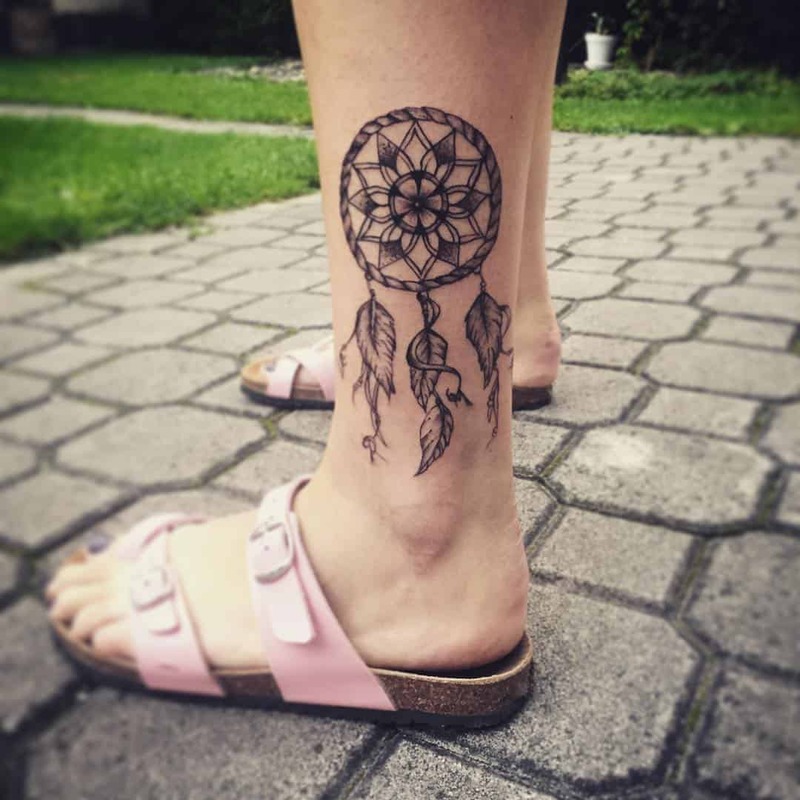 These are great ways to make the dream catcher fit your own personality. 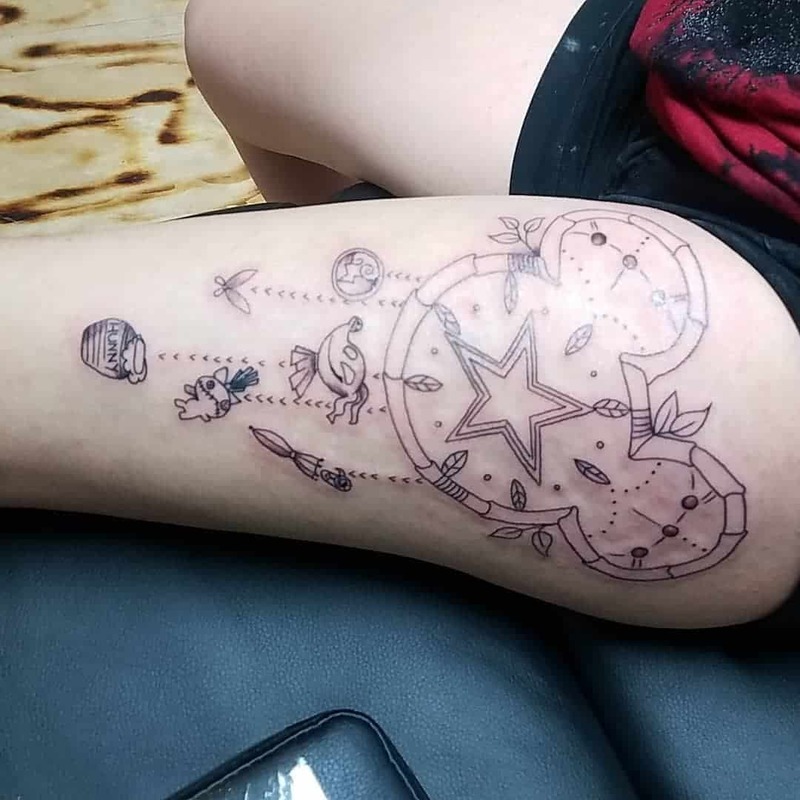 You don;t have to have the same design as everyone else. 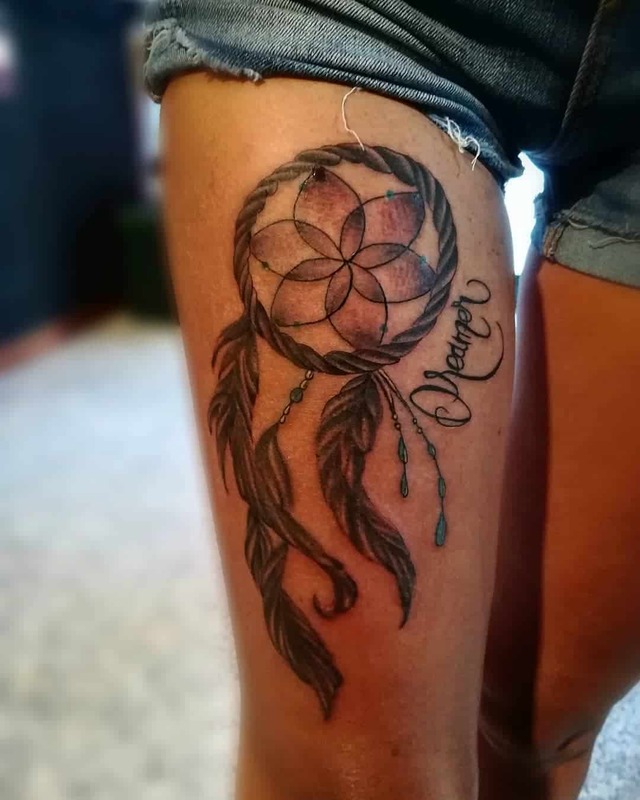 This is a stunning design with a bunch of different colors. 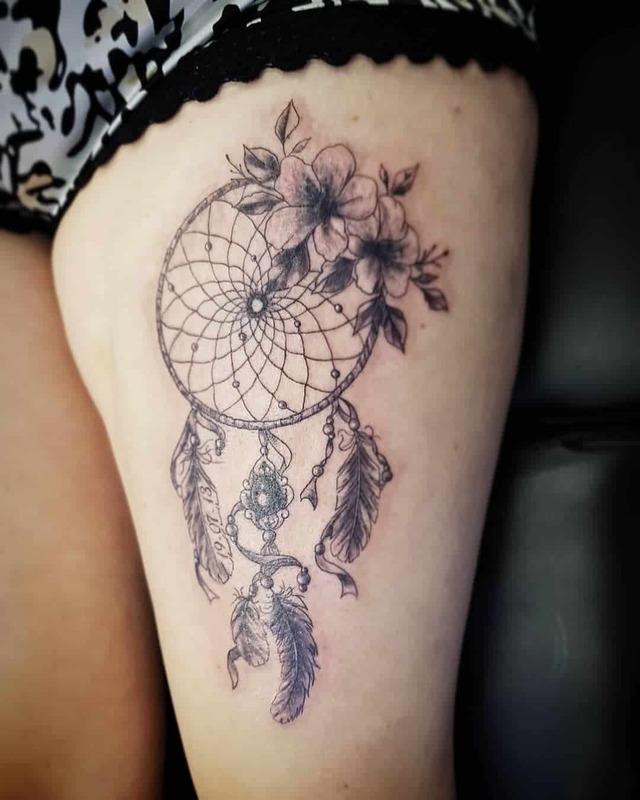 There isn’t a traditional outline with this tattoo which gives it a softer appearance. 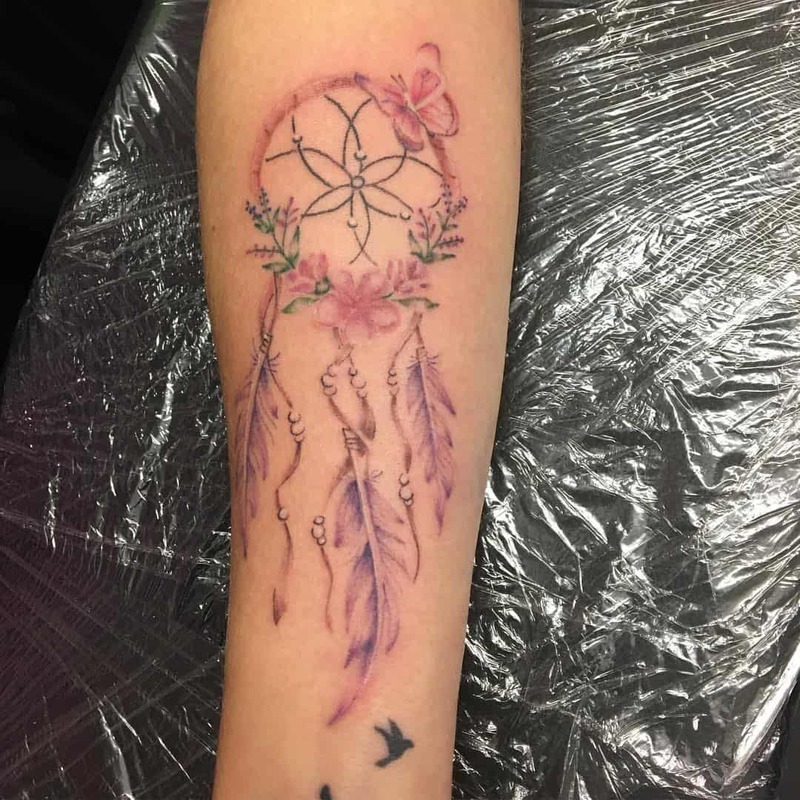 We love all the different feathers that are attached to the style. It’s creative and unique. 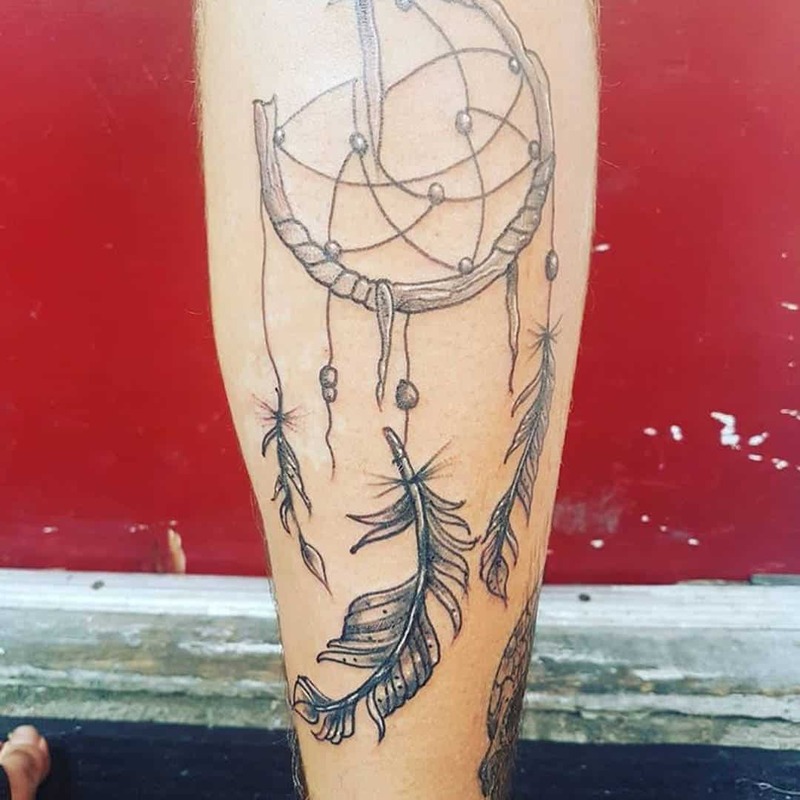 This is another unique dream catcher design that has the feathers dangling from a moon shape instead of a traditional dream catcher. 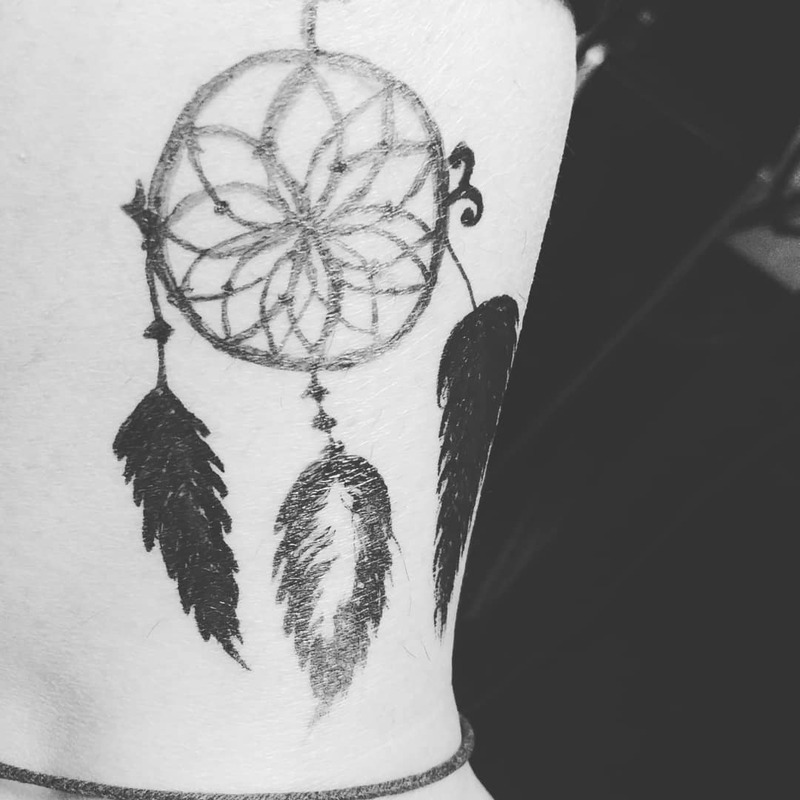 The moon is still associated with dreams so it fits well together. 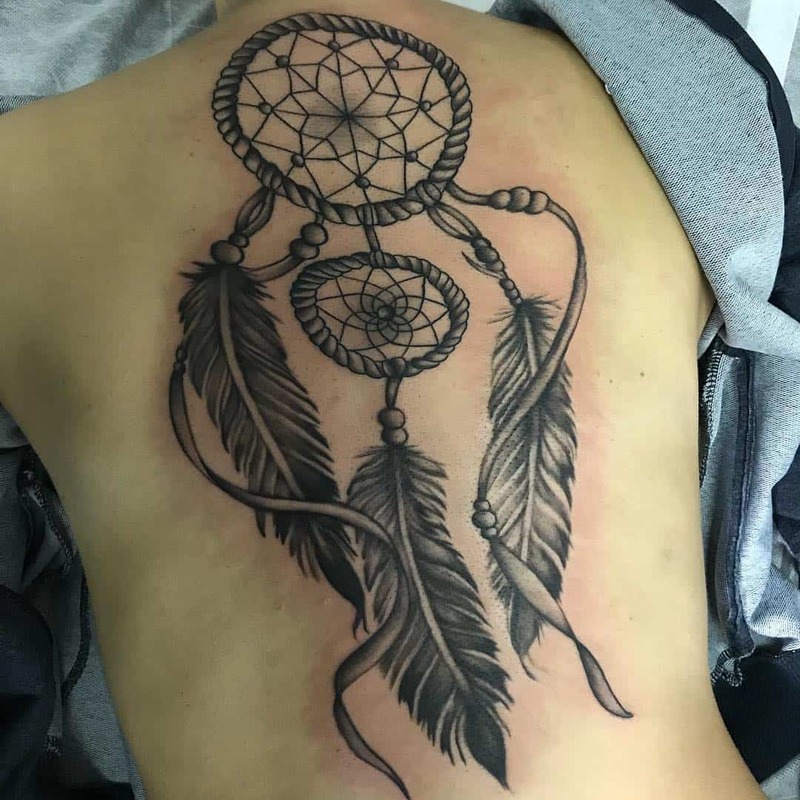 It is believed that the movement if the feathers indicate that dreams are arriving and passing through into a beautiful dream for the owner. 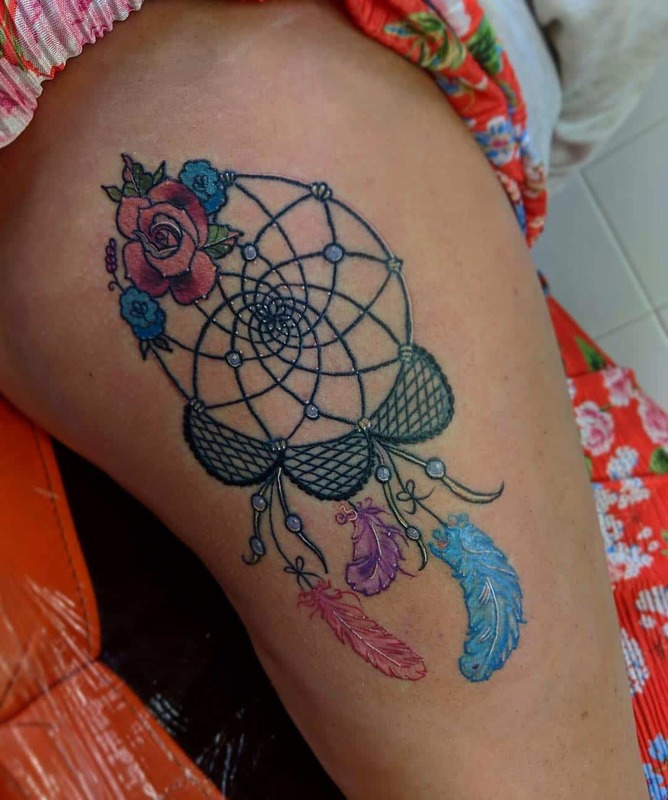 The feathers are placed on the dreamcatcher as a means of entertaining the babies much in the same way that a mobile does. 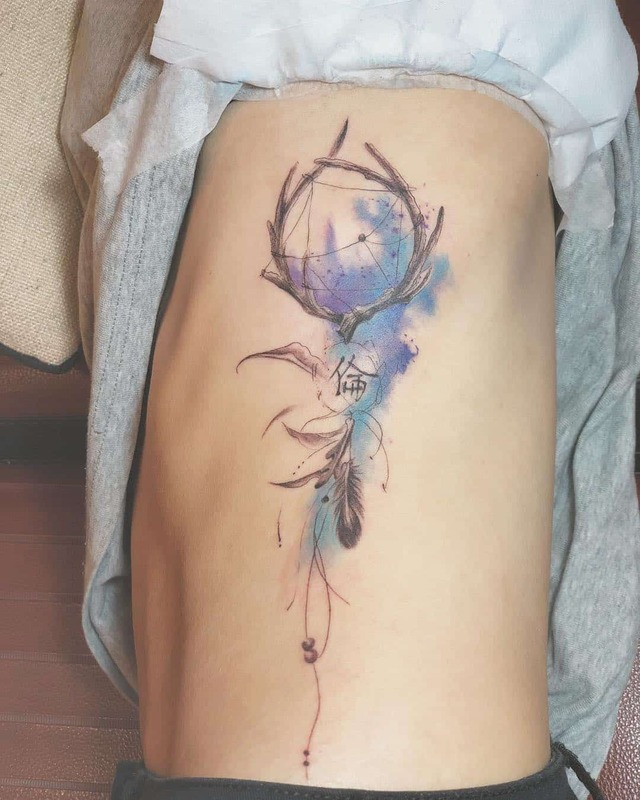 There is a deeper meaning to the feathers however, A feather typically stands for breath and air. These things we need as essentials to life. 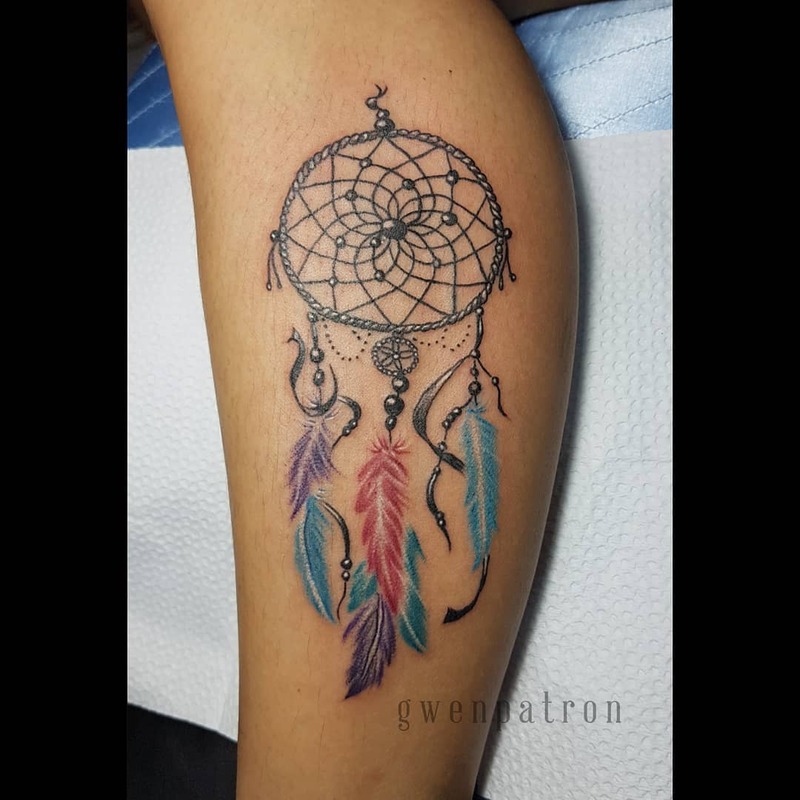 The feathers act as the passageway to the good dreams. 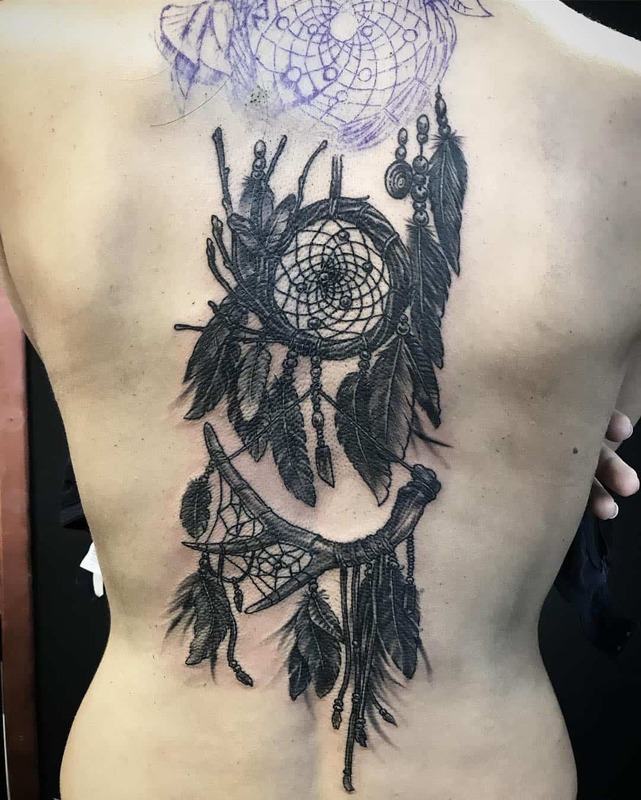 You can use many different feathers on the dream catcher. 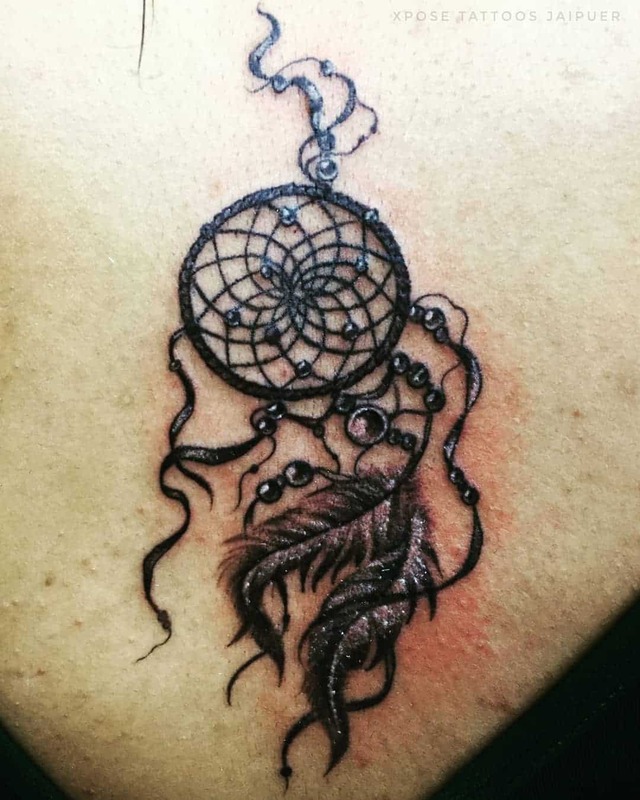 But many tribal women who create the designs will use owl feathers. 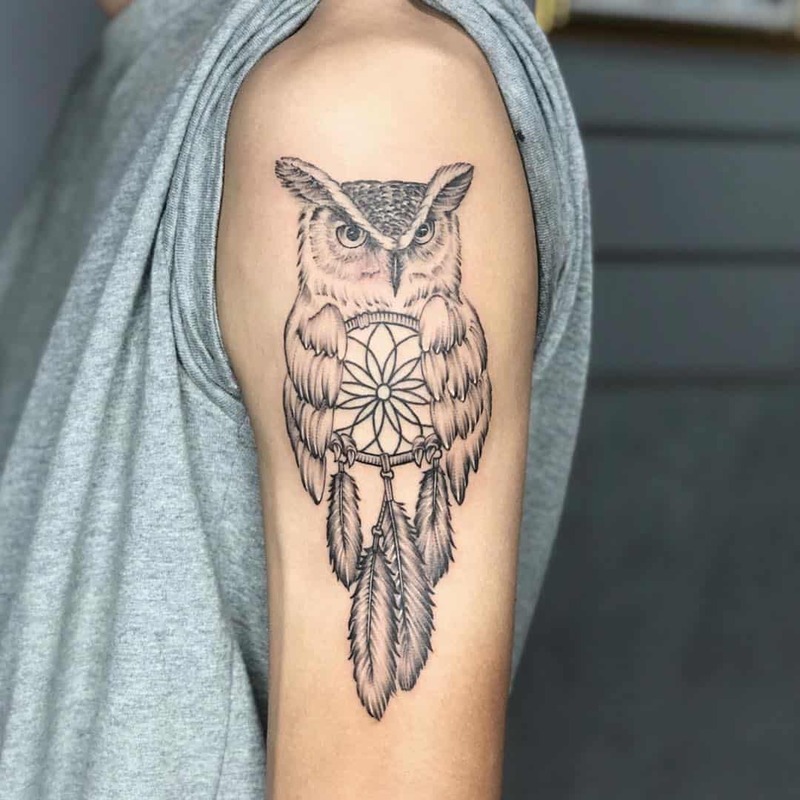 This is because the owl is known to have wisdom. 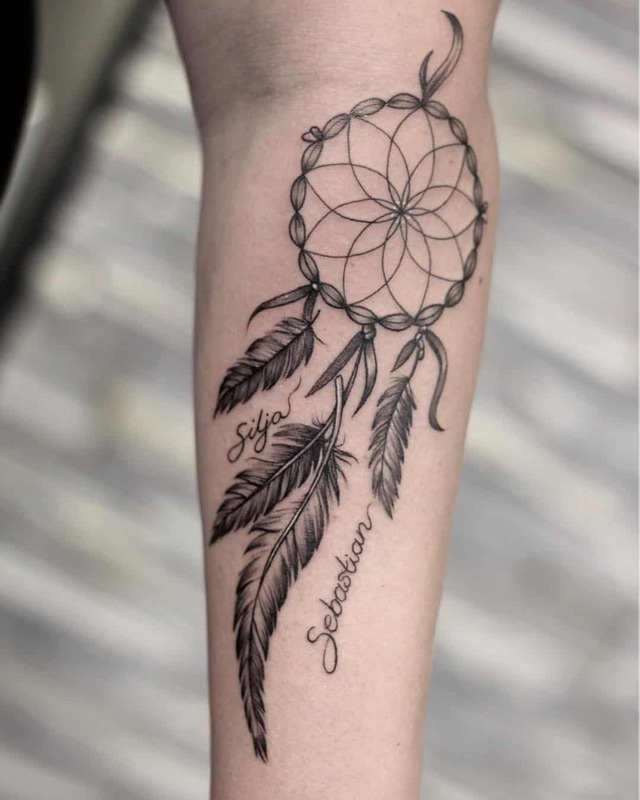 Another popular feather used is the eagle’s feather because it offers courage. 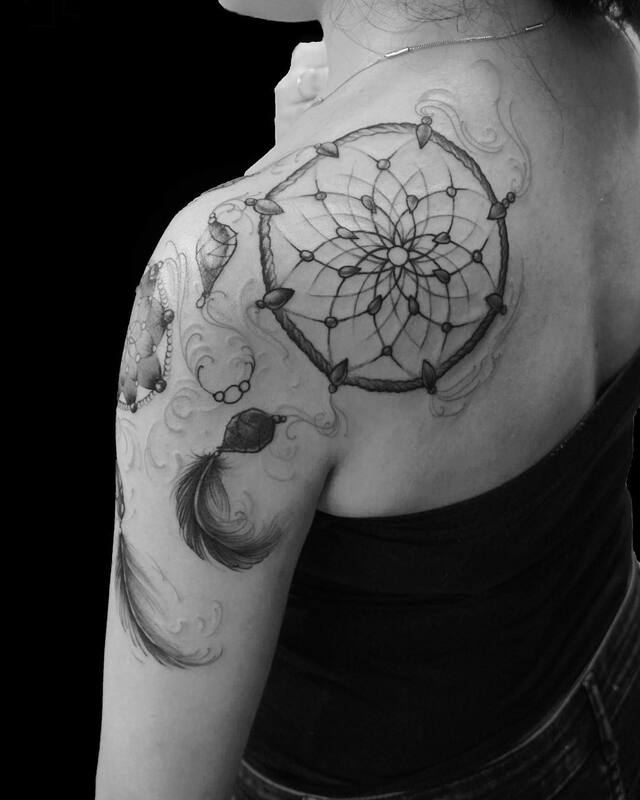 There are typically eight points to a dream catcher and it represents the eight legs of the Spider Woman. 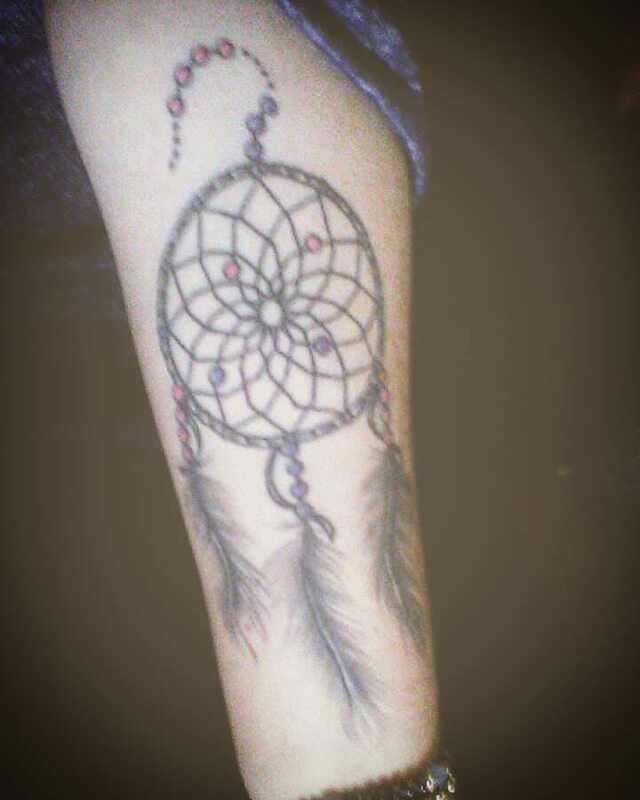 You will sometimes see just one gem in a dream catcher and that represents that there is only one creator. If you see four gemstones, it means that it represents the four ordinal directions. 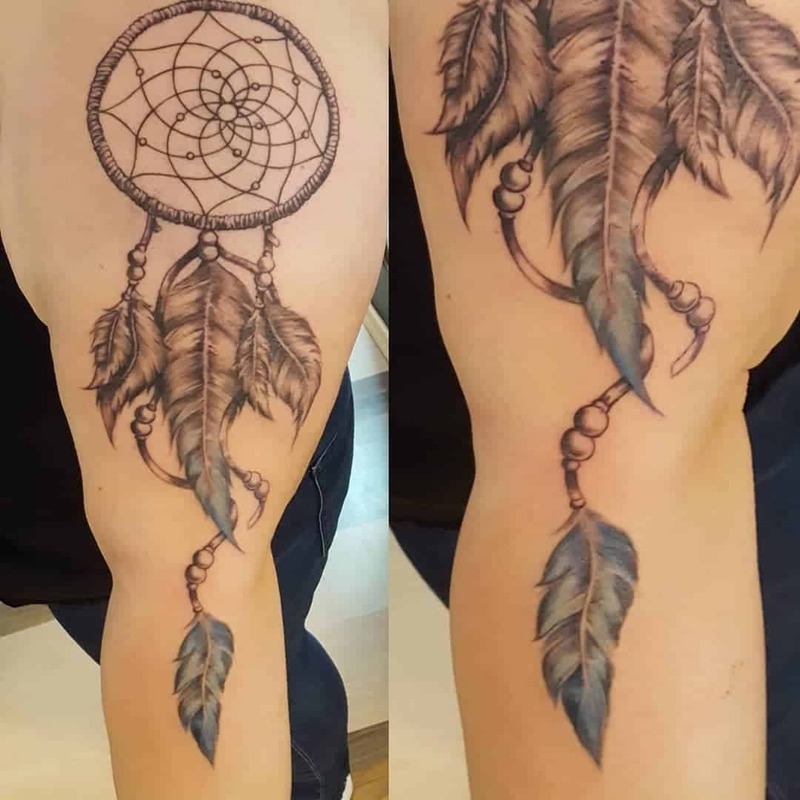 How can you go wrong with such a cool and creative design like this one? 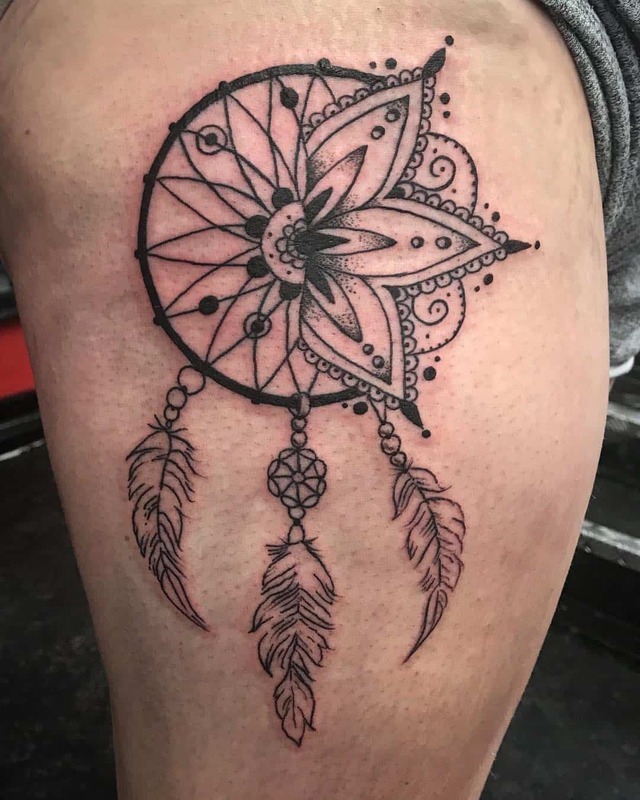 If you are looking for something unique, then you can’t go wrong with this style. 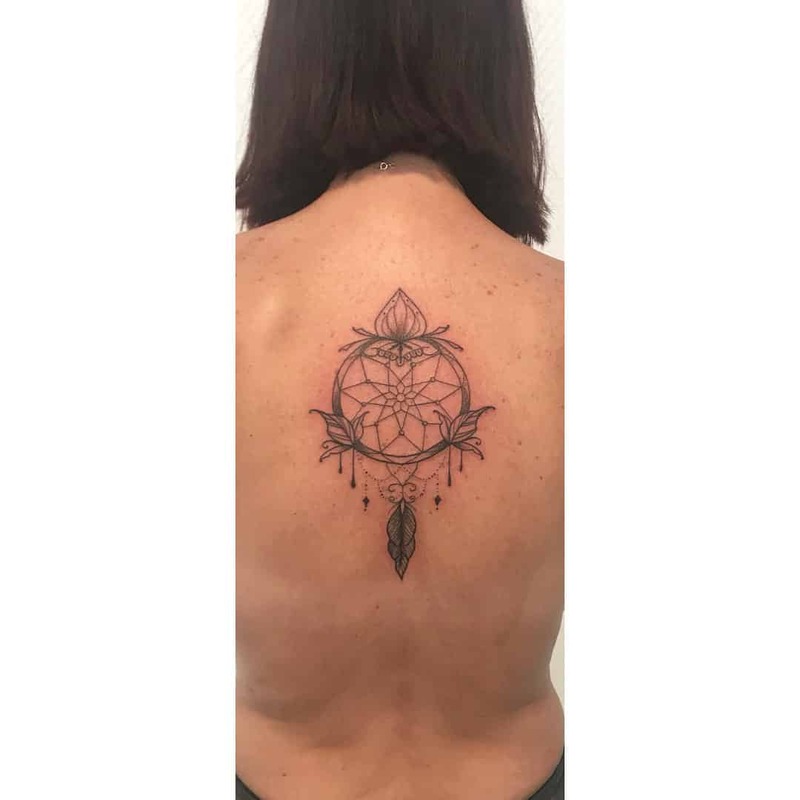 We just love this gorgeous design because it truly is one of a kind. 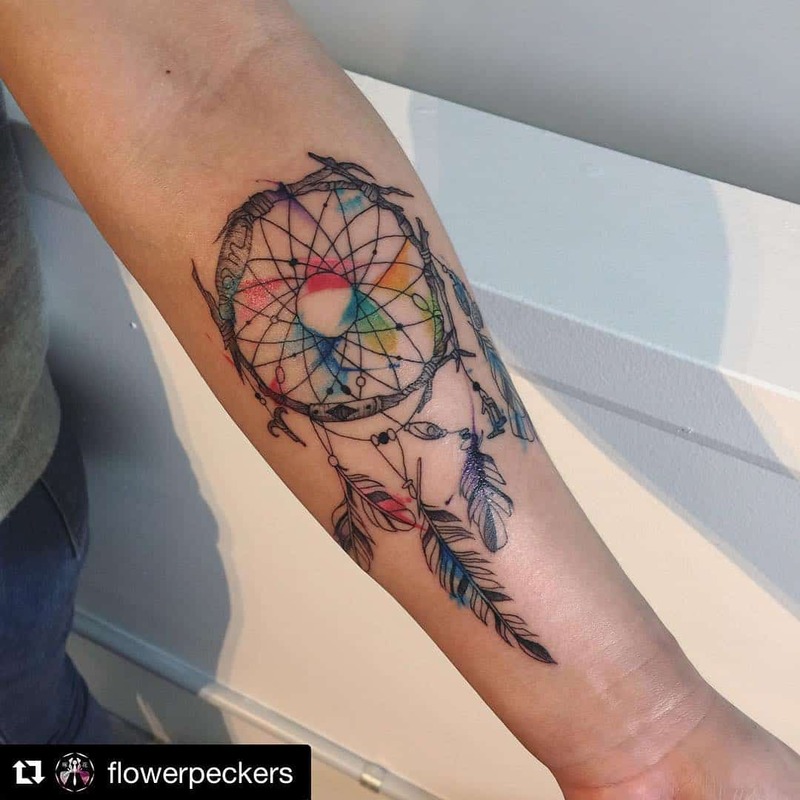 Not only are the colors bright and magical but the design itself is unique. 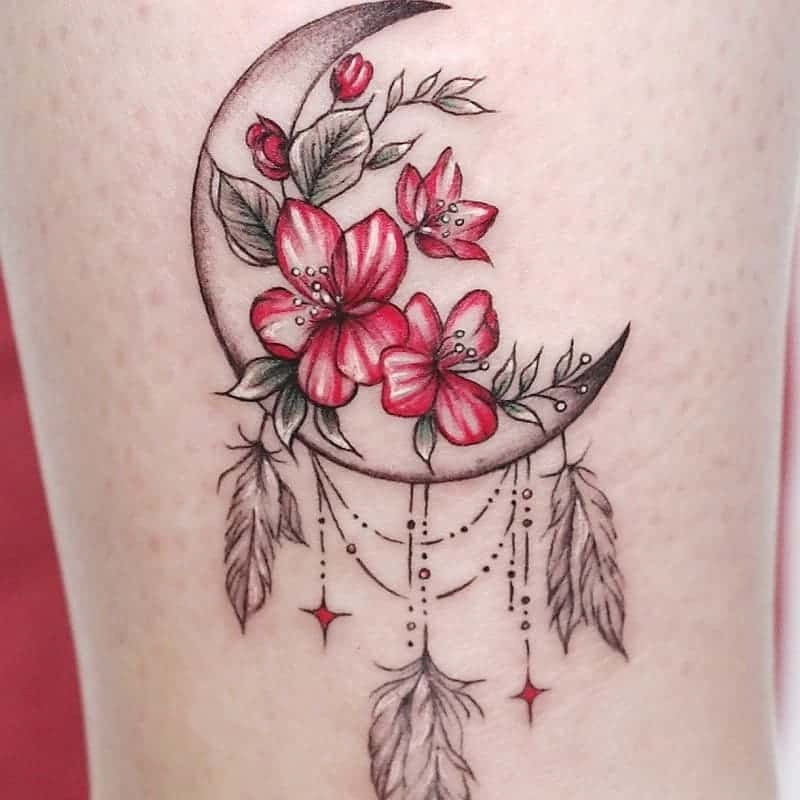 It’s once again in the shape of a moon but it looks like ribbons hanging from the dream catcher. 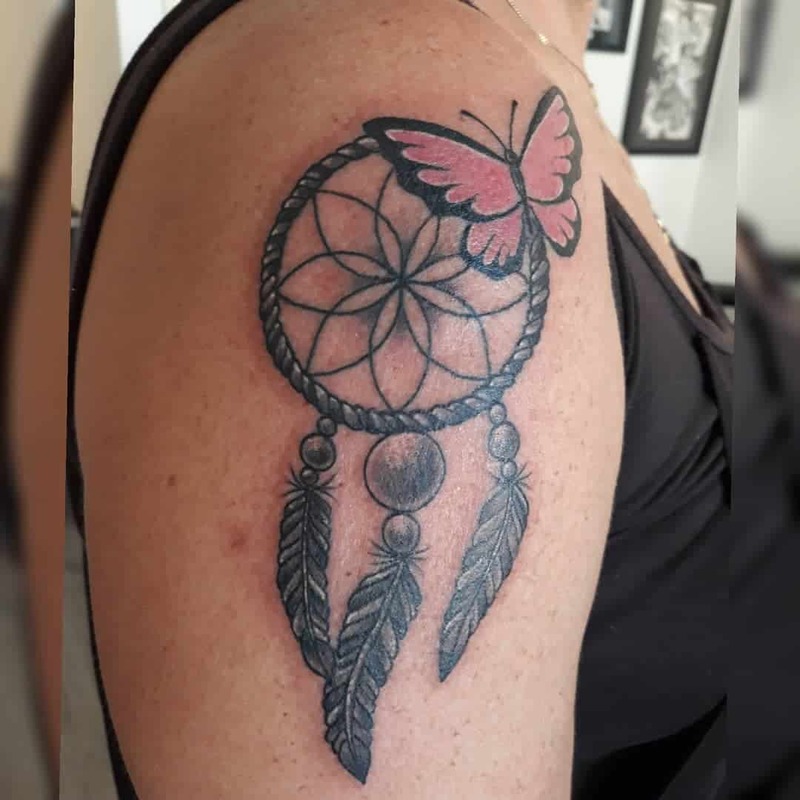 It’s a beautiful design that is sure to get you a lot of compliments. 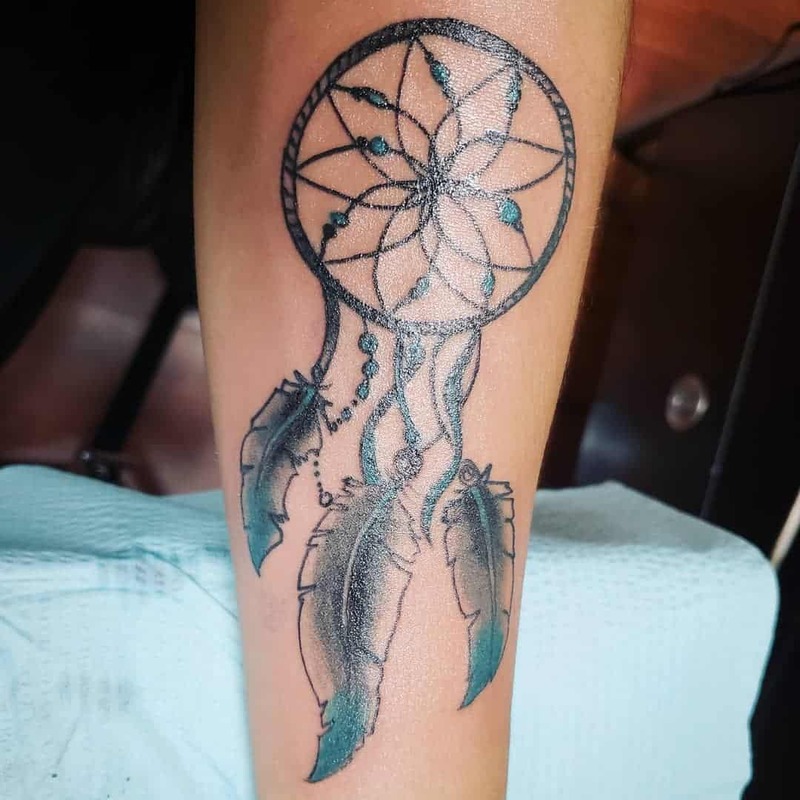 This is a great dream catcher for men design because although there is a butterfly, it’s still a masculine design that is represented by the color blue. 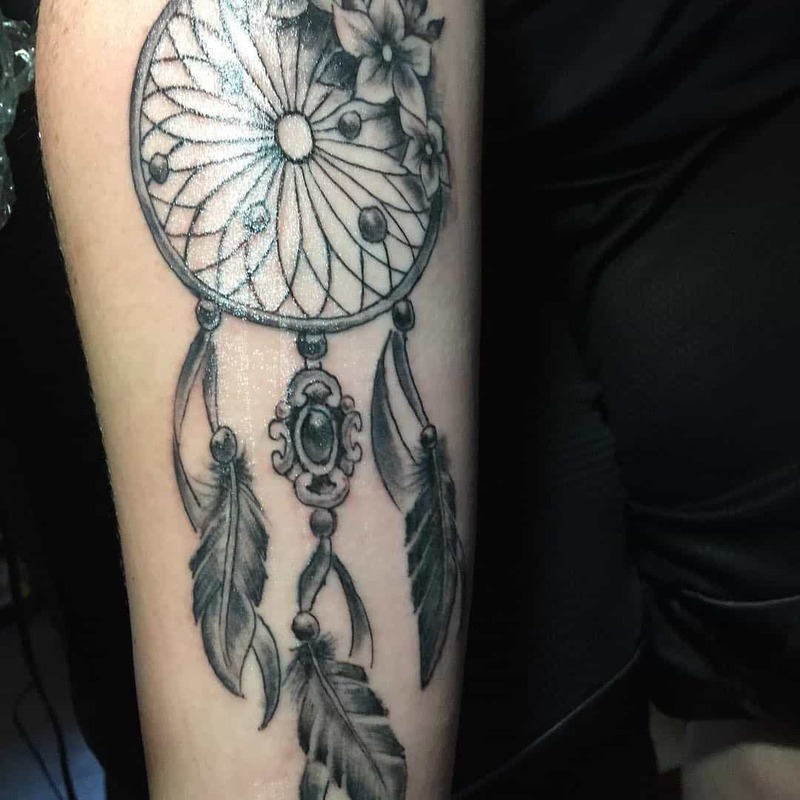 It’s a great style for the arm because it fits in the space nicely. 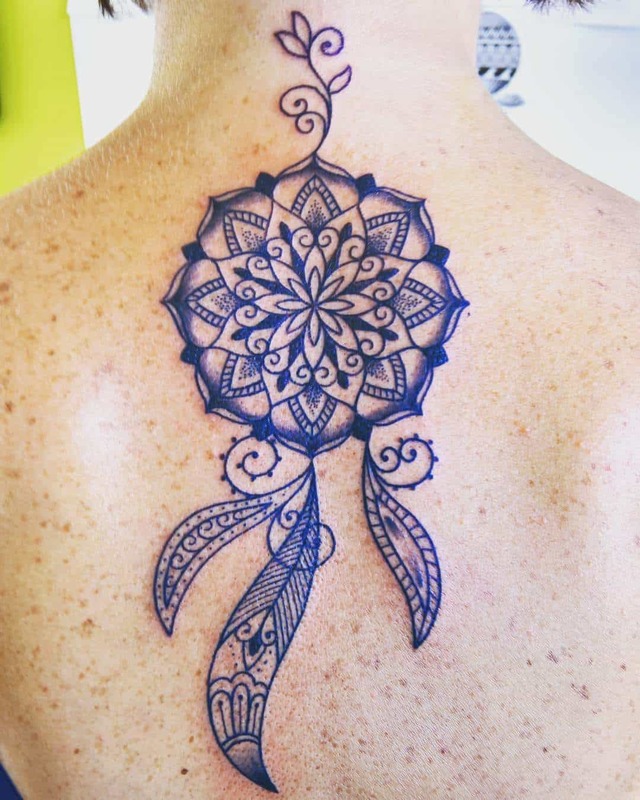 The best part of this style is the bright blue coloring. It just pops off the arm. If you want a style that is going to catch the eye, then this is the one for you. 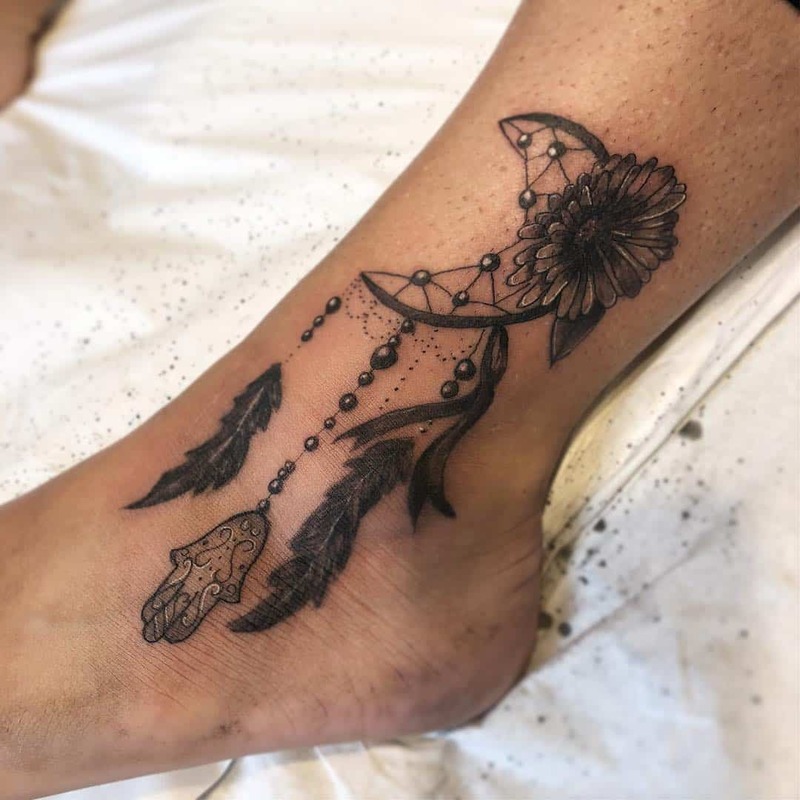 This is the perfect tattoo design to show off at the beach. 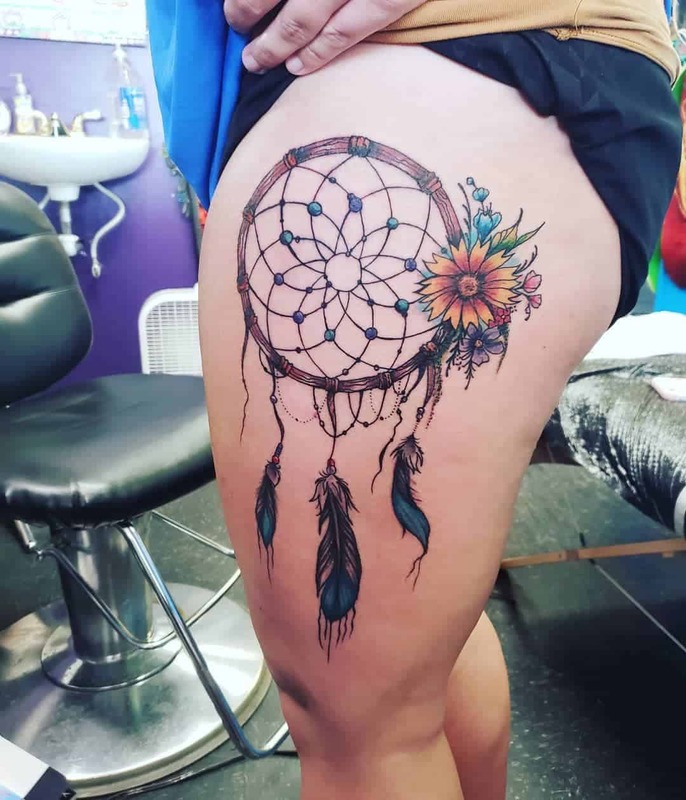 The colors on the feathers are breathtaking and they are sure to get you a lot of compliments. 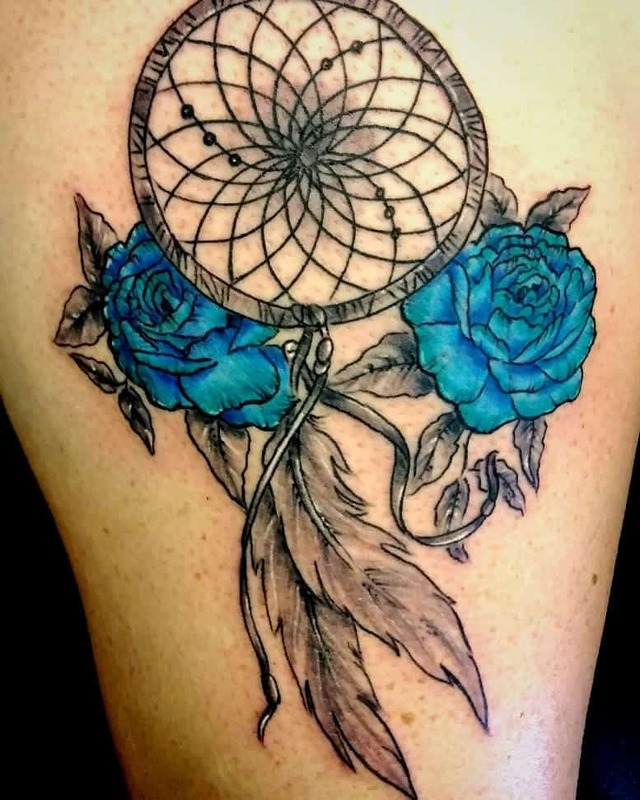 Blue is a very distinctive color to have for a tattoo. 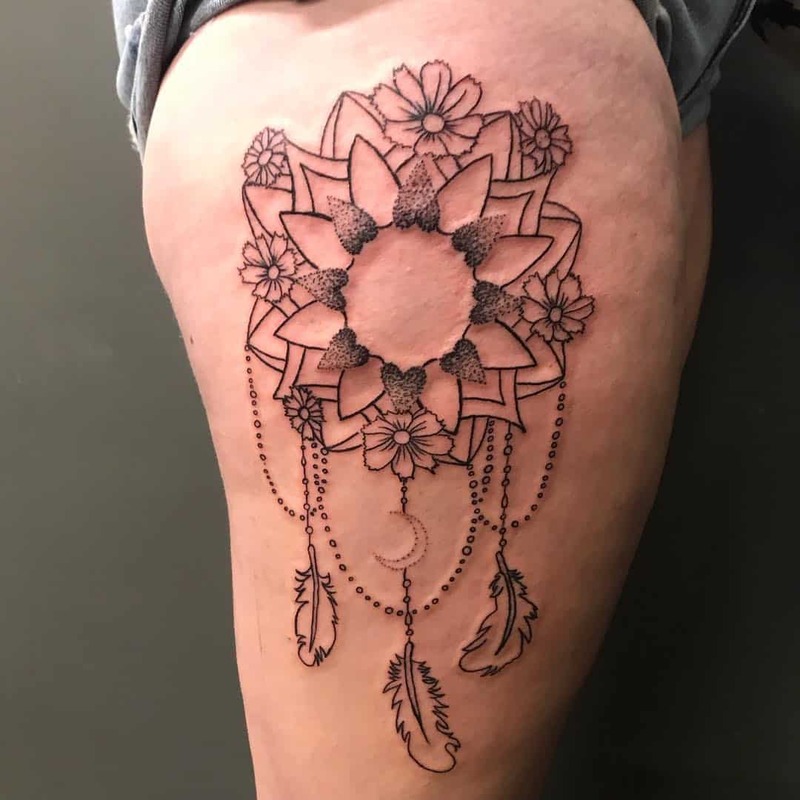 Another great design and this one doesn’t have a stitch of color to it. 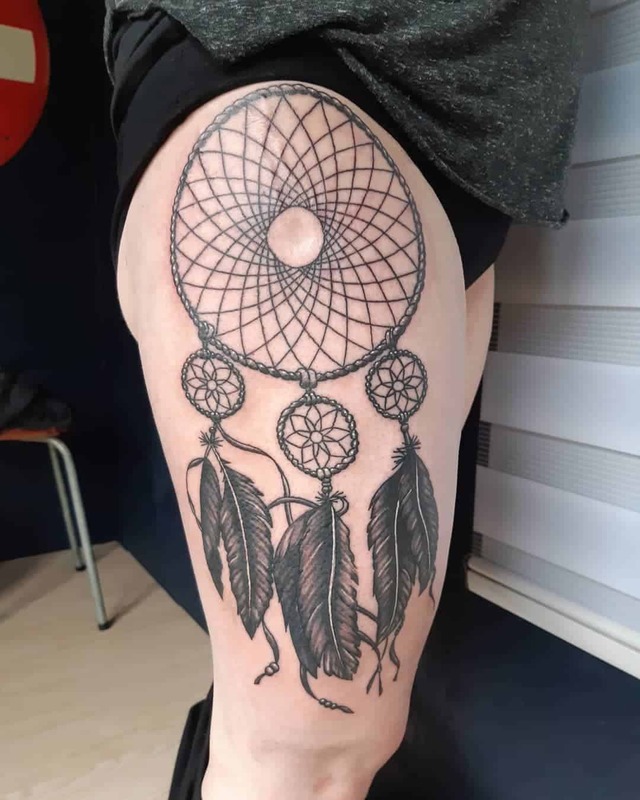 This is a great example of a tattoo that doesn’t need the color. 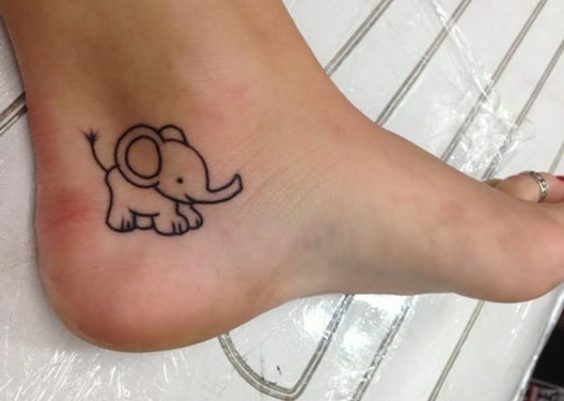 It’s simple and elegant and you could fit this tattoo anywhere. 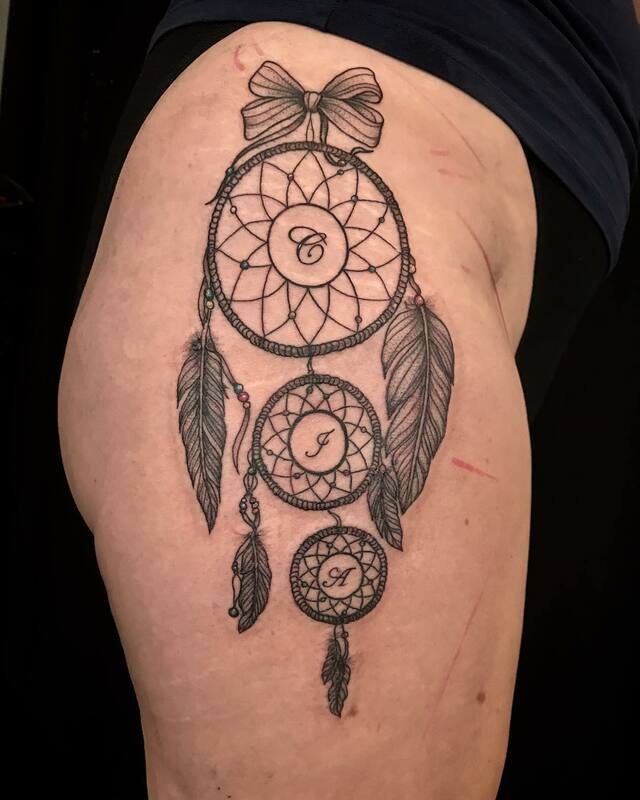 If you want something that speaks to you, then this might be the style for you. 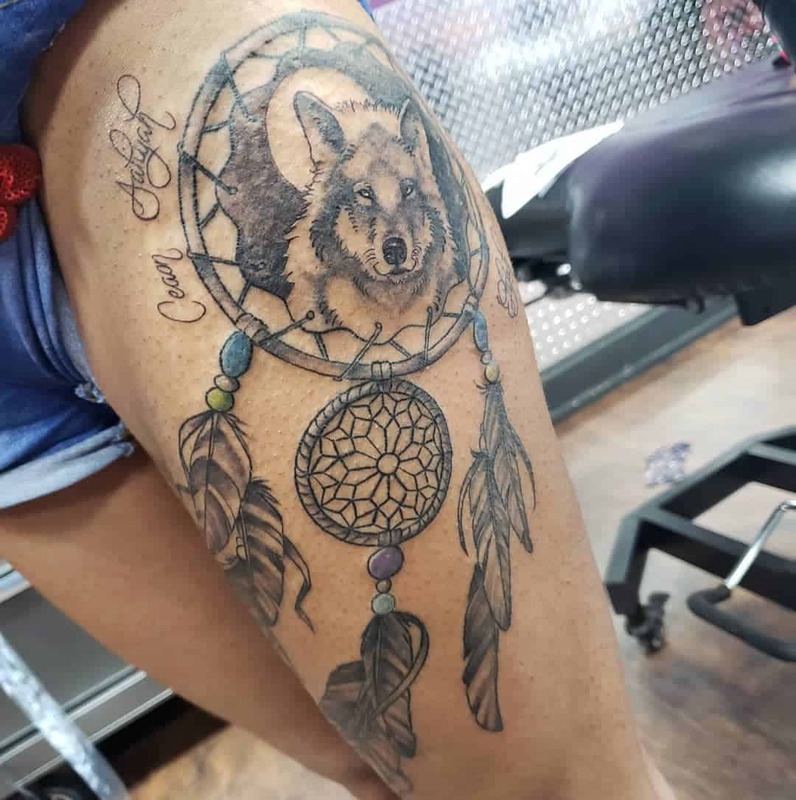 Dream catcher tattoos come in all shapes and styles. 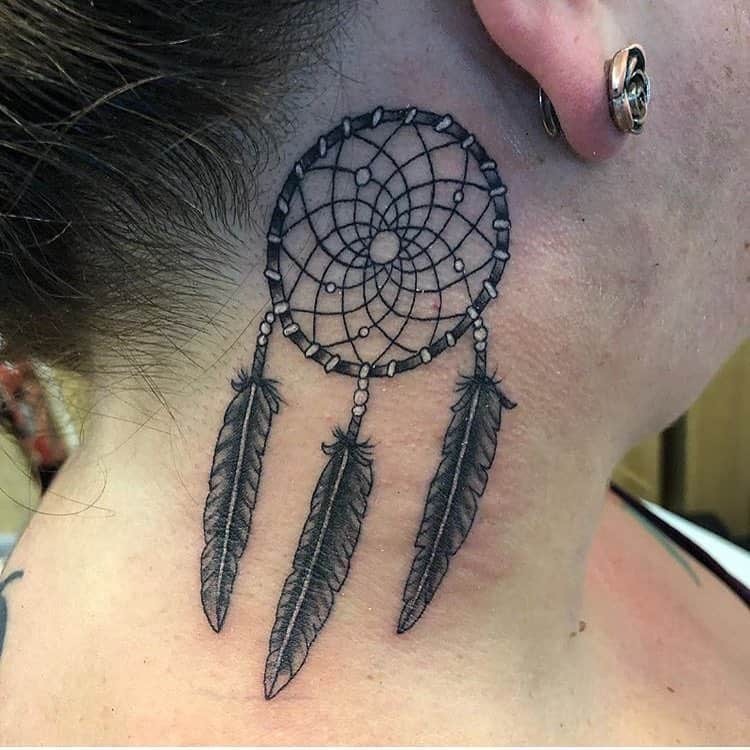 You may not want a large arm tattoo but this style had been placed right behind the ear. 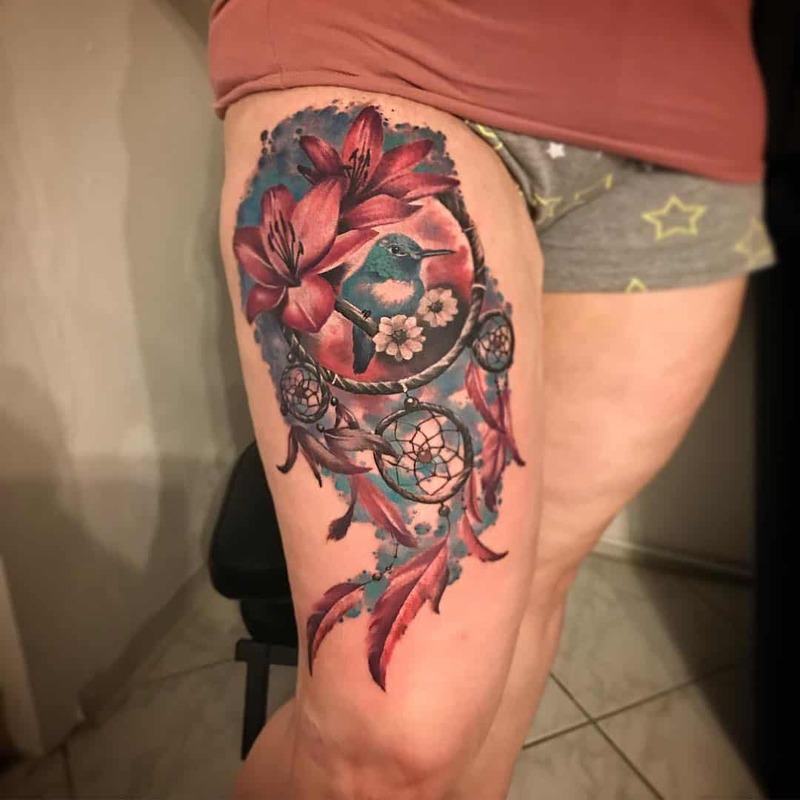 Another awesome tattoo design that has different colored florals involved. 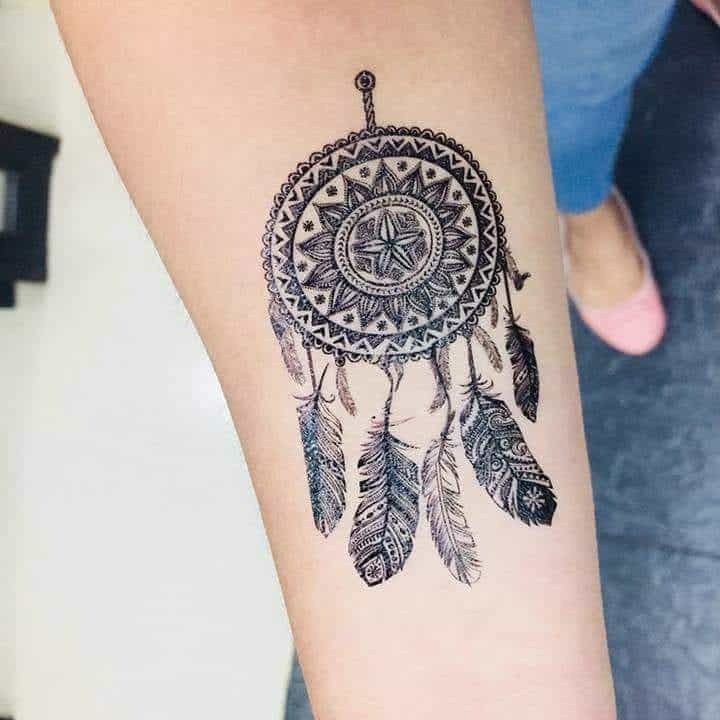 There seems to be dream catchers upon dream catchers in this style. 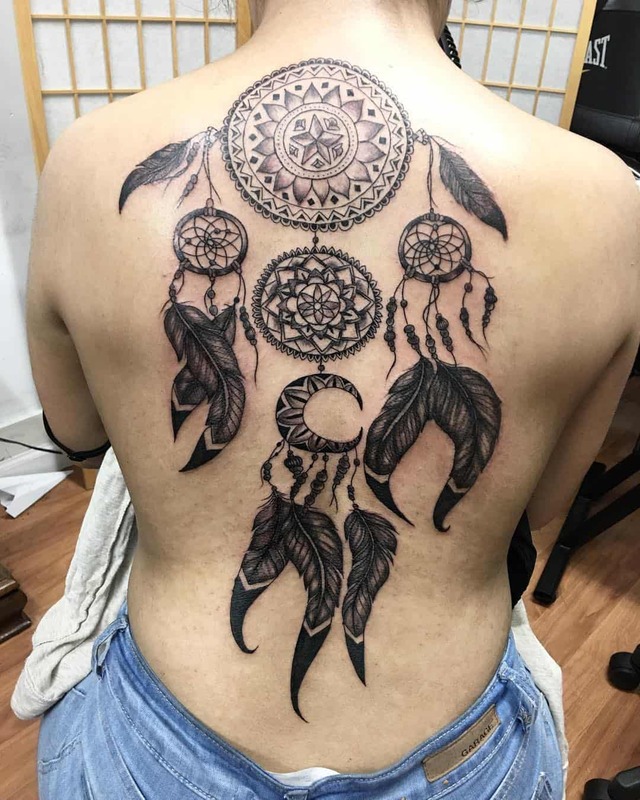 It makes for a great back tattoo and one that you are sure to love. 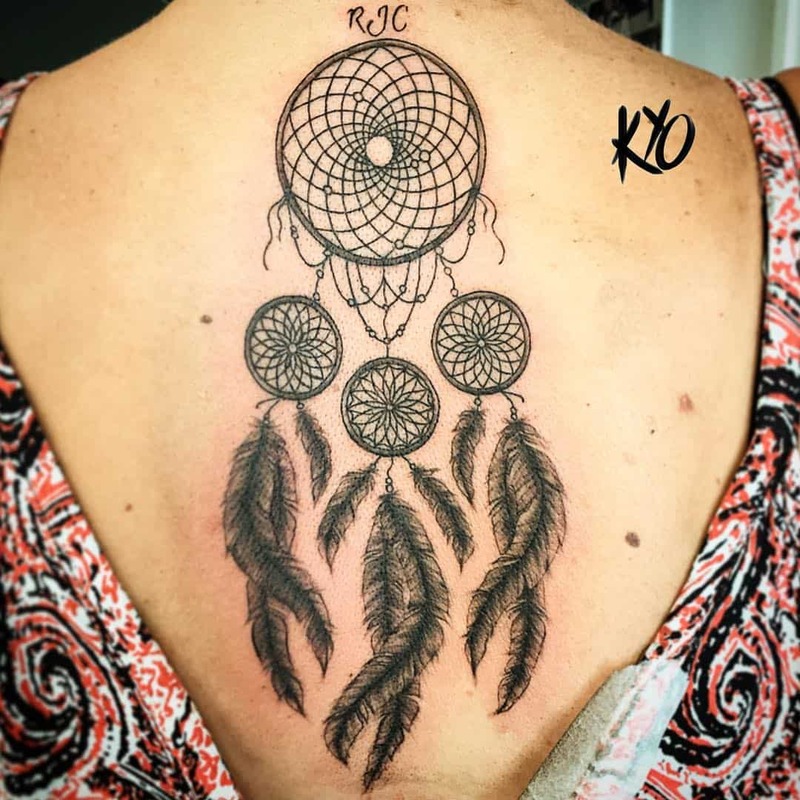 We love how there are names trailing down from the dream catcher instead of strings. It’s a cool way to represent family members or children in your life. 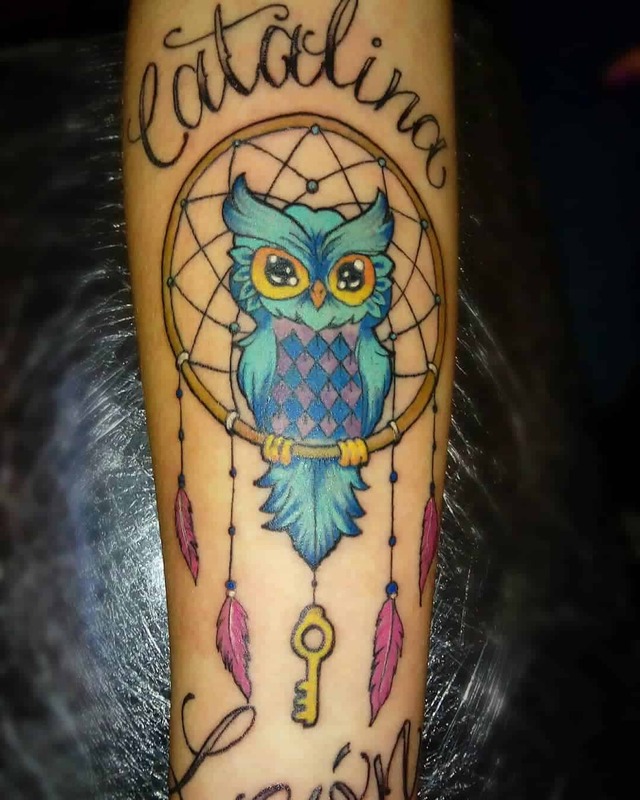 We love this because it’s a personalized style that is just for you. 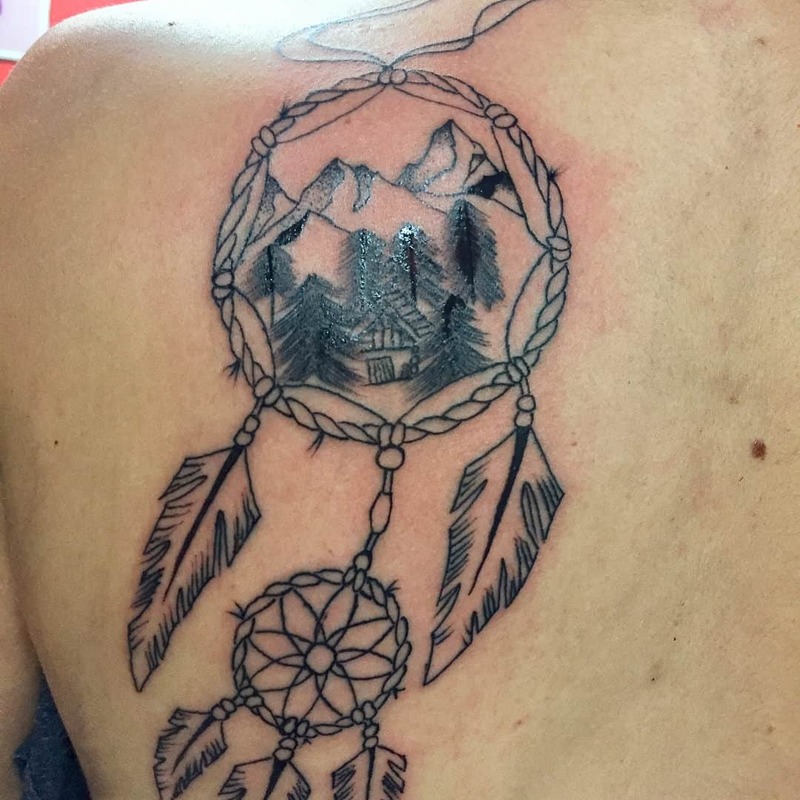 If you have a love for the mountains, then that might be something that you want to incorporate in your dream catcher design. 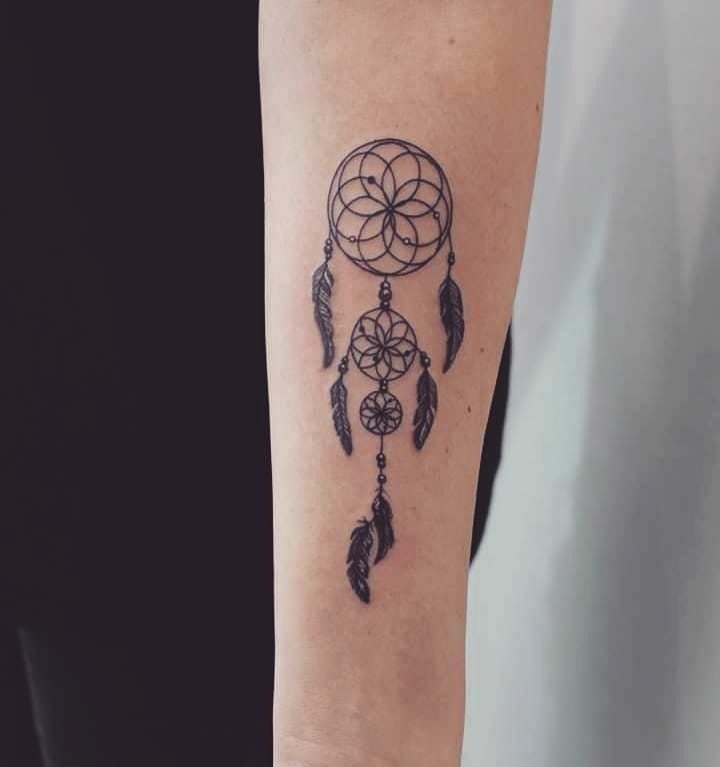 This is a very mysterious style that you are sure to love. 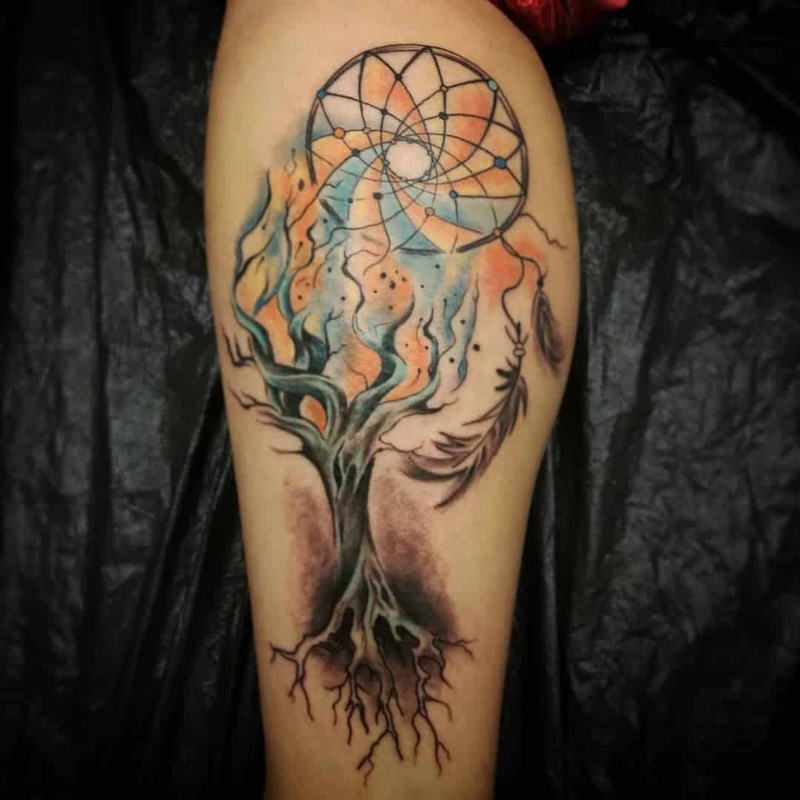 We love how the colors from the dream catcher and vibing down to the tree. 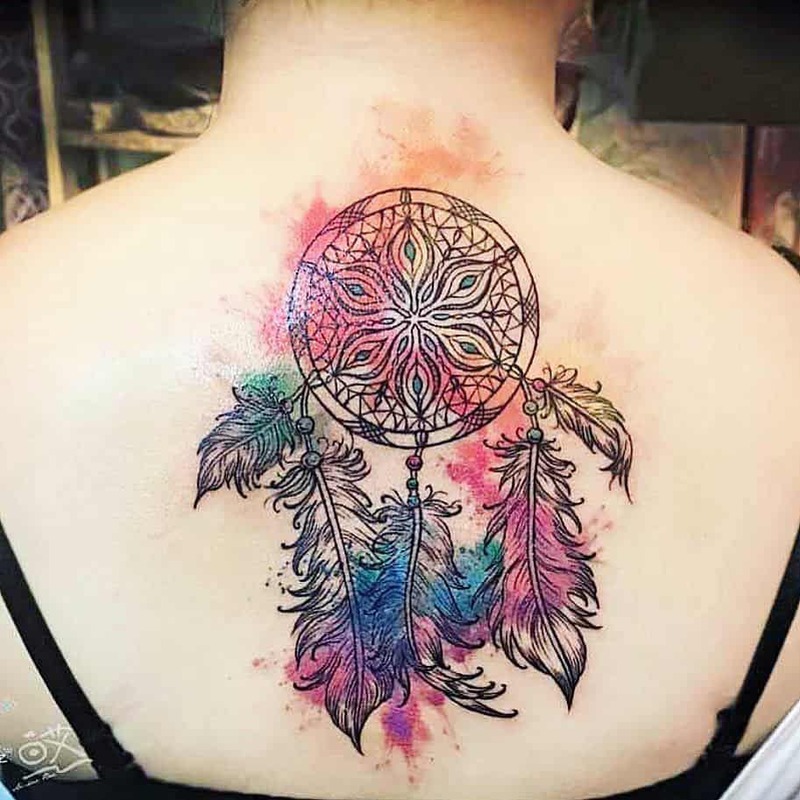 It’s a unique and colorful style that you are sure to love. Another great design that has some bold colors to it. 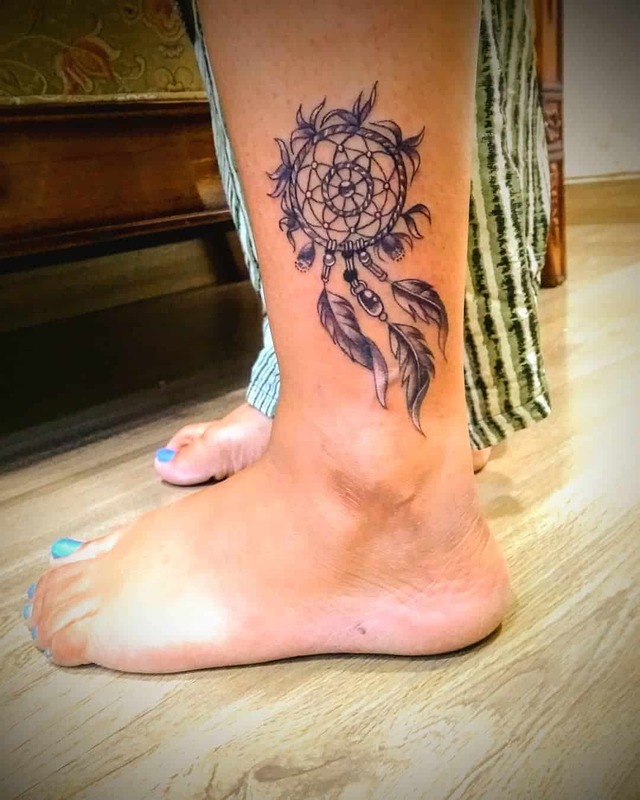 Not everyone wants a large tattoo design and that’s okay. 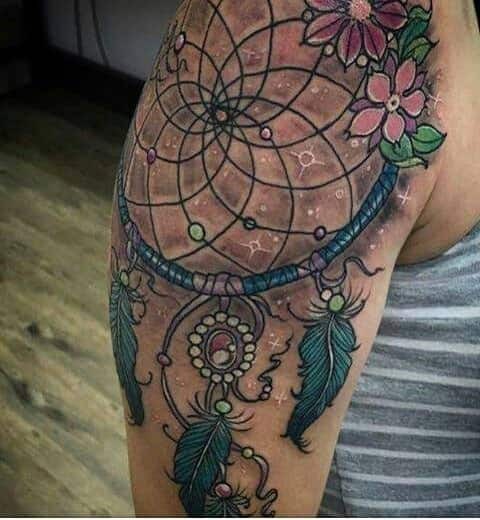 This is a unique style because it’s not like the traditional dream catcher looks. 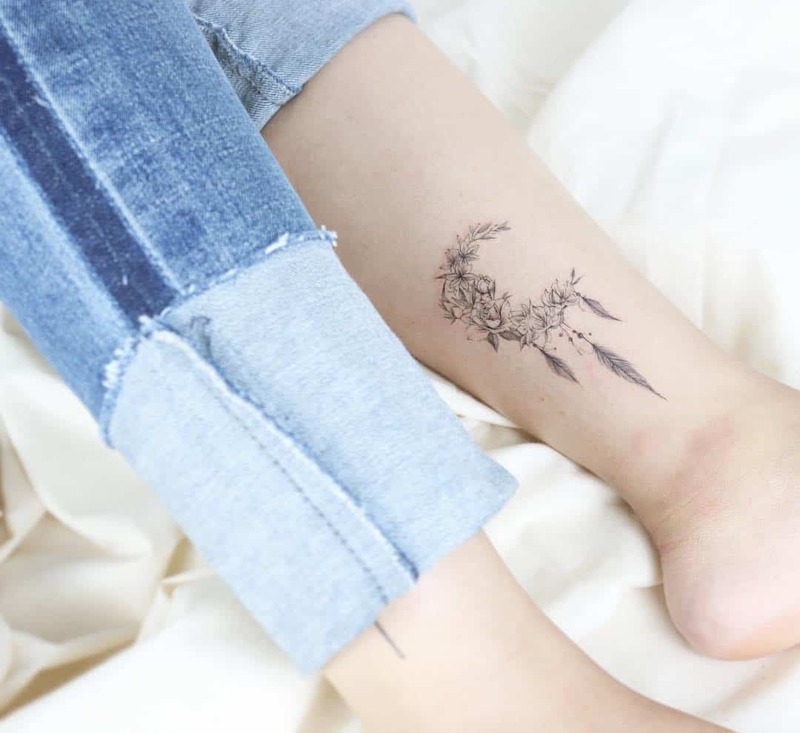 If you are looking for a cute, little tattoo, then try this one on for size. 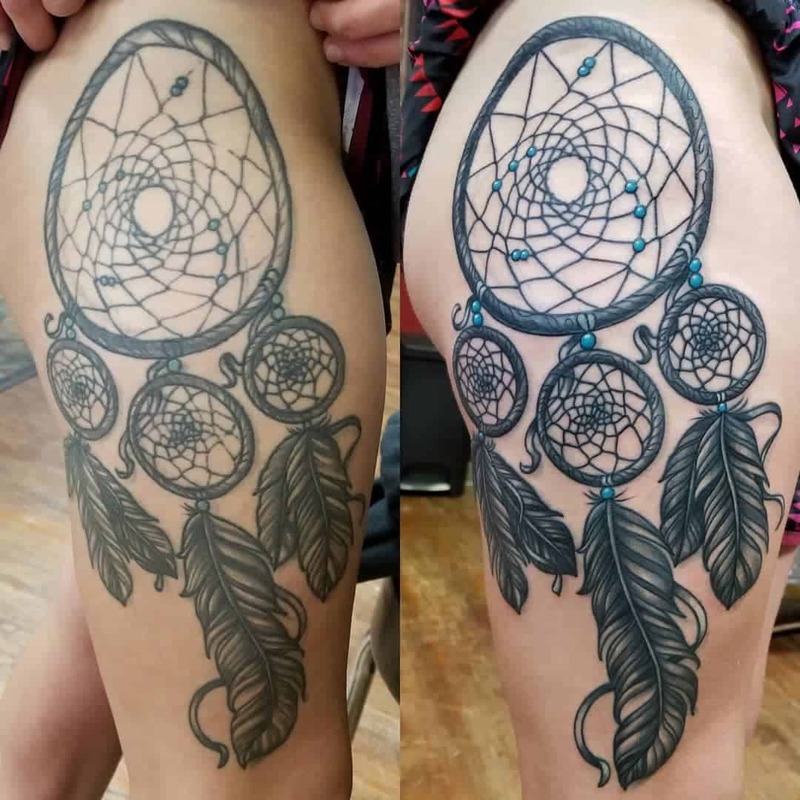 Dream catchers make for great matching tattoos. They are sweet styles that can be worn by both men and women. 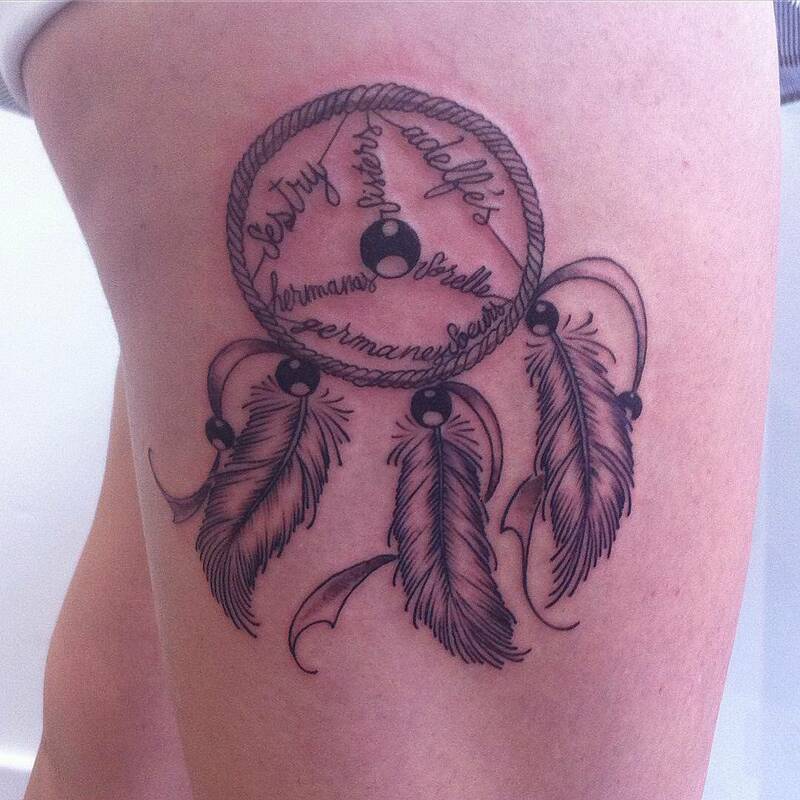 If you are looking to personalize it as well, then a name can be used just like you see in this photo. 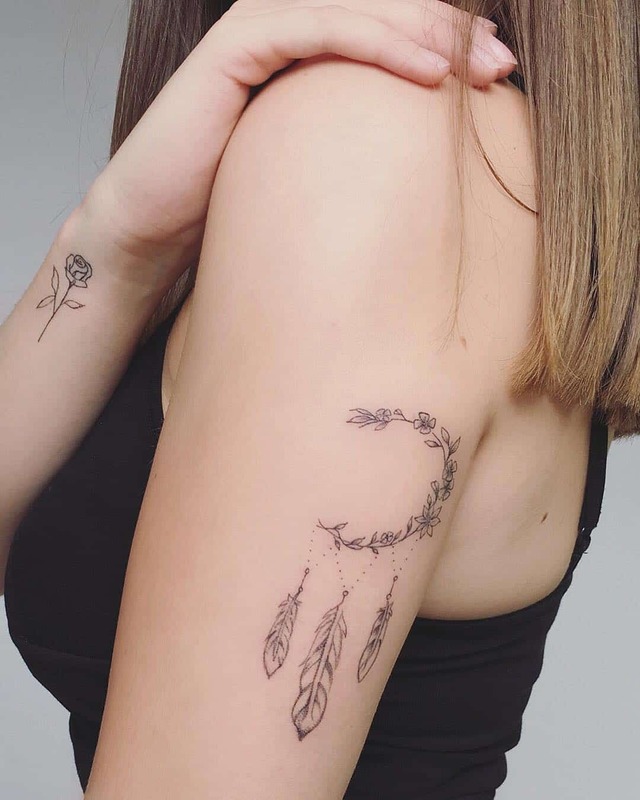 We love these cool styles! 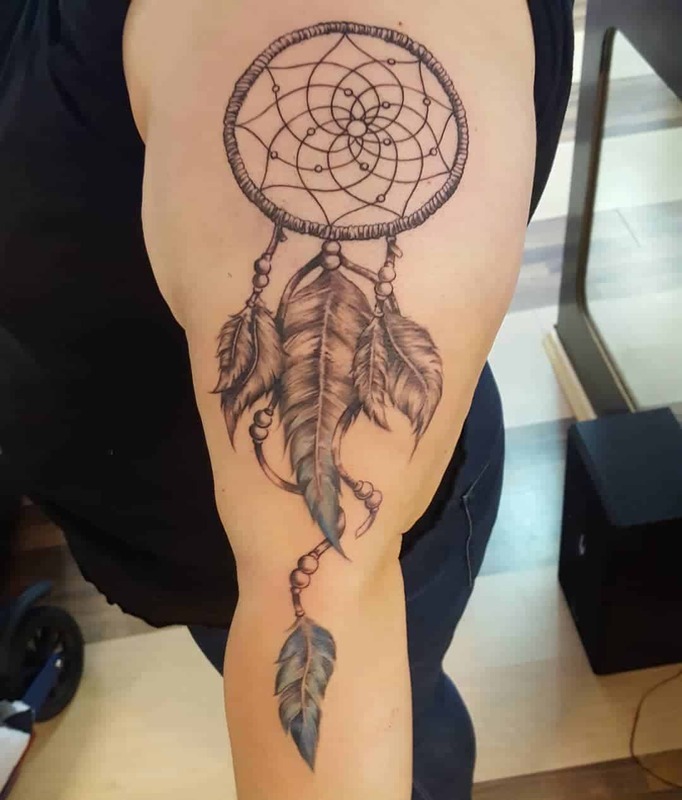 A cool design that has thicker lines and darker shades. 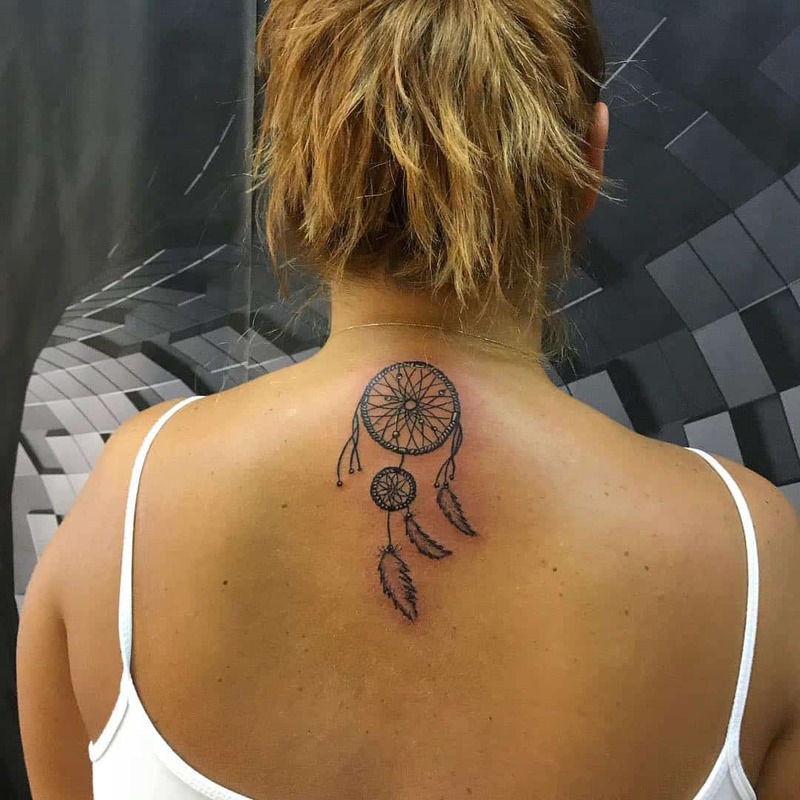 Usually, when we are dealing with a tattoo that has a cultural heritage behind it, there is typically some meaning to it. 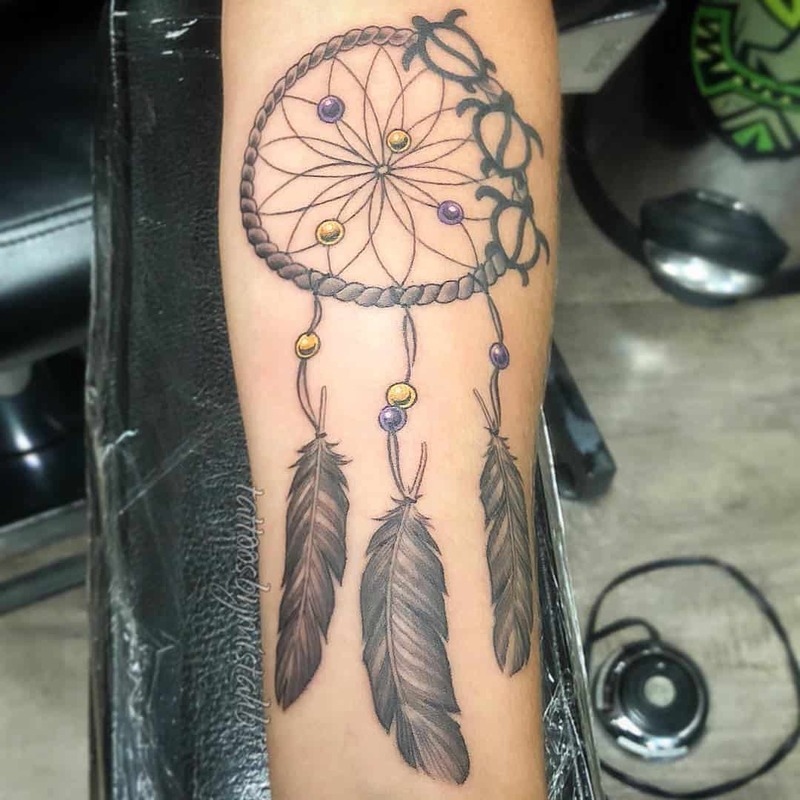 The dream catcher represents the rich cultural heritage among the Native Americans. 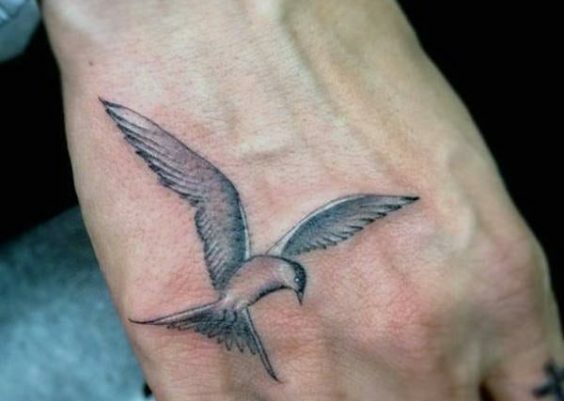 It’s something that both men and women cultivate and use as a symbolic meaning. 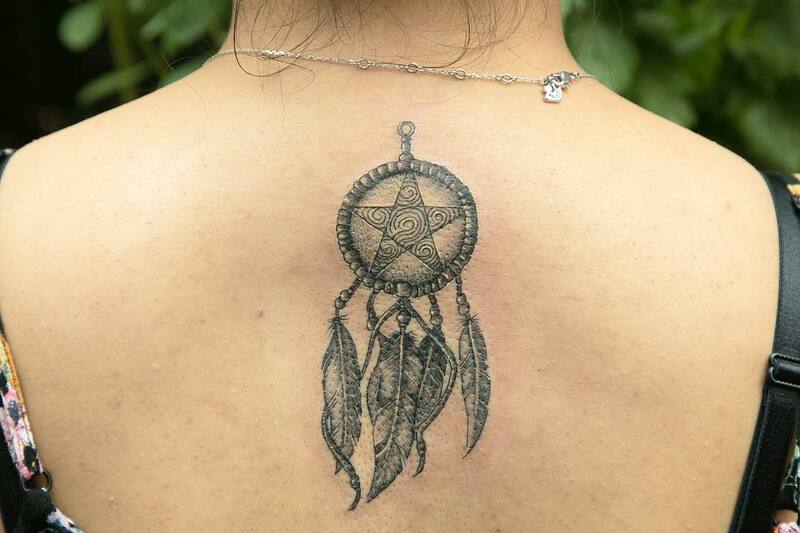 They use the dream catcher as a means of getting rid of negative energy and evil away from them. 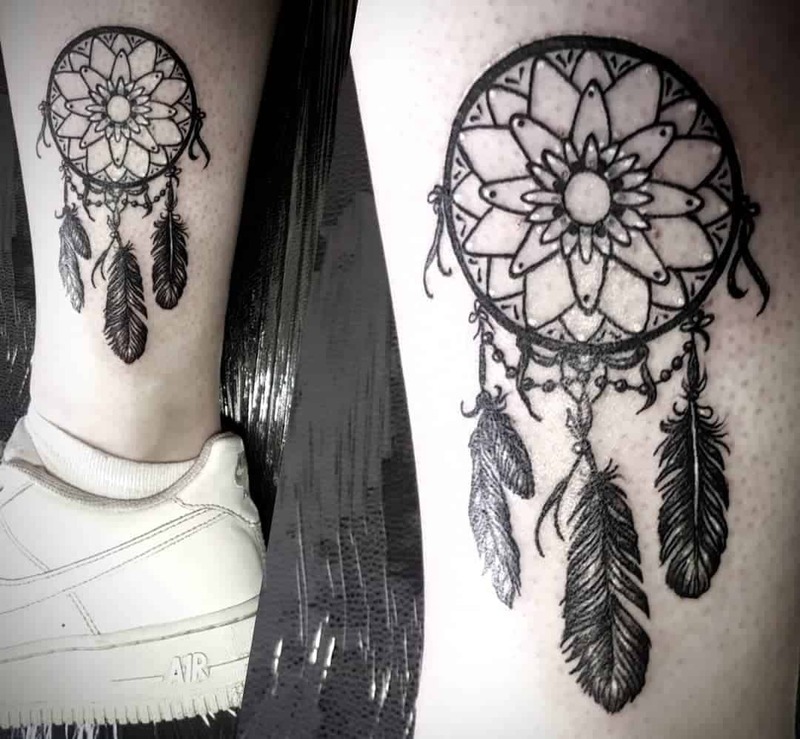 These dream catchers are meant to protect people from bad dreams or nightmares. The goal is to help bring not only good dreams into their mind but a peaceful mindset as well. This is another great style. 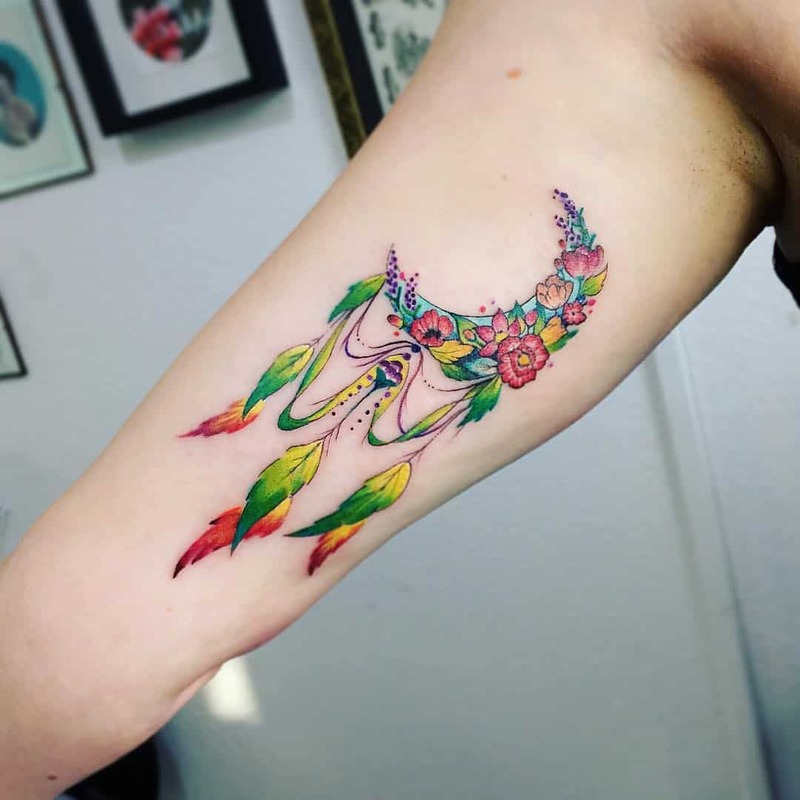 It’s a larger tattoo but we so love the colorful pieces in it. 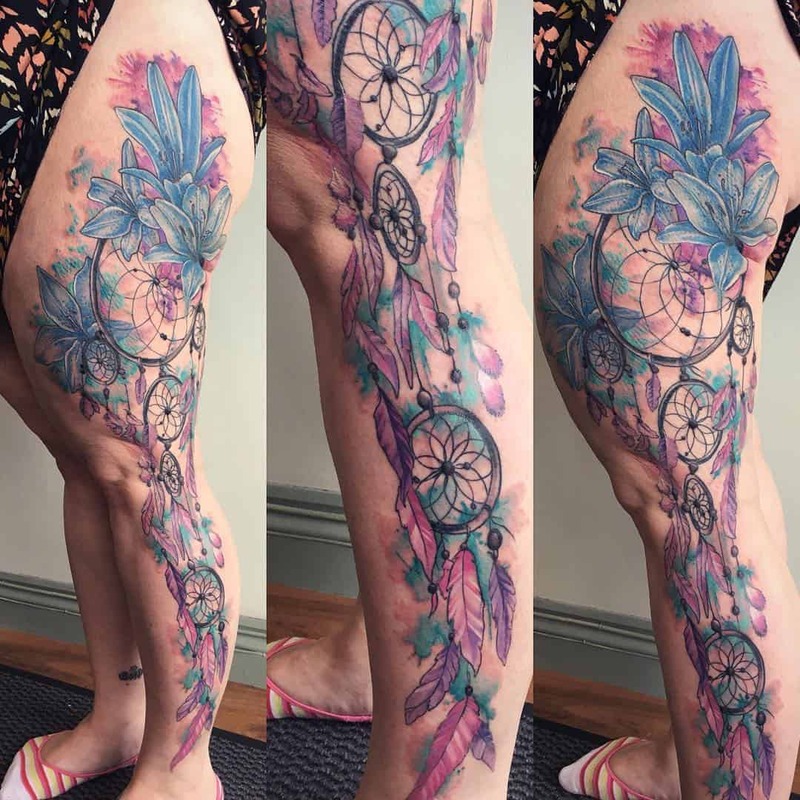 We have pink, purple and blue involved and it creates a stunning design that you can show off all the time. 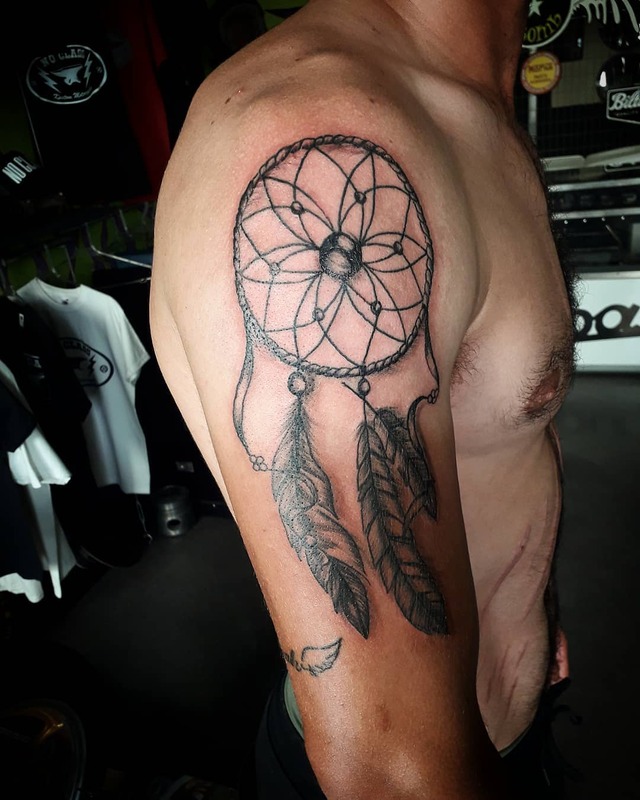 This large tattoo covers most of the back and this is a great example of the kind of a dream catcher tattoo that would be great for men. 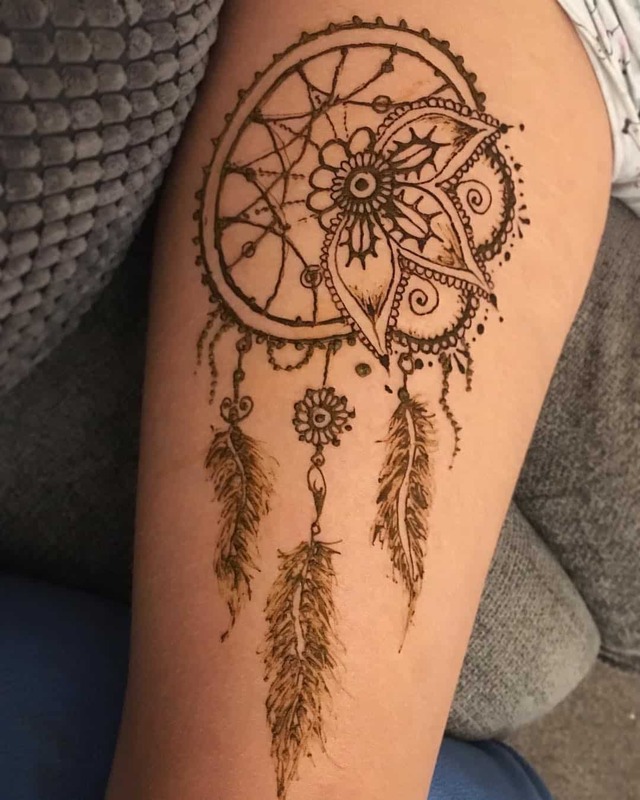 It’s a unique design and there are no feminine elements to it at all. 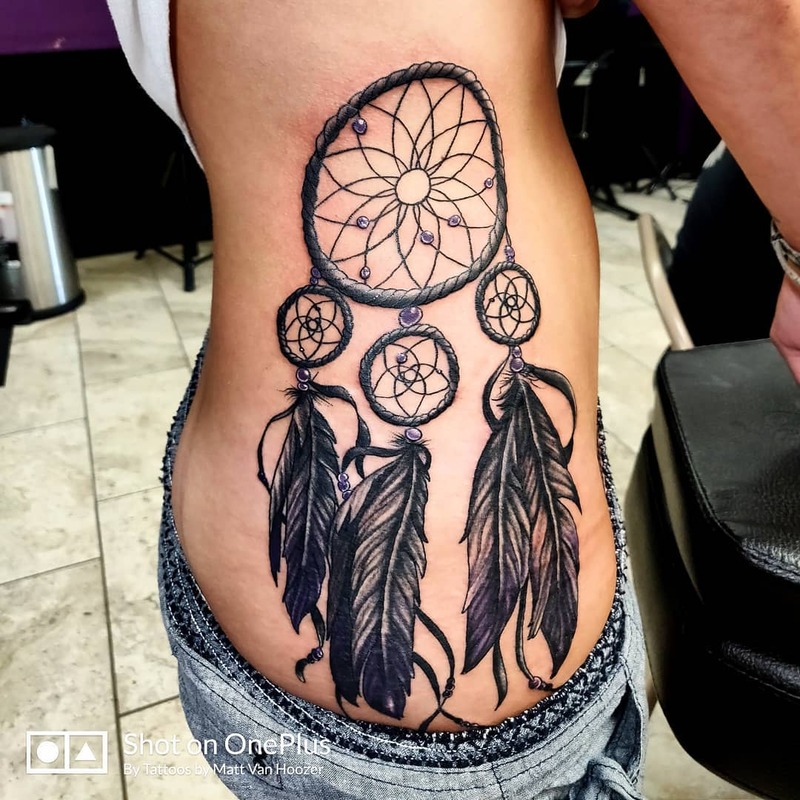 There are multiple dream catchers here and there are robust feathers. 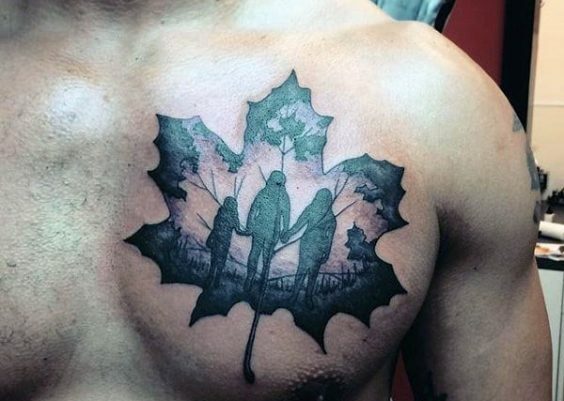 The tattoo is dark and mysterious which offers a man a more badass style. 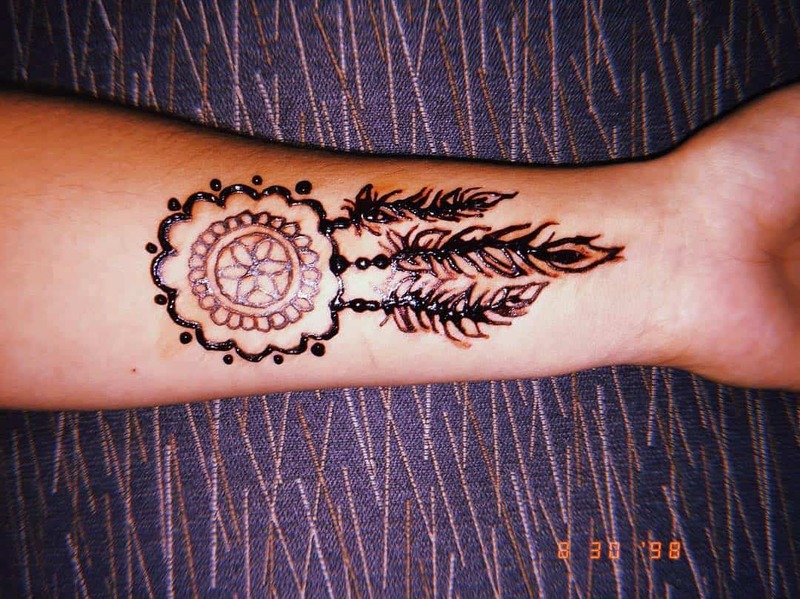 A simple style like this is all you need to represent your love for your cultural heritage. 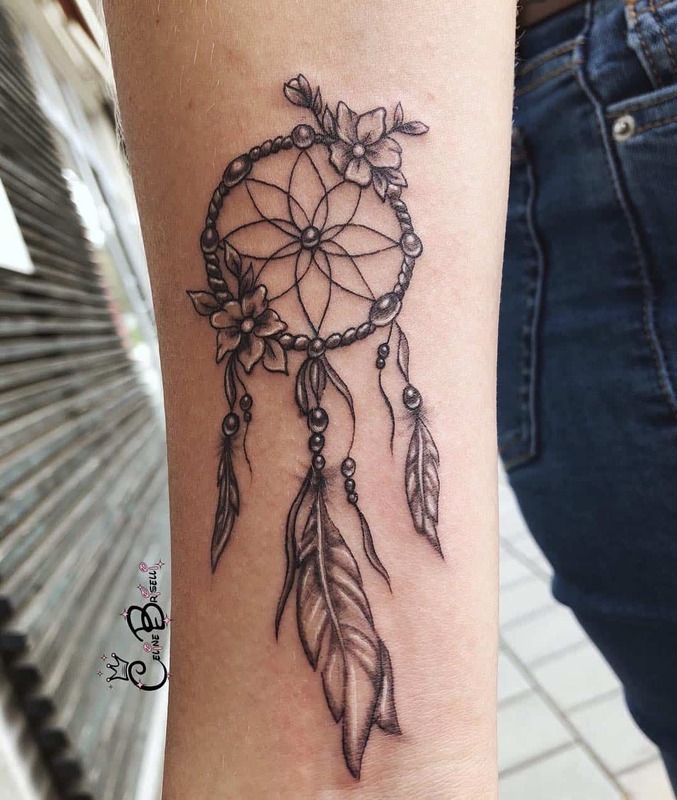 This style looks more like a bracelet that you wear along with you. 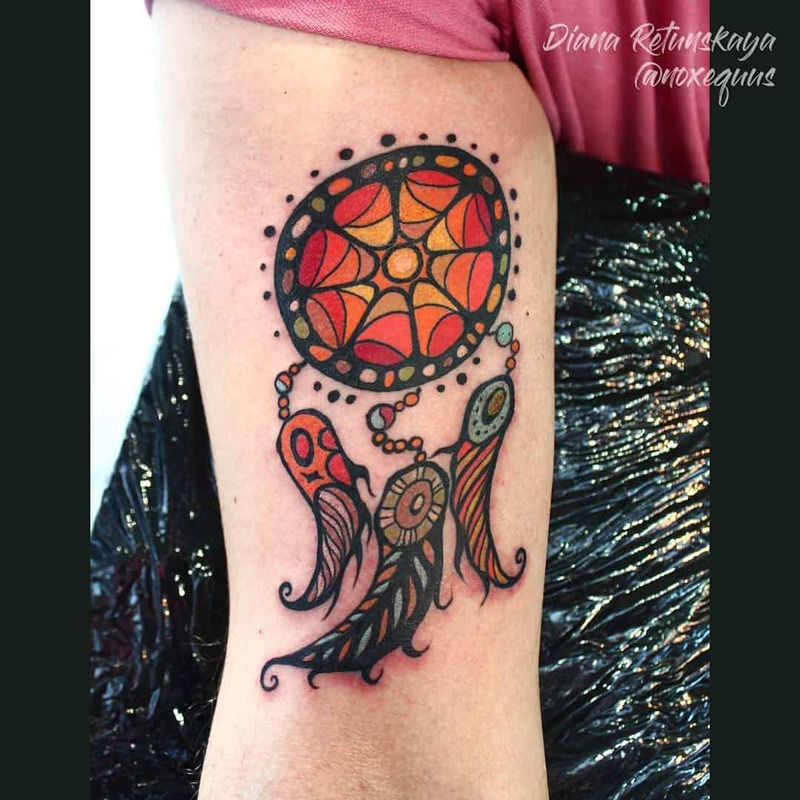 Another great sleeve design that has a large dream catcher with multiples dangling from it. 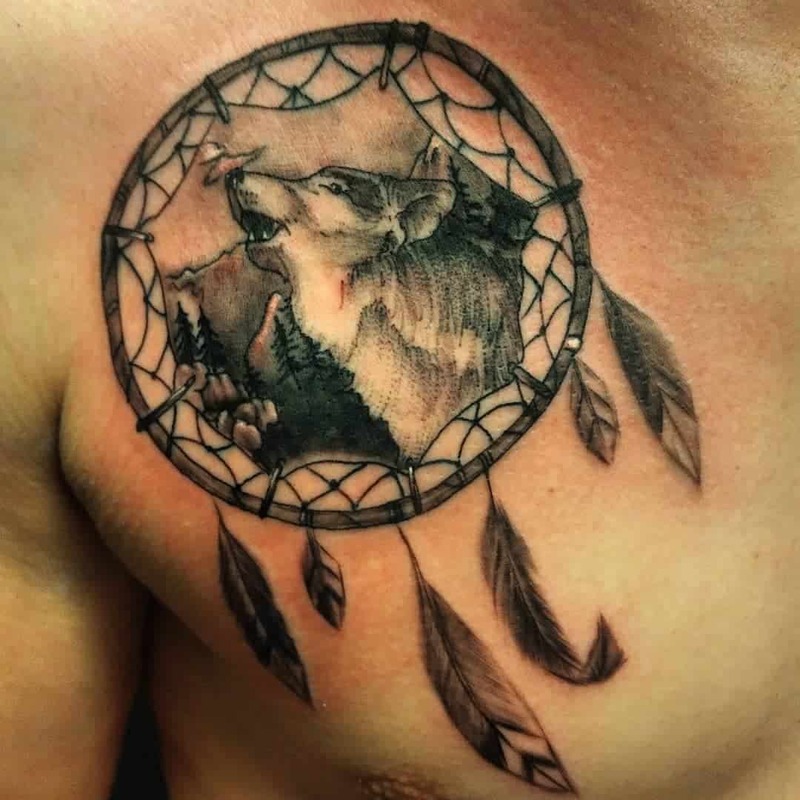 This is another great example of a dream catcher for men. 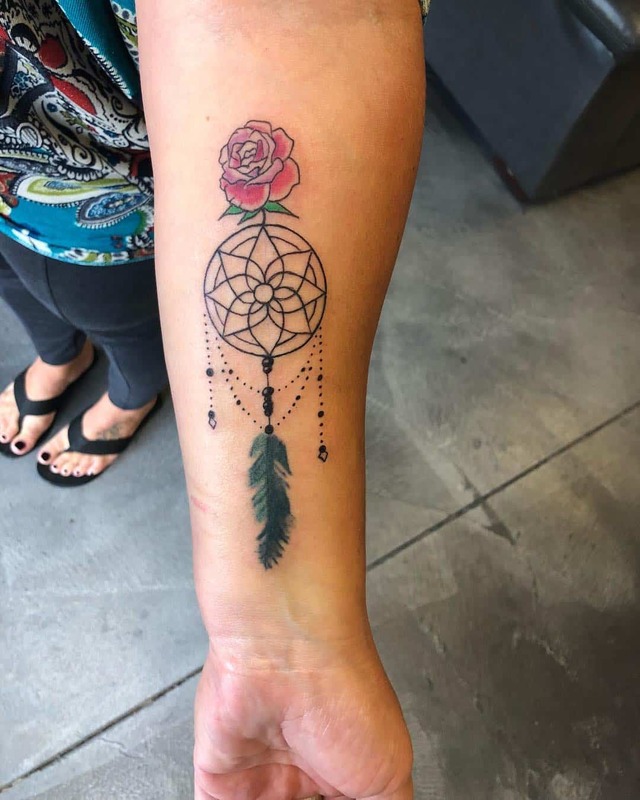 If you are looking for a simple design that is still lovely, then you can’t go wrong with this one. 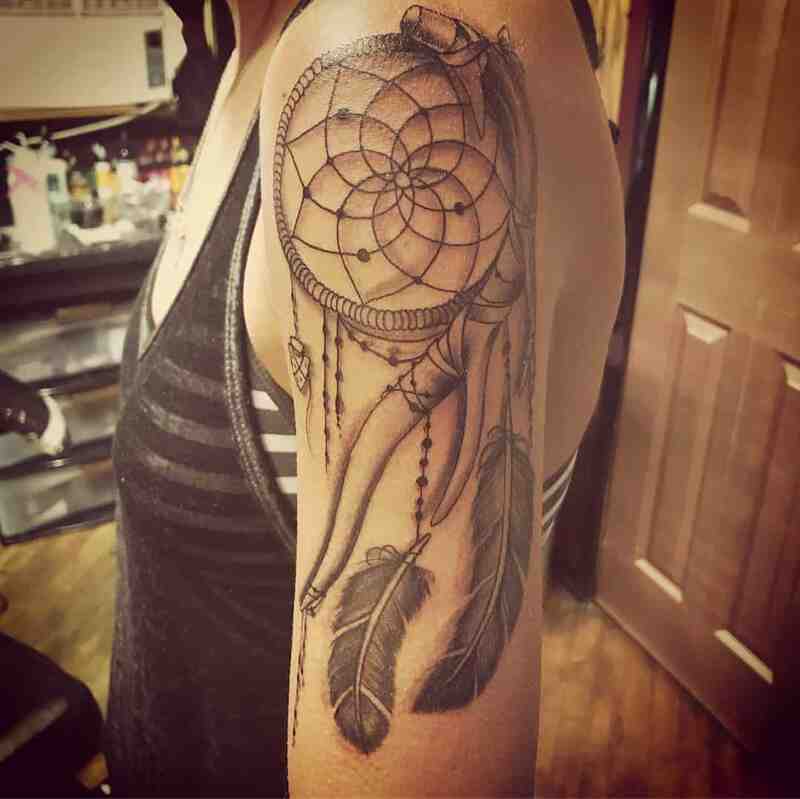 This is another great dream catcher tattoo for the arm that would be appealing to men. 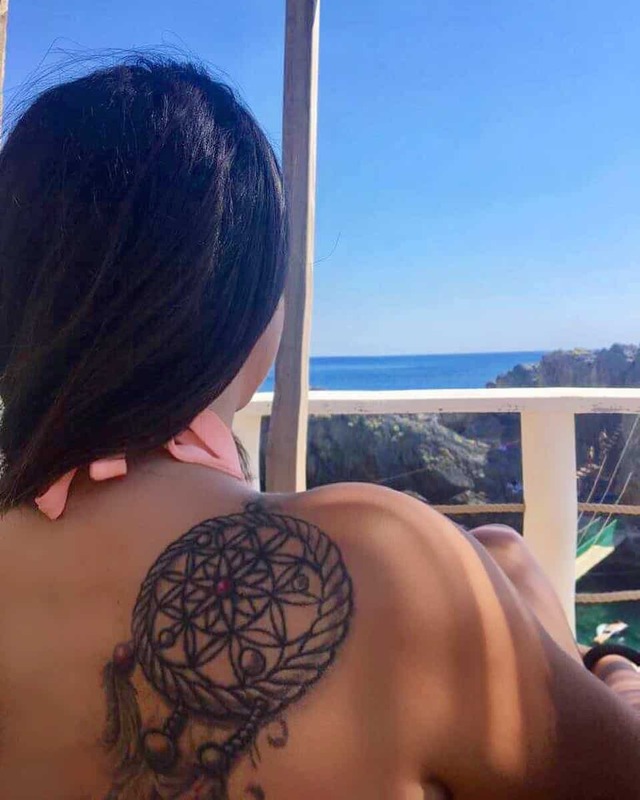 It’s not just a tattoo for women and as you can see here, it suits the area perfectly. 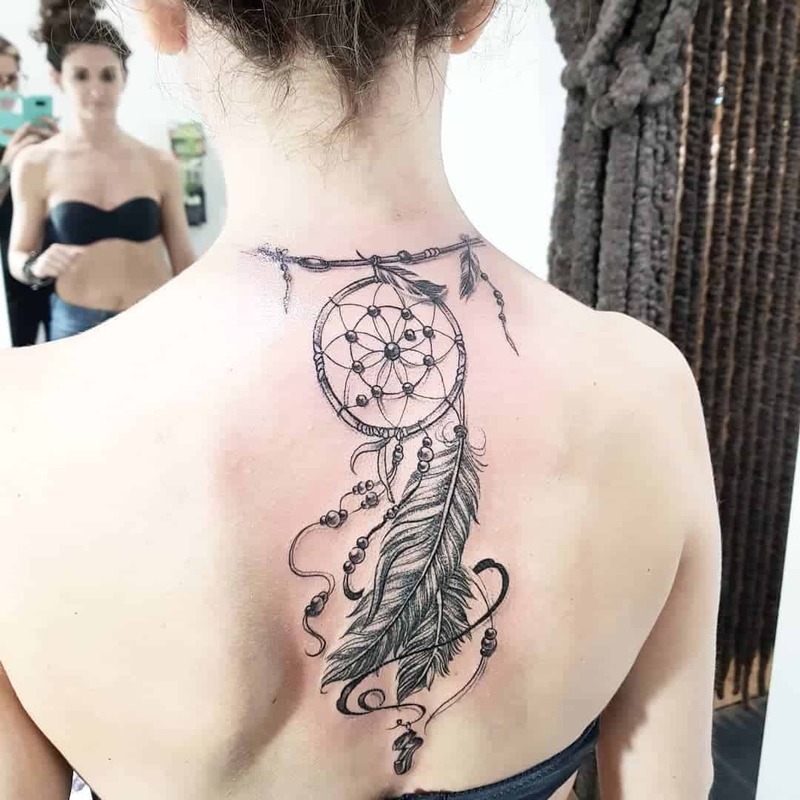 If you are looking for a different tattoo design, then you have come to the right place. 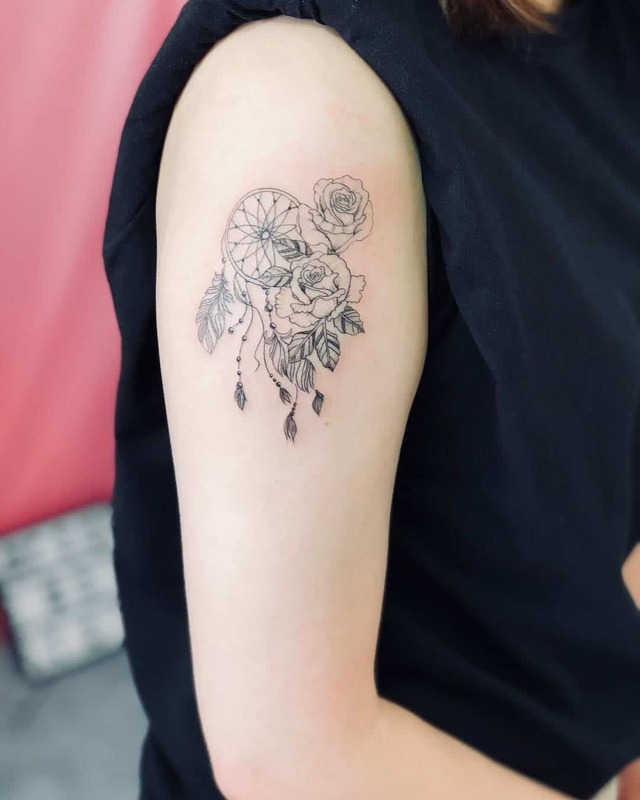 You can really add any kind of floral design to your tattoo and it will look great. In this case, it’s likely that daisies are her favorite flower and that’s why she chose it. The daisy is seen as a friendly flower and one that really goes with anything. We love the fact that there is an octopus or squid in this picture. 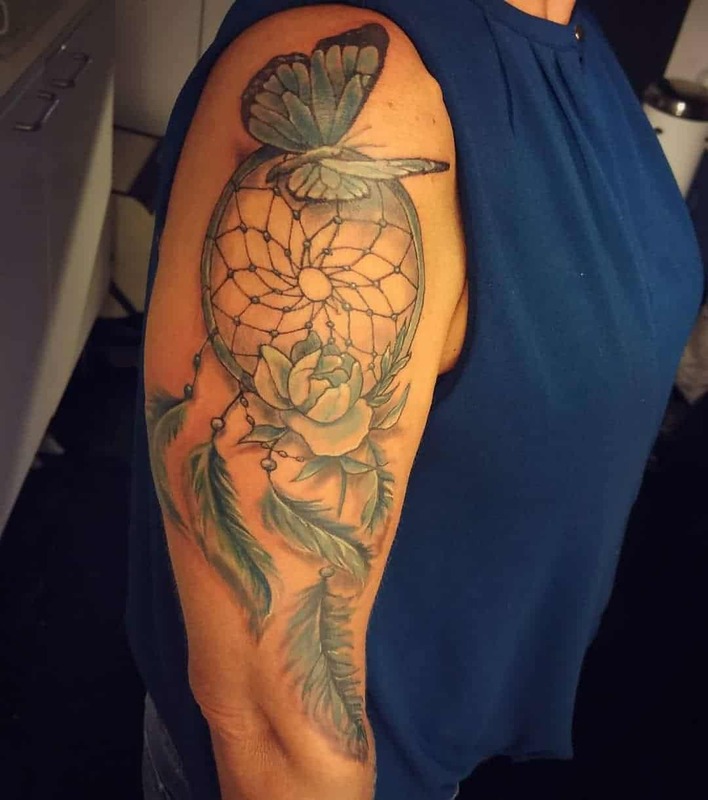 There is really unlimited options for what you can put with your dream catcher. 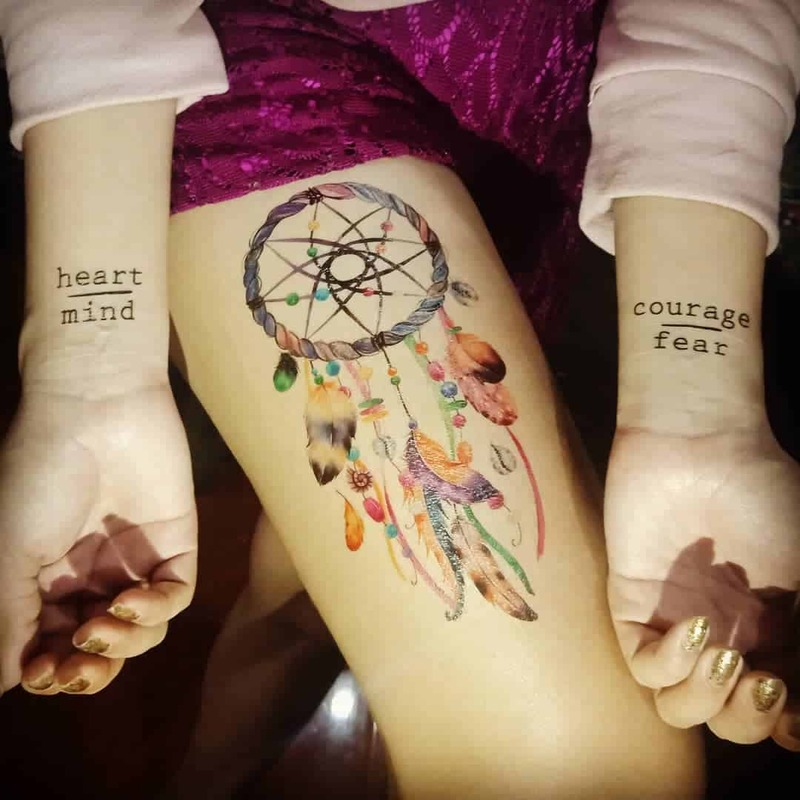 You can represent your passion in these styles and truly make the tattoo your own. 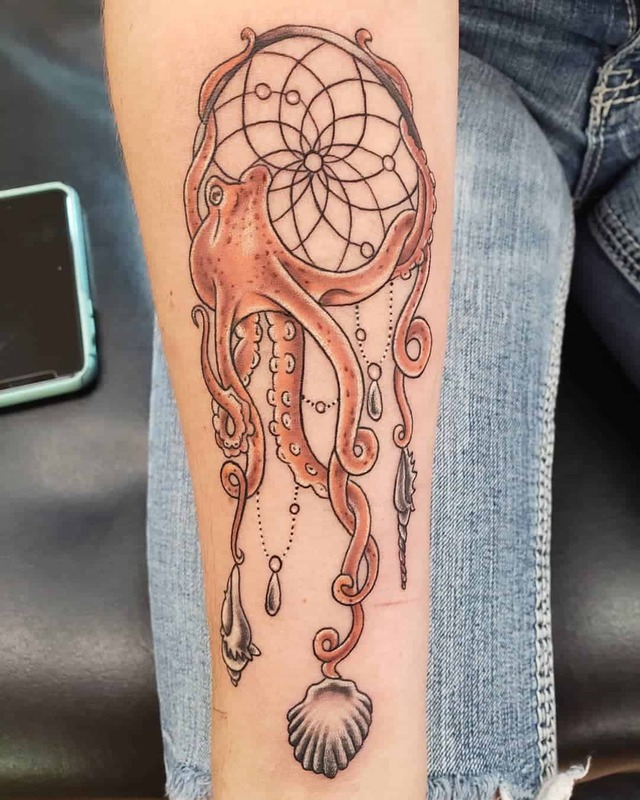 We would love to know the story behind adding an octopus to the mix. 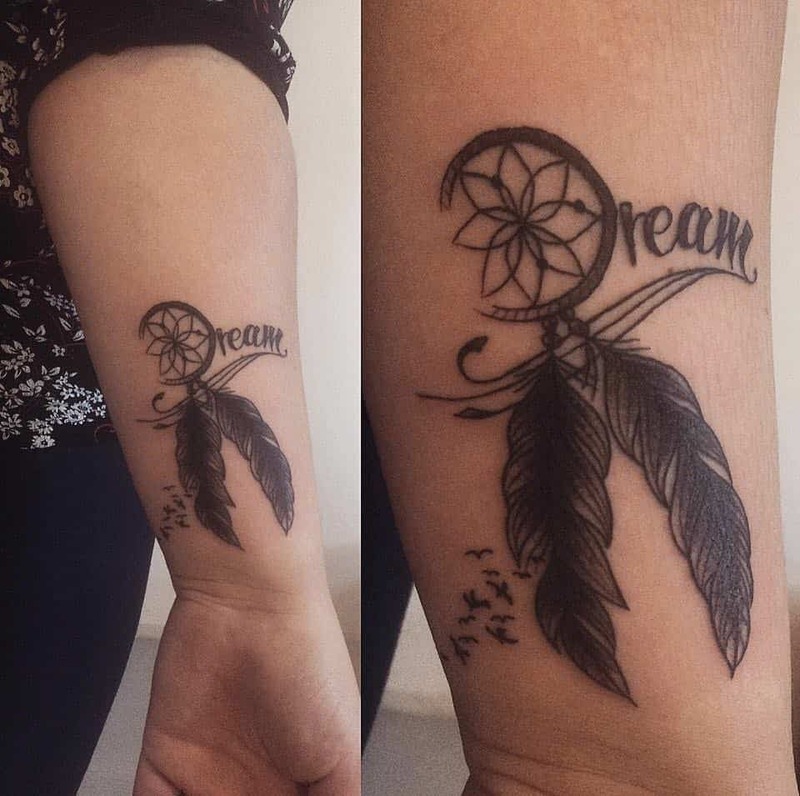 There are thicker lines with this tattoo which gives you a more distinctive look rather than an elegant one. 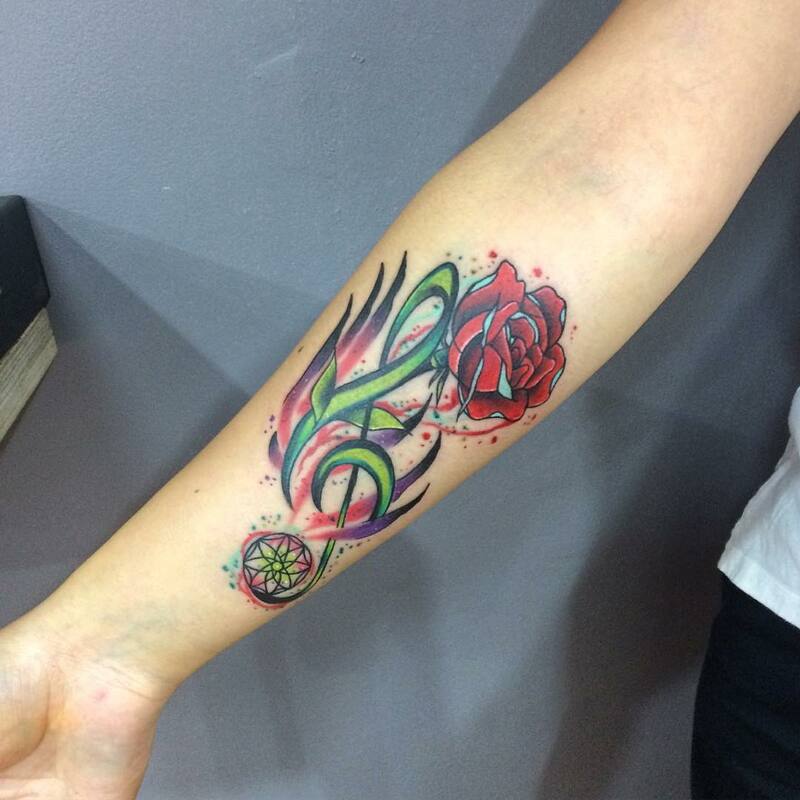 It warms up the whole style and puts an impact on the tattoo. 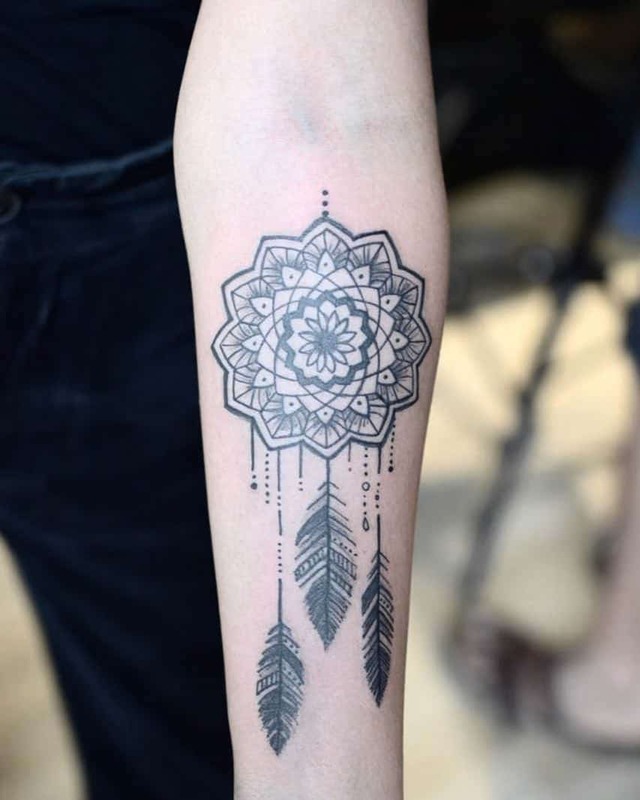 You don’t see magic and elegance with this tattoo but more like something you would see a warrior wear. 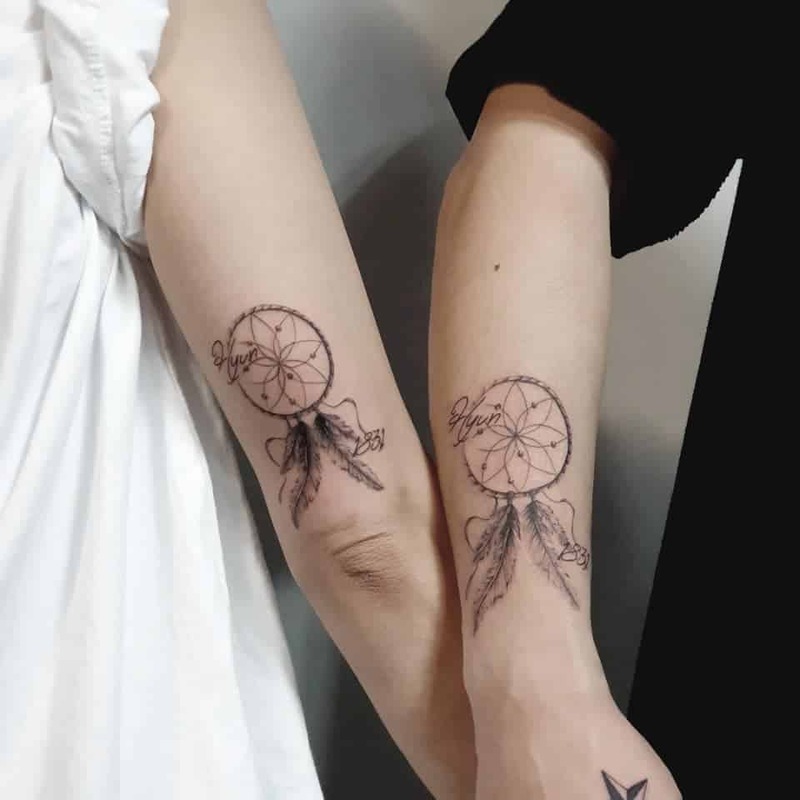 If you are looking for a cool new tattoo, then you have come to the right place. 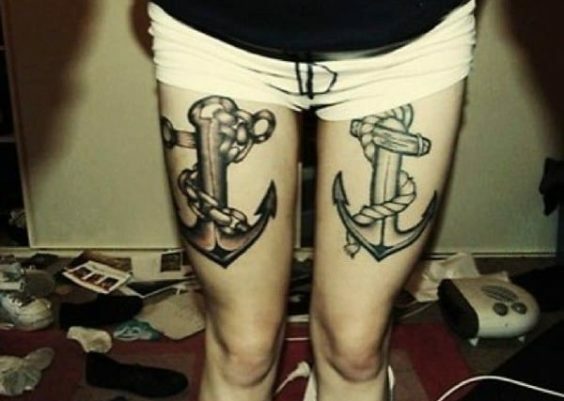 Even girls can have large tattoo designs and this is a great example of one. 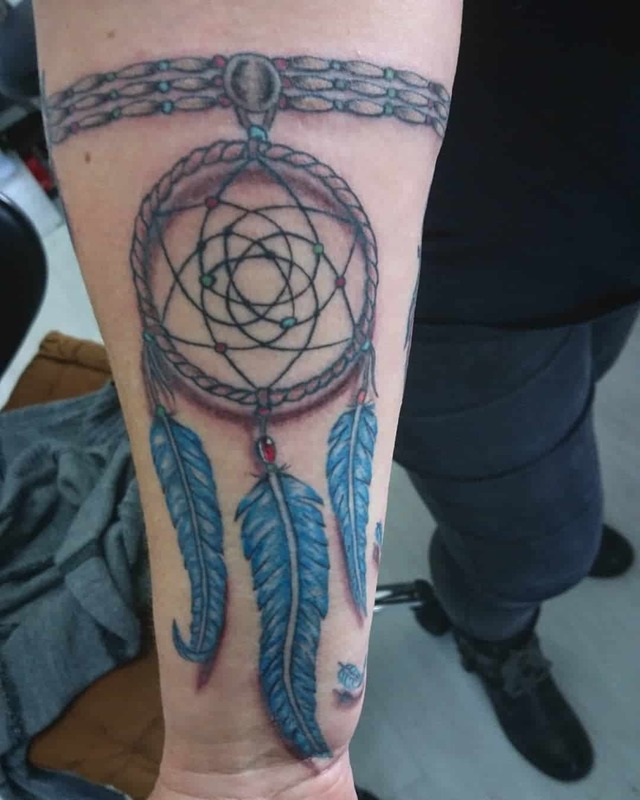 The dream catcher looks great on her arm as it’s both wide and long.